Each week, the USAHEC will highlight either an item from the collection or a piece of U.S. Army history with a short description, accompanied by one or two images. Items will include artifacts or archival materials from the USAHEC Collection, and pieces of Army history will cover a range of subjects and periods, but will tie to the current month. Check back weekly to learn more about the history of the U.S. Army, and the extensive and remarkable collection possessed by the USAHEC! Robert Jackson, United States Chief Prosecutor presents evidence to the courtroom during the Nuremburg Trials. October 1st marks the 71st anniversary of the end of the first Nuremburg War Crimes trial, which helped bring closure to World War II in Europe. Throughout the war, the leaders of the Allied forces discussed the possibilities of prosecuting Axis leaders for war crimes once the conflict ended. Because of the heinous actions of European Axis forces in their conduct of war, the Allies asserted the right to prosecute after the German surrender. The London Charter, signed August 8, 1945, formed the International Military Tribunal, which initially charged twenty-four senior officials of Nazi Germany for conduct which violated the laws of war. While indicted, Gustav Krupp von Bohlen und Halbach was declared medically unfit to stand trial for his crimes, and Robert Ley committed suicide before the trial began. 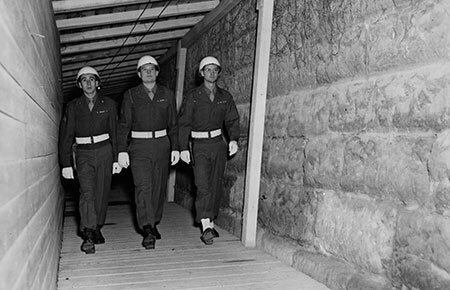 Sergeants George Cullette, Marvin Moebius, Guy Reppert Jr., prison guards, leaving the cell block area inside the walls of Nuremburg Prison. 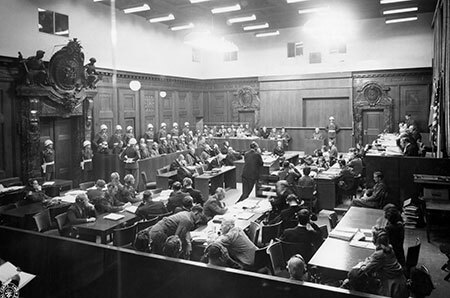 The first Nuremberg Trial was conducted from November 20, 1945 to October 1, 1946, when twelve senior leaders of the Nazi Regime were sentenced to "death by hanging" for their participation in war crimes. Two of the twelve sentences could not be carried out. Hermann Goering committed suicide the night before his scheduled execution, and Martin Bormann had been tried in absentia. The remaining ten war criminals were executed October 16, 1946. Whereas much has been written about the trials and the men themselves, less has been written about the 6850th Internal Security Detachment and its commander, who were responsible for the security of the Palace of Justice, where the trials were held, and of the prison within its walls. In May 1945, Colonel Burton C. Andrus was initially assigned by the Supreme Allied Commander, General Dwight D. Eisenhower, as commandant of a secret interrogation center in Mondorf-les-Bains, Luxembourg. Code-named "Ashcan," the interrogation center was located in the former Palace Hotel (well on its way to being stripped of its luxurious amenities when Andrus arrived). One by one, the captured senior officials of Nazi Germany arrived at the interrogation center. 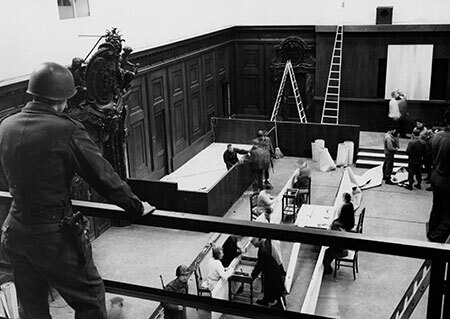 PFC Carl D. Sander oversees repairs to the courtroom inside the Palace of Justice, Nuremburg. Over protests from the Soviet Union, which wanted the trials to take place in Berlin, the Palace of Justice in Nuremburg was chosen for two main reasons: the building remained intact despite severe Allied bombing throughout Germany, and Nuremburg was previously the location of many propaganda rallies of the Nazi Party. On August 12, 1945, Andrus moved his notorious prisoners by airplane from Luxembourg to Nuremburg. To outsiders, the choice of Andrus, a cavalry officer by branch assignment, to be a prison commandant might have seemed odd, but he had some experience in prison and security work. Early in his thirty-five year Army career, Andrus served as a prison officer at Fort Oglethorpe, Georgia. 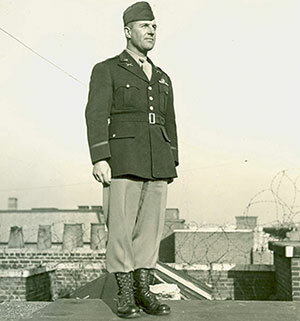 For two years during the early part of World War II, he served in various security and intelligence positions around New York City, which included security for the New York Port of Embarkation. Drawing on his earlier experience at Oglethorpe, Andrus went about establishing a rigorous security protocol for the prison. After Ley committed suicide on October 25, 1945, the security protocol was made even stricter. Each prisoner was now assigned a guard facing the cell door, so they were under constant observation. 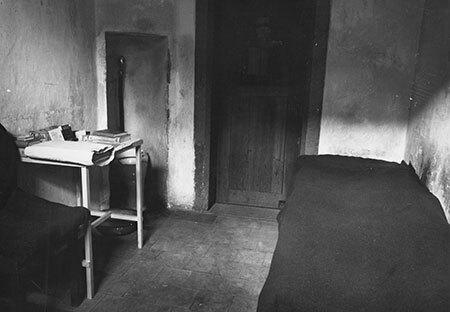 Cell within the Nuremburg Prison. Despite the fact that the spotlight of the world was on the mission of the 6850th Internal Security Detachment, the work of prison security was often thankless. The strain of the constant supervision of high-profile prisoners (who were often quite obstinate), strenuous duty hours (twenty-four hours on duty, twenty-four hours off), and the high turnover rate of personnel (which Andrus estimated to be over 600%) made the job that much more tedious. Throughout it all, Andrus demanded that the prisoners be treated with dignity, despite the actions for which they were charged. In one incident, Private First Class Joseph Traina was forced to use a blackjack (the 6850th's only weapon inside the prison walls) on Goering, when the German general attacked him. Throughout the event, however, Traina maintained his military discipline, using only the amount of force necessary to subdue Goering. 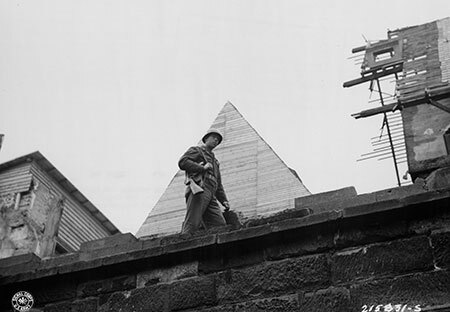 PFC Vaughn Owens patrolling the perimeter wall of Nuremburg Prison. On October 16, 1945, Andrus escorted the ten condemned men to the gallows. It was not something he took pleasure in, but did his duty as a Soldier. The USAHEC is honored to maintain the Colonel Burton C. Andrus Collection, along with images of the trials in the World War II Signal Corps Photograph Collection. Stop by the facility to learn more! We're going to need a bigger can of paint! A key component of the USAHEC's mission is to preserve the history of the Army, and this applies to everything - large and small. Inside the USAHEC buildings, archivists, curators, librarians, and historians work to care for many types of materials, including books, personal papers, photographs, audio visual items, weapons, and uniforms. Outside the building, the task of caring for items is bigger. Tons bigger! The macro artifacts on the Army Heritage Trail range from tanks to helicopter to weapons, and these objects are dynamic components of the USAHEC Collection. They allow visitors to the facility to better understand the size and impact of some of the most iconic pieces of Army history. Though these items are exhibited outside, they still receive regular care to ensure they are able to be displayed for years to come. They are cleaned and lubricated regularly, kept off the ground (via concrete pads), and are on a cyclic maintenance schedule for larger restoration actions, such as painting. 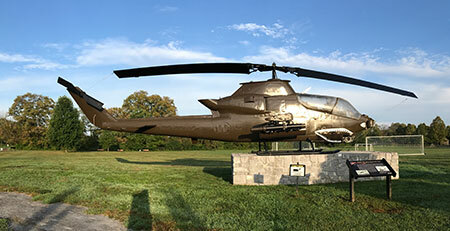 Two artifacts on the Army Heritage Trail recently were repainted, and afterward, reinstalled in their respective exhibit areas. The PAK 43/41, more commonly known as the "German 88," underwent refurbishment earlier this summer, and cleaning and painting of the AH-1G "Cobra" Helicopter was completed this week. Both artifacts are back on display, with interpretive signs to explain their role and significance in Army history. If you're in the area or passing through town, be sure to stop by to check out the newly refurbished artifacts! This upcoming Tuesday, September 12, marks the anniversary of the Battle of Baltimore, and the Americans successful defense of the city from British invasion. It began after British troops invaded and destroyed much of the nation’s capital in the late-summer 1814. A fleet of warships and troopships carrying British troops sailed into the Chesapeake Bay at the end of the August 1814, with the objective of capturing Washington, D.C. The city fell, and the battle demonstrated the weakness of the U.S. government's reliance on the states' militia citizen-soldiers to defend the capital, as most of the regular U.S. Army was fighting along the U.S.-Canadian border. After burning The White House, The Capitol, and other government buildings, the British withdrew from Washington, D.C., and targeted the city of Baltimore, Maryland. The disheartened forces who attempted to defend Washington, D.C., retreated to Baltimore, which came under attack in mid-September. Shortly after midnight on September 12, the British commander landed his troops and sent the warships to bombard Fort McHenry, which guarded the harbor. Baltimore's state commander, Major General Samuel Smith, mobilized its citizens, stiffened their resistance, and encouraged a brave and defiant attitude. General Smith coordinated manpower shortages and met the need for additional gun crews in the fort and nearby fortifications. General Smith sent forward a 3,000-man Maryland militia brigade, reinforced by Pennsylvania militia units, to confront the 4,500 British regulars moving towards the city. The two armies met outside the city on September 12, where the militia soldiers fought hard but were defeated and retreated to Baltimore. Smith fortified the approaches to the city, and the large number of defenders and strong defense convinced the British Army not to attempt a direct assault on Baltimore without the support of the fleet. One of the original bombs that was fired at the fort. The British fleet commenced firing on Fort McHenry on the morning of September 13. The defenders replied with their heavy gun from the fortified batteries, whose firing range and firepower kept most of the British ships away. 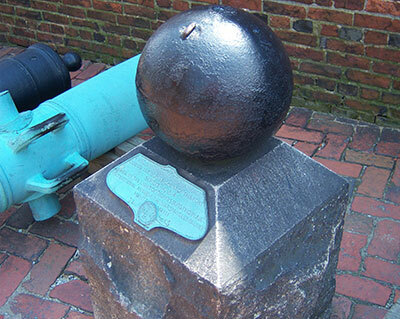 The British fleet was compelled to rely primarily on its bomb vessels to silence the fort's guns. 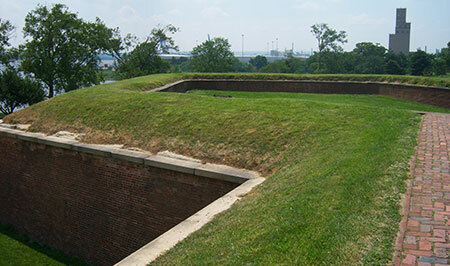 After firing for twenty-four hours, those vessels could not silence the fort. The British navy attempted a small-boat diversion but was forced to retreat, after receiving heavy fire from the fort and its supporting batteries. A night attack on land was cancelled, and the British army retreated to their ships. On the morning of September 14, the British ships stopped firing rockets and bombs. Further attacks on Baltimore were called off. General Samuel Smith's successful planning and deployment of his joint force of U.S. regulars, state militia, and U.S. sailors and marines defeated the advancing British Army and Navy. 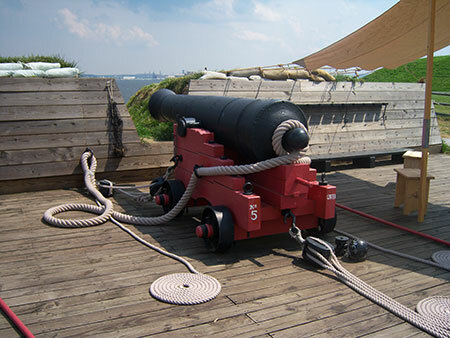 One of the original French made 36 pounder naval cannons still sits at Fort McHenry’s water battery. Today, the heroes of the Battle of Baltimore are recognized on Defenders Day every September 12, a Maryland state holiday. All Americans, moreover, honor those brave warriors, whose successful defense of Fort McHenry inspired Francis Scott Key to write our national anthem, "The Star Spangled Banner." Position of tank driver and gunner. All doors of tank open; turret door turned towards the front. Tank Corps. School. Near Langres; France. July 15, 1918. During the First World War (1914-1918), trenches covered the Western Front in Europe and forced a stalemate. Tank research, engineering, and experiments progressed, in hopes of ending the stalemate. 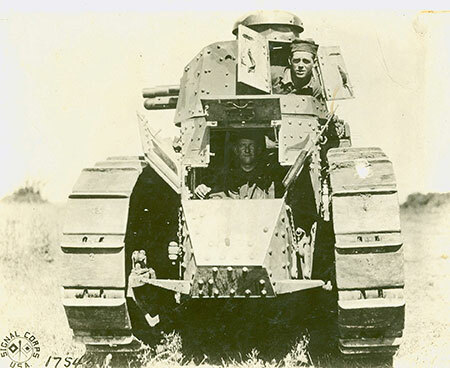 In 1915, British Lieutenant-Colonel Ernest D. Swinton of the Royal Engineers proposed the construction of a new armored car, based off the American Holt tractor. 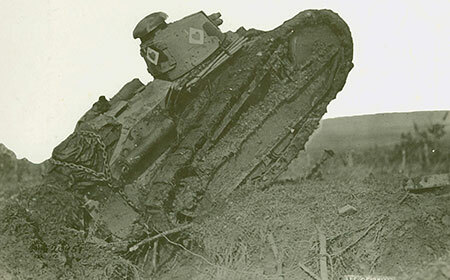 He used the past invention of the caterpillar chain system but needed to make a tank that could withstand driving over trenches and through the crossfire of No Man's Land. The idea was eventually proposed to Winston Churchill, then the First Lord of the Admiralty, who supported Swinton's proposal for the Armored Fighting Vehicle. Churchill wrote Prime Minister Herbert H. Asquith, "It would be quite easy in a short time to fit up a number of steam tractors with small armored shelters, in which men and machine guns could be placed, which would be bullet-proof. Used at night, they would not be affected by artillery fire to any extent. The caterpillar system would enable trenches to be crossed quite easily, and the weight of the machine would destroy all wire entanglements." As work on tank development progressed, the English feared discovery of the plans by Germany. Therefore, Churchill urged the creation of the Landships Committee for experiments supposedly relating to the Navy. Three Hundred and First Tank Battalion. America's heavies going into action at Souplet on the morning of October 17, 1918. Note Old Glory flying from the tank. St. Souplet, Nord, France. October 17, 1918. Churchill worked with William Tritton, the Managing Director of William Foster and Co., Ltd., of Lincoln, the firm that would produce the first tank. Together, they envisioned a tank that delivered the firepower, defense, protection, and mobility needed to cross the trenches in Europe. The "Tritton Machine" was first tested in Foster's yard on September 6, 1915: an important date in military history. The "Tritton Machine," which later became known as "Little Willie," was 31 feet-3 inches long, 13 feet-8 inches wide, 8 feet tall, and weighed 21 tons. The "Little Willie" tank included three different firepowers: the 6-pounder that fired 15 to 20 rounds per minute, the Madsen gun that fired 300 rounds per minute, and the Hotchkiss gun that fired 250 rounds per minute. After the trials of "Little Willie" and a few track adjustments, it was sent to France and used in the Battle of Cambrai in November 1917. It proved successful for the Allied forces against the Germans. Tank of Company C, 327th Tank Bn., 3rd Brigade, 1st Division, used in the offensive at Mont Sec and Lorraine. Corpl. George Heeszh, driver. Seicheprey, France. Sept. 12, 1918. Tank warfare introduced a new wave of technology for offensive and defensive distance fighting. Admittedly, "Little Willie" had to be modified because of its grand size and its need for more mobility, however, the introduction of the "Little Willie" tank opened a world of opportunity for warfare that is still prominent today among the Armed Forces of many nations. 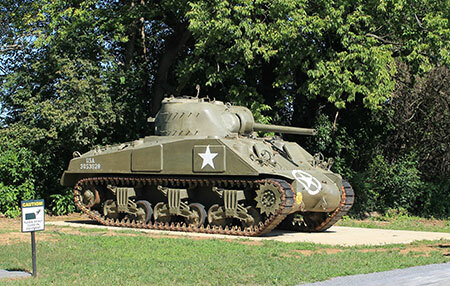 The USAHEC is home to a number of different tanks from various periods of history, including the Renault FT-17, an early tank example used at the end of World War I, and the legendary M4 Sherman, widely used by the Allies in World War II. These tanks are on display as part of both the indoor and outdoor exhibits, so if you're in the area, stop by and take a look at these pieces of history! 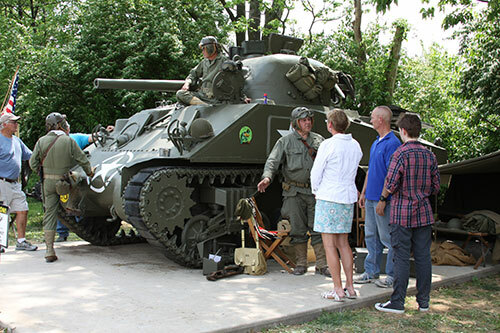 The M4 Sherman, widely used by the Allies in World War II is on display on the USAHEC's Army Heritage Trail. 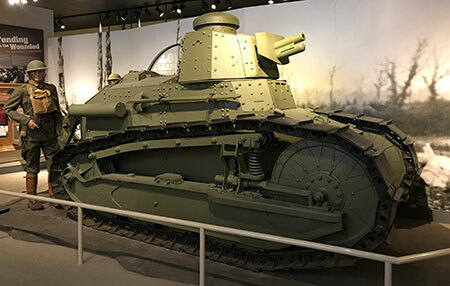 The Renault FT-17, an early tank example used at the end of World War I, is on display in the USAHEC's Soldier Experience Gallery. Second Lieutenant Bliss, 1st Artillery, shortly after graduation from USMA, ca. 1875. 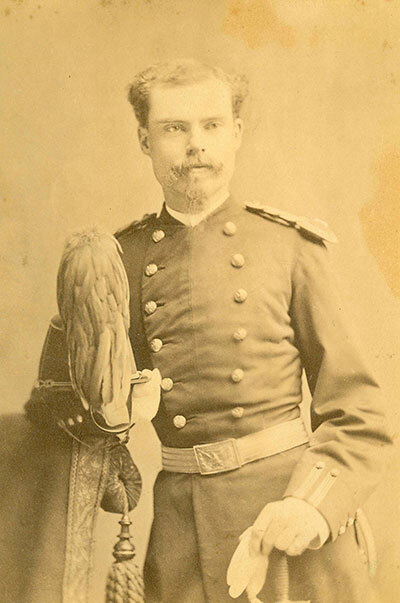 Tasker H. Bliss' long Army career began on September 1, 1871, when he was appointed to the United States Military Academy. While at USMA, he excelled in languages, mathematics, and tactics, and graduated eighth in his class on June 16, 1875. He received his commission as a 2nd Lieutenant in the 1st Artillery and performed routine garrison duties in Georgia and New York. Following that assignment, he served as an Assistant Professor of French at USMA from 1876 until 1882. In 1885, after duty in California and Virginia, Bliss returned to academia as an instructor at the Naval War College, which sent him to Europe to study their military schools. After his return to the United States in 1888, he was assigned to be Aide-de-Camp to U.S. Army Commanding General John M. Schofield, a recognition of his military and intellectual capabilities. In 1892, he was finally promoted to Captain, and assigned to special duty at the Office of the Secretary of War. Promotions were slow in the late 19th century Army, but war would change that. On July 2, 1897, the Army sent Captain Bliss to Spain, as the Military Attaché in the U.S. Legation. When the United States declared war on Spain in 1898, he was ordered to return to the U.S., where he was promoted to Major, and then to Lieutenant Colonel. Newly promoted Lieutenant Colonel Bliss was soon ordered to Santiago, Cuba, and then to Puerto Rico. Lieutenant Colonel Bliss arrived in Ponce, Puerto Rico, and was appointed as the Chief of Staff, 1st Division, I Army Corps, under Major General James H. Wilson. Ordered to Havana, Cuba in December 1898, Lieutenant Colonel Bliss served as Collector of Customs for the Island of Cuba and the Port of Havana, reforming a corrupt and inefficient service. He was also the President of the Commission to Revise the Cuban Tariff Treaty, and was on the Army War College Board to negotiate the treaty ratification in November and December 1902. 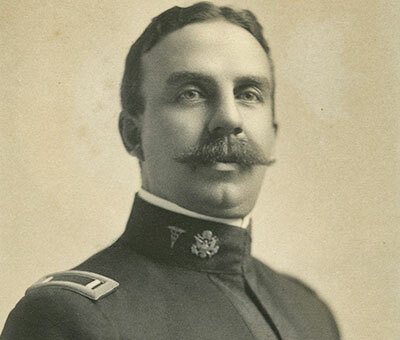 President Theodore Roosevelt promoted Lieutenant Colonel Bliss to Brigadier General, and on August 15, 1903, Brigadier General Bliss was appointed a member of the General Staff and President of the Army War College. Two years later, Brigadier General Bliss was ordered to the Philippine Islands to command the Departments of Luzon and Mindanao, to serve as Governor of the Moro Province, and to take charge of the Philippine Division. 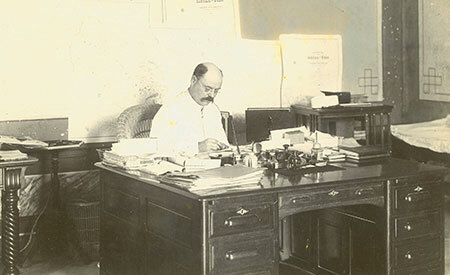 Lieutenant Colonel Tasker H. Bliss in white tropical uniform, at his desk while Chief of the Cuban Customs Service and Collector of Customs for Cuba and the Port of Havana, ca. 1899. Brigadier General Bliss was reassigned to the General Staff on June 19, 1909, and had another short stint as President of the War College. After command assignments at the Department of California, the East, and the South, he was promoted to Major General and assigned as Army Assistant Chief of Staff. In September 1916, he became Chief of Staff of the United States Army. Elevated to four-star grade in October of 1917, he was assigned as the American Permanent Military Representative, Supreme War Council, concurrent with the U.S. Army Chief of Staff position. He transformed the Army from a small peacetime establishment to a large war machine, and also ably defended American interests in Allied war councils. Retained on active duty beyond mandatory retirement age, he finally retired in May 1918, but still served as an American Plenipotentiary at the Paris Peace Conference into 1919. 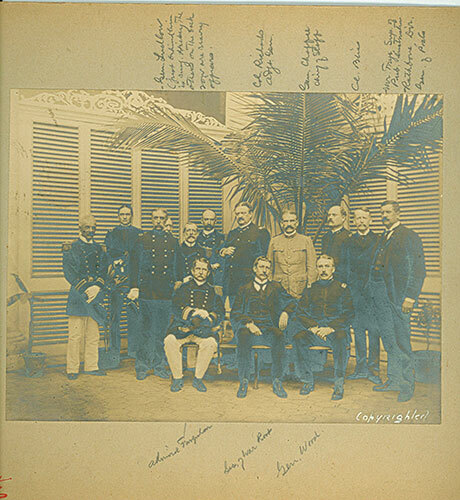 Staff of All Sections of the Supreme War Council with General Tasker H. Bliss in the Center, Bottom Row, ca. 1918. The distinguished soldier's duty was still not done, however, and in 1920, he was assigned as Governor of the U.S. Soldiers Home, Washington, D.C. The previous year, he presided over the forerunner of the Council on Foreign Relations, and he became an honorary member of the Council after it was founded in 1921. He died on November 9, 1930. Throughout his military career, General Bliss shines forth as a military intellectual, as a soldier-diplomat, and as a major military reformer, who helped implement the great changes that transformed the U.S. Army from a frontier constabulary in the 1800s into an effective force for carrying out American national strategy on the world stage in the 20th Century. 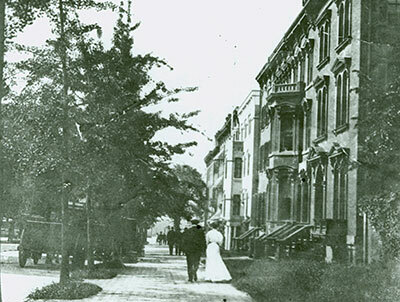 The USAHEC is home to an extensive collection of General Bliss' personal papers and photos covering his entire career, especially the period from 1871 to 1909. The Tasker Bliss Reference Bibliography, available by clicking on the blue box below, contains additional information about materials related to his service available at the USAHEC. Group Photograph of U.S. Navy Admiral Farquhar, Secretary of War Elihu Root, General Leonard Wood, General Adna Chaffee, Chief of Staff to Military Governor, Colonel Tasker H. Bliss (standing 3rd from right), and other officers during the First Cuban Occupation, ca. 1898. 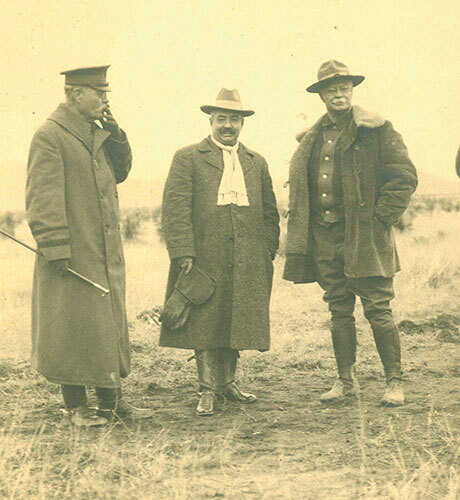 General Tasker H. Bliss (left), General Jose Maria Maytorena, and General Hugh Scott at the Mexican Border, ca. 1911. Major General William C. Lee, Commander 101st Airborne Division reviews his men, Camp Claiborne, Louisiana in activation day ceremonies. Wednesday marked the seventy-fifth anniversary of the activation of the 101st Airborne Division. In General Order Number 5 dated August 19, 1942, Major General William C. Lee, Commanding General of the 101st Airborne Division, declared that, "the 101st Airborne Division which was activated on August 16, 1942, at Camp Claiborne, Louisiana, has no history, but it has a rendezvous with destiny." Thus begins the storied history of one of the United States Army's finest combat divisions. The activation of the 101st and the re-designation of the 82nd as airborne divisions were the culmination of the U.S. Army's efforts to establish airborne operations. Even though the idea of using airborne troops had been around since World War I, the U. S. Army did not fully embrace the idea until the Soviet Union and German Armies began to develop their airborne operations during the 1930s. The successful use of airborne tactics early in World War II by the German Army spurred the U.S. Army into action. 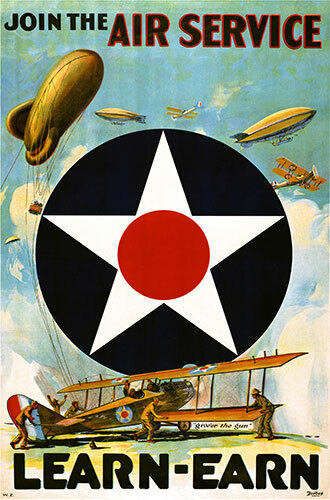 On June 25, 1940, the Parachute Test Platoon was formed at Fort Benning, Georgia, to experiment with the potential use of airborne troops. On August 16, 1940, the first American Soldier jumped successfully. Two years to the day after the jump, the 101st Airborne Division was activated to develop division-level airborne warfare tactics. During and since World War II, the 101st has answered MG Lee's call to service. In WWII, the 101st first participated in combat during D-Day operations on June 6, 1944. The Division went on to distinguish itself during multiple campaigns, but is especially known for its defense of Bastogne, Belgium, during the Ardennes Campaign. The 101st culminated its WWII service capturing Adolph Hitler's famed "Eagle’s Nest" mountain retreat in Berchtesgaden, Germany. The U. S. Army reconfigured and enhanced its capabilities since WWII, and the 101st evolved along with it. In 1956, the 101st became the first pentomic division, the United States Army's organizational answer to the growing nuclear threat present in the world. 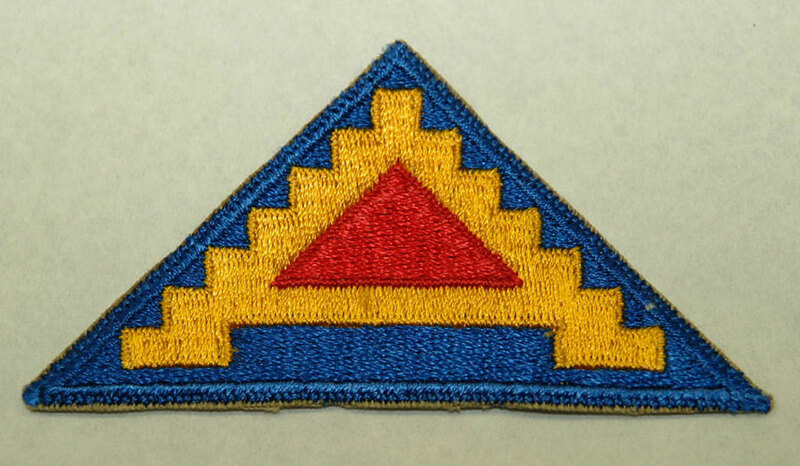 In September 1968, the 101st was redesignated the 101st Airmobile Division to conduct jungle operations in Vietnam. Again, the 101st distinguished itself in battle in the A Shau Valley, Dak To, Dong Ap Bia Mountain (Hamburger Hill), and Tuy Hoa. 101st Airborne Division's World War II mascot, Young Abe, Fort Bragg, North Carolina. In 1974, the 101st was redesignated the 101st Airborne Division (Air Assault) and has maintained that designation to the present day. In 1991, during Operation Desert Storm, the Division was called upon to fire the first shots of the operation, taking out Iraqi radar stations on the border between Saudi Arabia and Iraq. Throughout operations in the Global War on Terror, the 101st continued its long tradition of excellence in battle in places such as Mosul, Kirkuk, Diyala Province, and the Al Anbar Province. Each year, the 7th of August marks Purple Heart Day, and the nation recognizes the heroic men and women serving in the United Stated Armed Forces', who been wounded or killed in enemy action. The Purple Heart is the United States' oldest, known military decoration currently in use today, and it has its roots in the American Revolution. 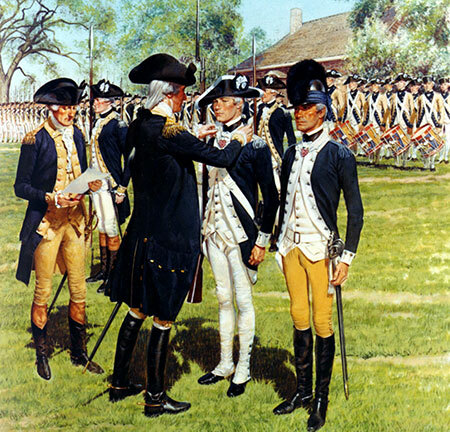 Gen. George Washington established the Badge of Military Merit on August 7, 1782 in Newburgh, New York. European armies of the 18th century typically gave high-ranking officers awards for victories, but Washington intended this new decoration to recognize common Soldiers and non-commissioned officers for both singular acts of gallantry and service to the Continental Army. He felt strongly that recognition in this young Army open to all would mirror the new nation’s revolutionary ideals, and the first recipients of the Badge of Military Merit were three sergeants. After the War, use of the decoration was abandoned and no further awards are known. The Army, then still the War Department, restored Washington's award on the 200th anniversary of his birthday on February 22, 1932, and it was now known as the Purple Heart. Five months later on July 21, 1932, Gen. Douglas MacArthur, who had also been involved with its reinstatement, became the first recipient. As in Washington's day, the award recognized both singular acts and service, but it also added Soldiers wounded by the enemy. This reinstated Purple Heart award, approved only for Army Soldiers and prohibited from posthumous presentation, replaced wound and war service chevrons offered during World War I. Over 78,000 veterans of World War I, who met these criteria, received the Purple Heart between 1932 and the beginning of World War II. Some surviving Veterans of the Civil War, Indian Wars, and the Spanish-American War also received the Purple Heart after 1932. 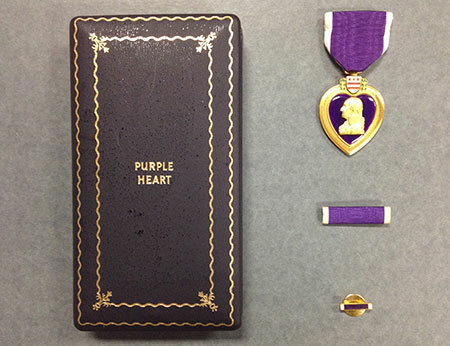 World War II brought several modifications to the Purple Heart. The Army changed policy in September 1942, authorizing awards strictly for wounded, not specific acts, but also killed in action. Three months later, President Franklin D. Roosevelt extended eligibility to all branches in the U.S. Armed Forces serving in World War II, including posthumous awards from December 7, 1941 and civilians. Roughly 960,000 Americans received the Purple Heart in World War II. In November 1952, during the Korean War, President Harry S. Truman retroactively extended the Purple Heart to all services during World War I, since the previous extension had only covered World War II. Over 137,000 American service members in the Korean War received the Purple Heart. 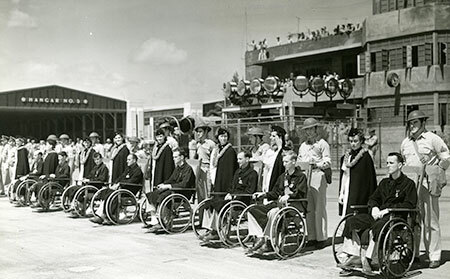 Hickam [Pearl Harbor] survivors, with Army nurses in attendance, who were awarded the Purple Heart Medal, shown on the runway at Hickam Field. April 1942. President Ronald Reagan extended eligibility for the Purple Heart on February 23, 1984 to service members and government civilians wounded during international terrorist attacks, as well as participants in international peacekeeping. In the 1990s, Purple Heart eligibility extended to POWs prior to 1962, but once again restricted solely to military personnel. Over 57,000 American service members have received the Purple Heart since the Vietnam War. Most are for service in the wars in Afghanistan and Iraq. A member of the Seventh Infantry Regiment, Third Division, is being given blood plasma by Pfc. 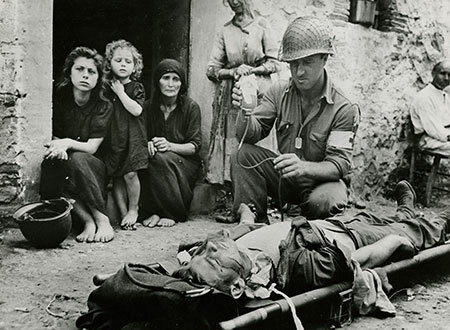 Harvey White, after he was wounded by shrapnel, on 9 August 1943, in Sicily. The Purple Heart is a symbol of honor and sacrifice on the battlefield. Estimates vary, but approximately 1.76 million Americans have received the Purple Heart since its inception. The Purple Heart ranks above all Meritorious Service Medals in precedence for personal military awards since 1985. True to Washington's original intent, the Purple Heart recognizes the Soldier writ large and demonstrates the thanks of a grateful nation to all its military personnel. In the annals of American military history, Lord Cornwallis's surrender at Yorktown to the Continental Army still stands as one of the U.S. Army's defining historical moments. George Washington utilized all of his military experience (experience he gained in the woods of western Pennsylvania in the 1750s) to push one of Britain's greatest generals to the sea. While the Battle of Yorktown may serve as an important milestone, it was the military experience Americans gained during the French and Indian Wars period that helped prepare them for revolution. One such educational event occurred across two hot August days in 1763, when the British crown was forced to quell another rebellion. Deemed Pontiac's War by 19th century historians, this conflict was conducted by an adversary who often operated unseen, used the available terrain to their advantage, and intimidated their enemy with their purported "savagery." 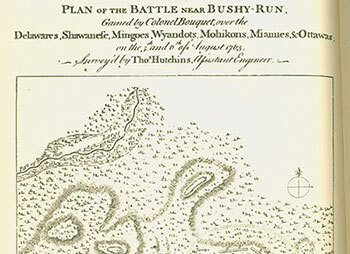 On August 4, 1763, Colonel Henry Bouquet left Fort Ligonier anticipating an attack from Indian forces. He predicted that he would encounter the enemy near Turtle Creek and decided to move at night to try to avoid the enemy. He never made it. As the mixed army of Highland and Royal American troops, Virginia "woodsmen," and pack horse drivers crested Edge Hill on their way to what was left of Bushy Run station, they were attacked from the hill to their front. Colonel Bouquet ordered two companies of the 77th Regiment's light infantry, a relatively new concept of highly mobile troops, to push the Indians from their superior position. As the day turned to night, the small army had more than 50 casualties, and they were without water for horses or men. Bouquet pulled his troops back to Edge Hill, quartered his wounded in a defensive position made from flour bags, and awaited the Indians to renew their attack at dawn. Not to disappoint their adversary, the Indian forces, primarily Delaware, Shawnee, Western Seneca, Mingo and some Ottawa, renewed their persistent fire and probing forays around the small army's circular defenses the following morning. By mid-afternoon on August 6, Bouquet's position was becoming increasingly precarious. Without water, running low on ammunition and with an increasing casualty list, Colonel Bouquet ordered two companies of light infantry at the front of his defenses to withdraw. The withdrawal created the illusion of a retreat and opened a controlled area of Bouquet's line. The Indian forces fell for the ruse and moved into the void with a heavy fire. Bouquet had ordered his grenadiers and the company of American woodsmen, or rangers, to his left flank to protect his supply train. Just as the Indians "thought themselves masters of the camp," Bouquet moved up two companies in support, closing the gap, while the grenadiers and rangers moved out from cover and laid down a devastating supporting fire. The action broke the back of the enemy. Days later, Bouquet's army marched in to relieve the besieged Fort Pitt (present-day Pittsburgh, Pennsylvania). The following year, Colonel Bouquet wrote a paper called, Reflections on War with the Savages in North America. In it, he acknowledged that American provincials and woodsmen were best suited for woods warfare. Eighteen years later, along the York River in eastern Virginia, that same collection of backwoodsmen and farm boys proved themselves masters of more conventional warfare, as well. This week marks the 69th anniversary of President Harry Truman's order to integrate the United States Armed Forces. He signed Executive Order 9981 on July 26, 1948, which declared "that there shall be equality of treatment and opportunity for all persons in the armed services without regard to race, color, religion or national origin." 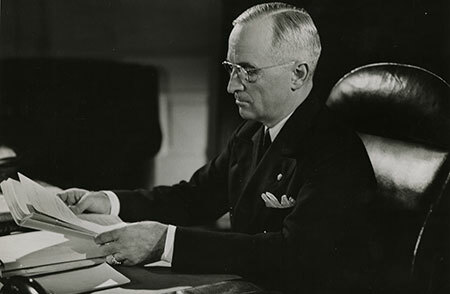 President Truman directed the policy be enacted as quickly as possible, and the military went to work figuring out the best way to integrate its troops. African Americans have a long history of defending the United States, dating to before the nation even formed. Initially, they fought in integrated units, but that changed after the War of 1812. African Americans continued to serve in the military, but did so in segregated units through the Civil War, World War I, and World War II. Though segregated, African Americans still made major contributions to American military history, and segregated units such as the 54th Massachusetts, the Harlem Hellfighters, and the Tuskegee Airmen are known for their dedication, courage, and achievement. Though slow, efforts toward equality advanced as units distinguished themselves on the battlefield and in support roles on the homefront. 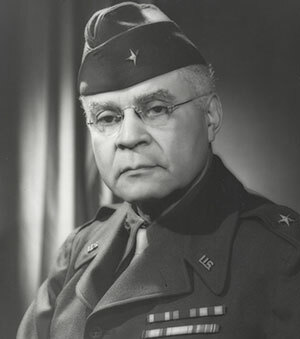 Just prior to the start of World War II, Brigadier General Benjamin O. Davis became the first African American general officer. He was promoted on October 25, 1940, and was influential in the proposed policy of integration using replacement units, a policy eventually enacted during the Korean War due to high causality rates. Army leadership saw the success of this action during the early part of the Korean War, and in July 1951, the U.S. Army formally announced its plans to desegregate, three years after Truman issued Executive Order 9981. The USAHEC is home to many pieces of African American Soldier history, from both before and after the integration of the Armed Forces. The USAHEC Collection includes a fragment from the 54th Massachusetts Volunteer Infantry Regiment national colors, images of African American WAAC/WACs providing support in World War II, the history of African American Soldiers' contributions in World War I, oral histories from Soldiers who served in the Vietnam War, and artifacts and archival items from Brigadier General Benjamin O. Davis. These materials are utilized in exhibits at the USAHEC, and in other museums around the country. Currently, some of Brigadier General Davis' materials are on display at the Smithsonian National Museum of African American History and Culture. Stop by the USAHEC to learn more about the service of African Americans and the integration of the Armed Forces! Upon promotion to brigadier general, Davis received congratulatory wishes from all over the country, including hundreds of telegrams like this one. The U.S. Army Heritage and Education Center is an incredibly diverse organization, with an expansive mission. Each component of the USAHEC specializes in a particular field, and employees use their expertise to protect, preserve, and make available hundreds of years of U.S. Army history. Part of the Collection Management Division, the USAHEC's two conservators are charged with monitoring the condition of the collection and providing treatment to materials. The conservators assess incoming donations, as well as items already in the collection, to ensure they’re stable and ready for long-term preservation. USAHEC's conservators work on artifacts and archival materials, and recently, spent time evaluating the condition of Soviet propaganda posters from World War II. During World War II, the Soviet Union conducted a home front propaganda campaign in the form of window posters. These posters were meant to rally support and boost the morale of the Soviet people. Beginning in 1941, a new propaganda studio, TASS, gathered together well known Russian artists and poets, and created over 1500 window posters from 1941-1945. Each artist created a painting, and these paintings were then divided into sections and a stencil was made for each color of every section. The stencils were distributed to volunteers who recreated each section, color by color, up to 600 times. After stenciling, the sections were glued together and caption strips (written by poets or gathered from newspapers or speeches) were added to create the completed poster. Posters hung in windows of shops, administrative buildings, workplaces, and even outside. 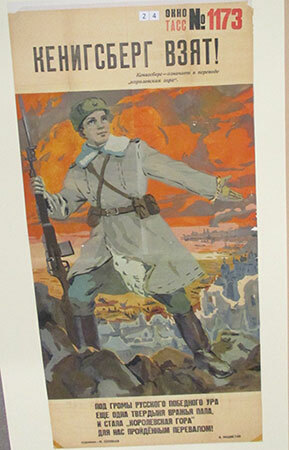 Some posters were shipped to cultural centers in allied nations to boost support for the Soviet war effort. The USAHEC has a collection of 105 Soviet TASS window posters that were donated to the museum in the 1970's, and the conservators recently conducted a condition assessment of this collection. The assessment began with measuring and photographing each poster, after which the assessment team analyzes the construction of each poster and evaluates the condition looking for damage, staining and previous repairs; these are all noted and photographed. 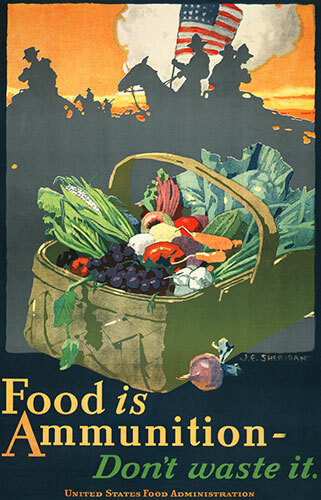 Each poster is then given an overall condition rating of excellent, good, fair or poor. Posters in need of rehousing are rehoused before being returned to storage. This condition assessment helps the USAHEC gain further understanding of this valuable collection, while also determining the conservation needs and informing decisions regarding future exhibitions of these posters. 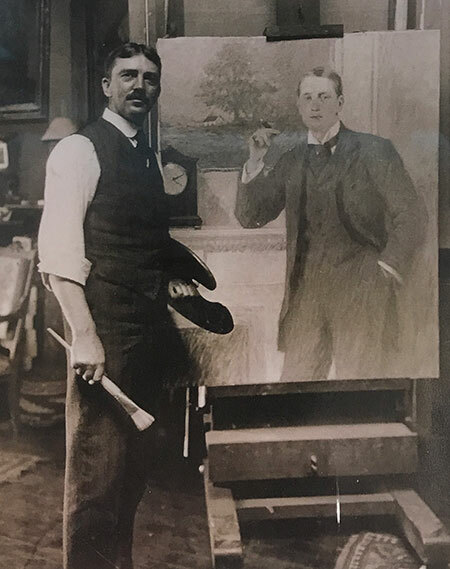 Milton Herbert Bancroft posing with a painting. Born on January 1, 1866 in Newton, Massachusetts, Milton Herbert Bancroft was an accomplished American artist and illustrator. He received his formal education from the Massachusetts Normal Art School in Boston, and then abroad to complete his training at the renowned Académie Julian in Paris. Bancroft lived and worked during a time of dynamic change in the United States and in the arts, brought about in part by urbanization, technological advances, immigration, and the events of World War I and its aftermath. 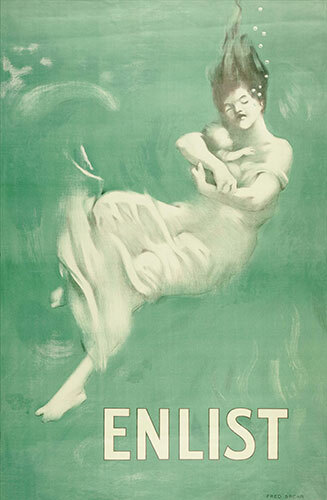 By 1916, the United States was preparing for possible entry into the war in Europe, and as a result, poster campaigns were started to promote preparedness to support the war. 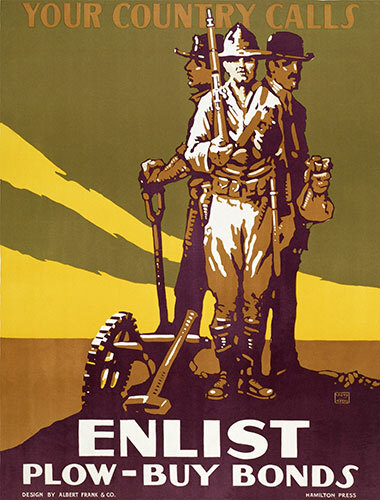 Bancroft, wanting to personally be involved with the war effort, used his artistic ability to design posters promoting the YMCA's support of the troops during World War I. In addition he applied for an assignment overseas early in 1917, as a camouflage painter (artist embedded with the troops), but his age disqualified him. He was recruited by the YMCA to serve as one of the chiefs of decoration who oversaw the designing of Soldier relief "huts," and in 1918, Bancroft found himself directing this work for the French and American Soldiers in France. His artistic work took him from supply ports to Paris to the frontline sectors of St. Quentin, Chateau-Thierry, Reims, Verdun, and to the Argonne. In 1920, after the war ended, Bancroft retired to the family farm in Maryland with his wife and children, where he painted landscapes and lived a peaceful, family life, until his death in 1947. The work of Milton Herbert Bancroft is currently on display at the USAHEC in the General Omar N. Bradley Memorial Art Gallery. The exhibition showcases examples of his sketches of the aftermath of World War I in France, along with photos of the work the YMCA did throughout Europe. We invite you to plan a trip to the USAHEC to see this incredible work in person! Chateaux Thierry, Aisne, France, circa 1919. Bernecourt, Meurthe-et-Moselle, France, circa 1919. The welcoming sign of the YMCA greets the Soldiers upon arriving in St. Nazaire, France, December 7, 1917. 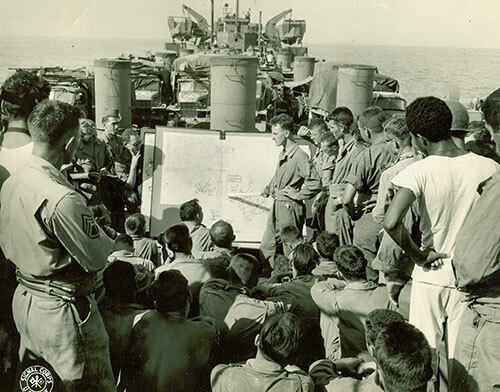 Troops receiving last minute instructions on the coming invasion of the coasts of Sicily, July 11, 1943. On July 10, 1943, the invasion of Sicily began with an assault by four U. S. Army Divisions, four British divisions, and a Canadian division. 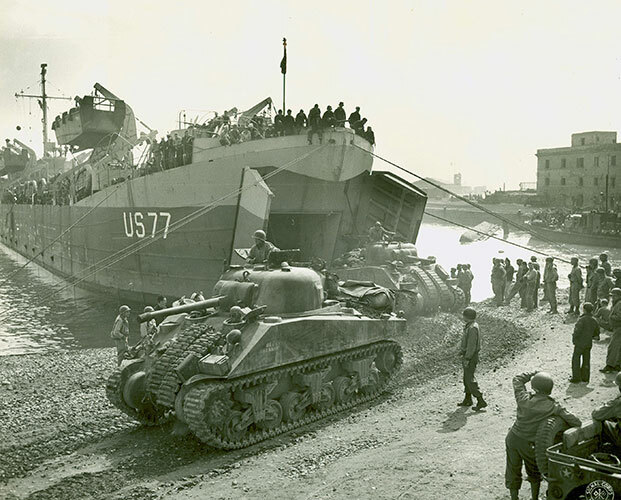 Soldiers, equipment, and supplies were transported to the island by a force of 3,200 ships and craft, including a new type of amphibious ship, the Landing Ship Tank, commonly referred to as "LST." Its maximum speed of 11.5 knots also produced the nicknames "Large Slow Target" or "Large Stationary Target" by Soldiers. The invasion of Sicily was the first large scale use of LSTs in a joint operations amphibious landing in the European-African-Middle Eastern Theater of Operations. The creation of the LST was a joint operation. Designed at a British-American conference in November 1941, the United States built the vessels for both countries. The first keel was laid on June 10, 1942, and by the end of World War II, 1,051 of the vessels were built. 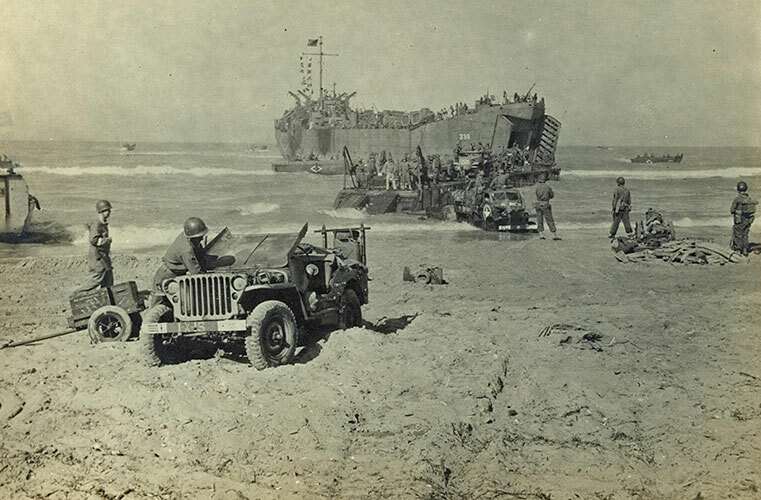 LSTs enabled assault troops to avoid heavily defended ports and to land wherever there was a suitable beach. The LST was specifically designed to land vehicles. It was 328 feet long and could carry armored vehicles in the tank deck and non-armored vehicles on the main deck. The cargo capacity was 2,100 tons and approximately 200 Soldiers. Its heart was the Tank Deck - a space 230 feet long by thirty feet wide by twelve feet tall. Once it arrived at a beach, the massive bow doors opened, and the vehicles drove off, ready for combat. The Americans at Sicily landed along a forty mile shore line in the Gulf of Gela. Seventy-four LSTs were a part of the assault force. The ships embarked from North Africa and crossed the Mediterranean in spite of heavy weather. The conditions for unloading were less than ideal, requiring the use of pontoons due to the beach conditions. 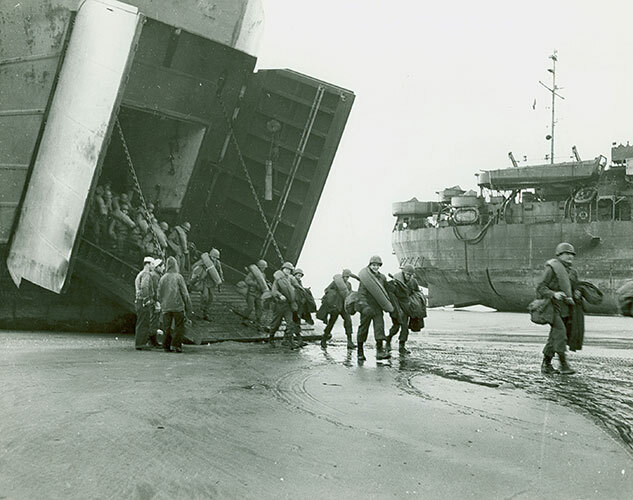 There was congestion on the beaches due to too few personnel being assigned to unload supplies, broached landing craft, and a lack of transportation to move supplies inland. There were also underwater mines and enemy air attacks. LST 313 was destroyed on the first day by an aerial attack, and LST 312 was badly damaged. Despite the obstacles, the crews and their ships persevered. Tanks from LST 2 helped repulse a German counterattack on the beachhead on July 11, immediately after disembarking. The official report on Operation Husky pronounced the LSTs as outstanding in performance and usefulness. The ships provided critically needed support to the Army during the invasions of Salerno, Anzio, Normandy, and Southern France, as well as in the Pacific. On D-Day, LSTs brought 41,035 wounded Soldiers back across the English Channel to hospital facilities. Remarkably versatile vessels, some were fitted with railroad tracks to carry and land loaded freight cars. Thirty-nine LSTs were modified into Landing Craft Repair Ships, and another thirty-eight were transformed into hospital ships. Despite their vulnerability, only thirty-nine were lost during World War II – twenty-six to enemy action, and thirteen to weather or accident. Seventh Army Shoulder Sleeve Insignia - units of the 7th Army assaulted Sicily on July 10, 1943. These tanks of an armored regiment are debarking from an L.S.T. 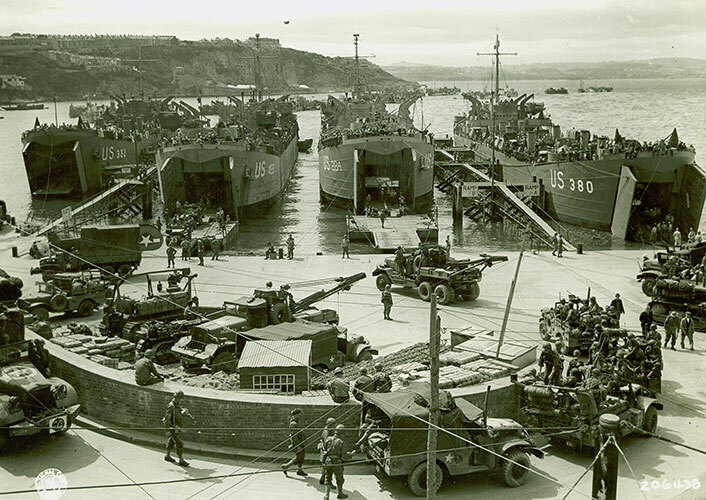 in Anzio harbor, added strength for the U.S. Fifth Army on the beachhead. GIs unload at the beach of La Harve, France, which has just been put in operation after the harbor was cleared of mines and beach obstacles. In preparation for the invasion, artillery equipment is loaded aboard LCTs at an English port, Brixham, England, 6/1/44. Front cover of the G.I. Joe Training Manual. The USAHEC is renowned for its extensive collection of Army Technical and Field Manuals (TMs and FMs), which provide detailed information and guidance about Army procedures and equipment. Some surprises, however, lurk on the USAHEC shelves. Next to volumes about radio operation, weapons, and logistics management, a manual with instruction about "America’s movable fighting man" awaits. For more than fifty years, G.I. Joe has been a staple in the American toy industry. The initial G.I. Joe was introduced on February 2, 1964 by Hassenfeld Brothers (or Hasbro) in response to the success of Barbie sales. With many veterans among the ranks at Hasbro, the first G.I. 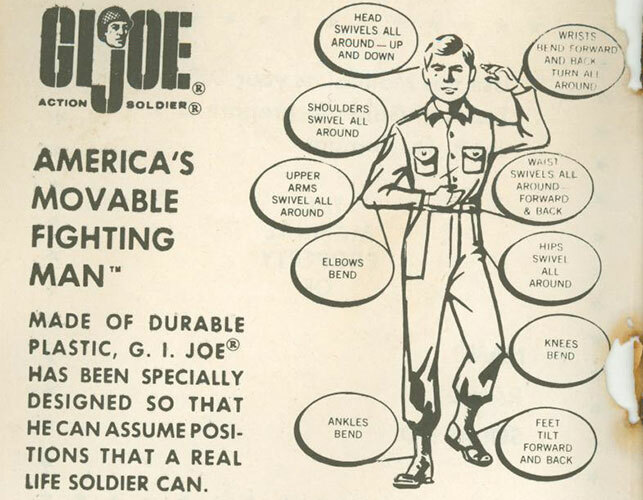 Joes were outfitted in military uniforms, and were known by names such as "Action Soldier" and "Action Sailor." An instruction booklet was produced to provide tips about the action figure, with example body positions, and uniforms and equipment available for purchase. 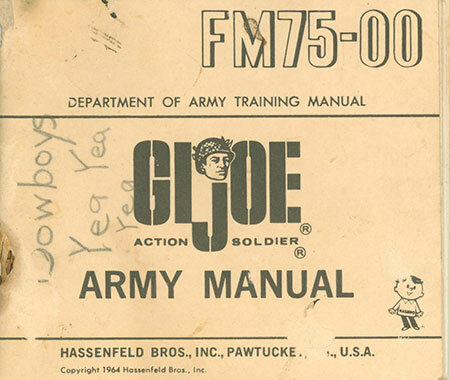 Trying to create an authentic experience while maximizing the military connection, Hasbro produced a user's manual mimicking a Department of the Army Manual. Its front cover looks authentic, but the advertisement on the back is an immediate indication the manual was created by a business and not the Army! The General Omar Bradley G.I. Joe, produced as part of the Historical Commanders Edition. In addition to the G.I. 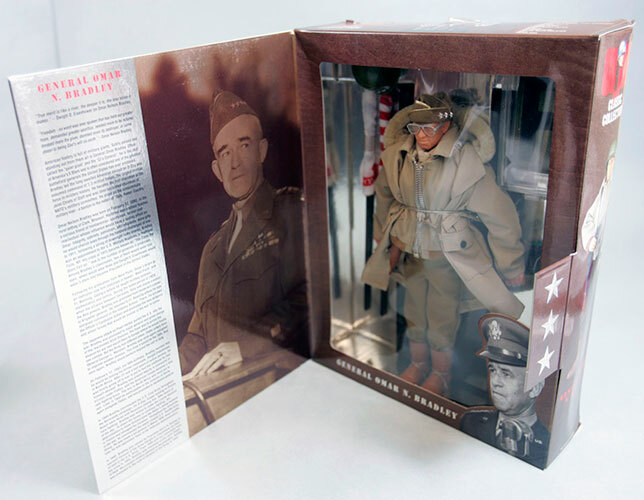 Joe Army Manual, there is one other piece of action figure history in the USAHEC Collection. 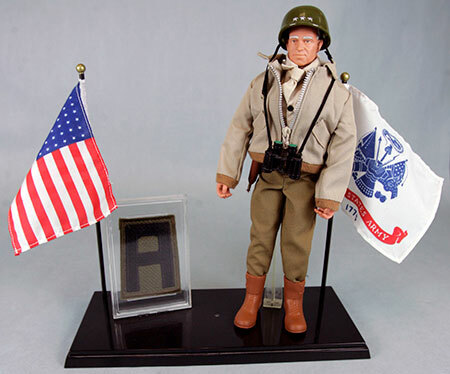 Hasbro produced various G.I. Joe series over the years, and in 1998, they released the Classic Collection of Historical Commanders, and included General Omar N. Bradley. When General Bradley's invaluable historical materials were donated to the USAHEC, a G.I. Joe in his likeness was included. These pieces of cultural history demonstrate the importance and connection of the Army to the nation throughout history. 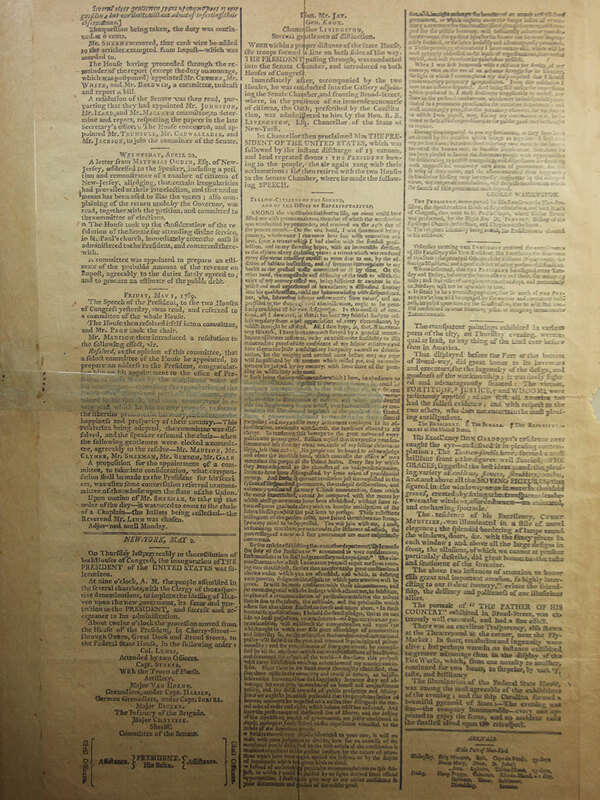 One of the initial pages in the G.I. Joe manual praises the durability and realistic nature of the action figure. Among the pages of uniform and equipment examples, the manual also provides model fighting positions for G.I. Joe. Back cover of the G.I. 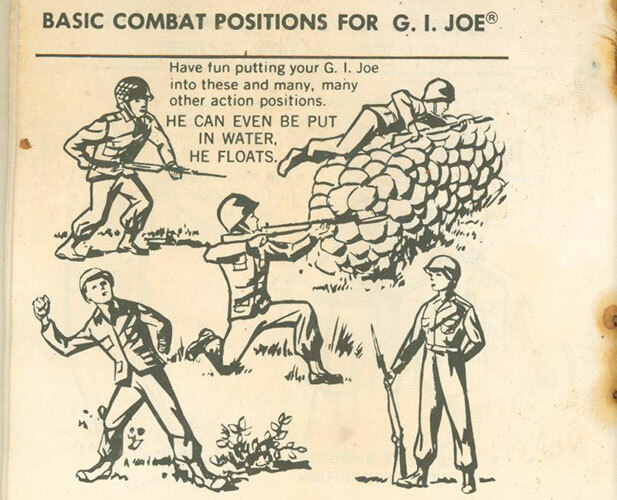 Joe Training Manual, with an advertisement for G.I. 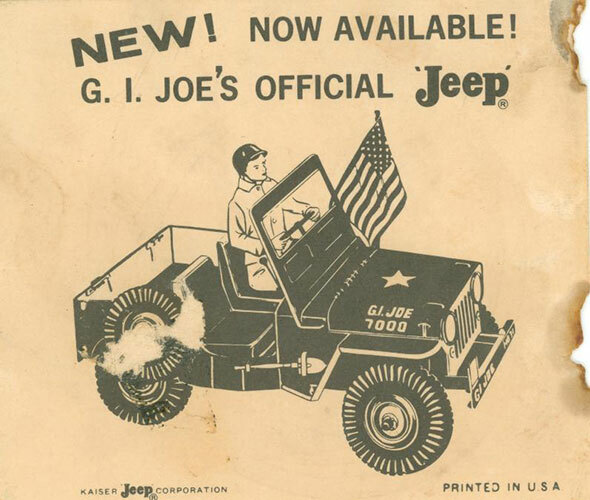 Joe's official Jeep. The packaging for the General Bradley G.I. Joe, included a biography and information about his significant accomplishments. In June 1945, one of the final battles of World War II was drawing to an end - the Battle of Okinawa. On October 3, 1944, American forces received a directive to seize key positions in the Ryukyu Islands, the island chain that includes Okinawa. Operation ICEBERG, the Okinawa campaign's code name, marked the entrance of the United States into the inner circle of Japanese islands in the Pacific, and the end of a long journey from Pearl Harbor. The strategic plan for Operation ICEBERG was issued in the fall of 1944 by Admiral Chester Nimitz, the Commander in Chief, Pacific Ocean Areas (CINCPOA), and was based on three assumptions. First, the projected campaign against Iwo Jima would have progressed to such an extent that naval fire-support and close air-support units would be in range for the assault on Okinawa. Second, the necessary ground and naval combat units and assault shipping engaged in the Philippines would be released promptly by Nimitz's counterpart, General Douglas MacArthur, the Commander-in-Chief of the Southwest Pacific Theatre. Third, preliminary air and naval operations against the enemy would ensure control of the air in the target area. The Battle of Okinawa was not going to be easy. The armament of the Japanese was characterized by a high proportion of artillery, mortar, anti-aircraft, and automatic weapons in relation to infantry strength. 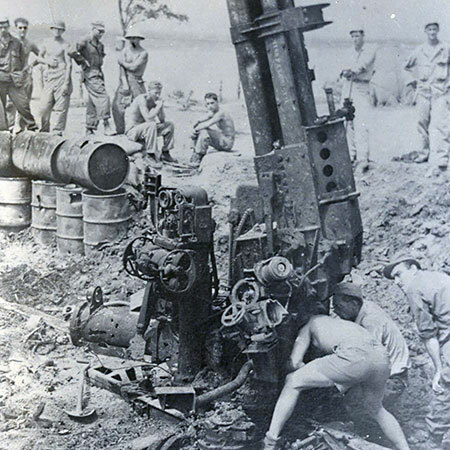 On Okinawa, the Japanese Army possessed artillery in greater quantity, size, and variety than had been previously available. The active formulation of a Japanese defense plan for the Ryukyus dates from the American capture of the Marianas in June and July 1944. 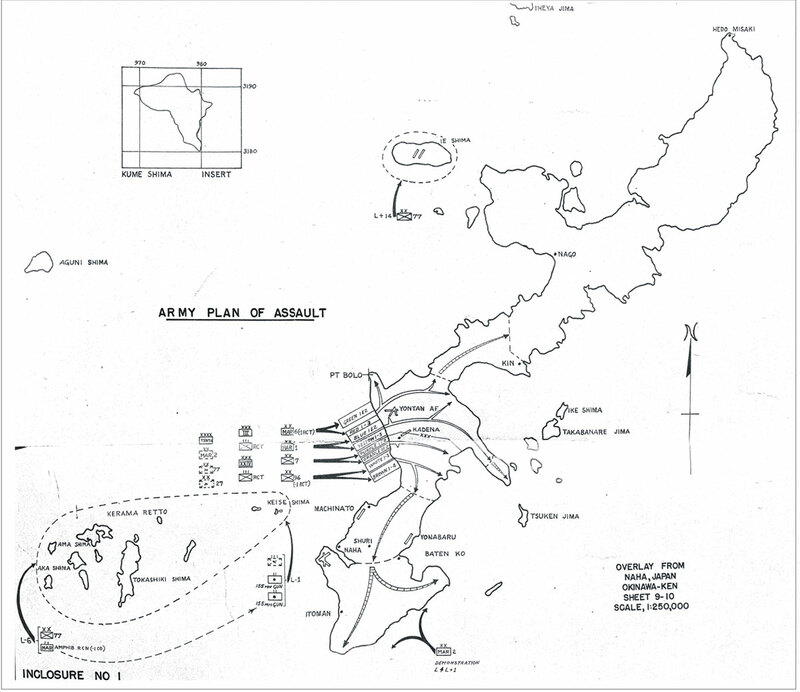 Their first plan for the ground defense of the Ryukyus was established in a 32nd Army directive of July 19, 1944. 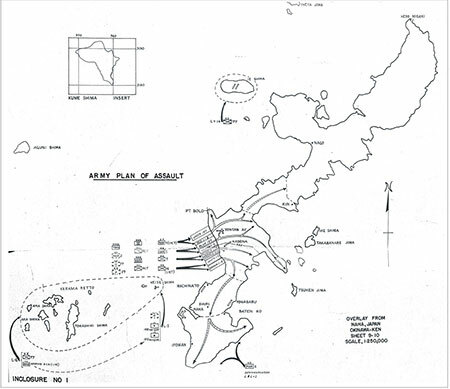 In the early part of 1945, important changes were made in the original defense plan. It was decided not to attempt the destruction of the invading forces at the beaches but instead to offer a strong resistance around a central fortified position. On April 5, 1945, the Japanese 383rd Battalion marked the beginning of iron resistance on Okinawa, which led to high casualties and little progress for either side. American attacks on the Japanese lasted only a short time until too many casualties forced the Americans to withdraw. On April 24, on the eastern side of the island, the 7th U.S. Division walked up to the top of Hill 178, and realized they had finally broken through the first line of Japanese defenses. By early May, the Americans had successfully broken through the second line of defense and were able to hold this line against the Japanese for longer periods of time. Finally, by the end of May, the flower of General Mitsuru Ushijima's forces on Okinawa had been destroyed. Three major enemy units had been committed to the line and had all wasted away as a result of naval gunfire, artillery fire, air attacks, and tank and infantry combats. The deaths of General Ushijima and his Chief of Staff, General Isamu Cho, by ritual suicide on June 22 or 23 marked the end of the Okinawa campaign for the 32nd Japanese Army. The entire campaign lasted eighty-three days. It was not until June 22 that Hill 85 between Medeera and Makabe fell to the 305th U.S. Infantry. 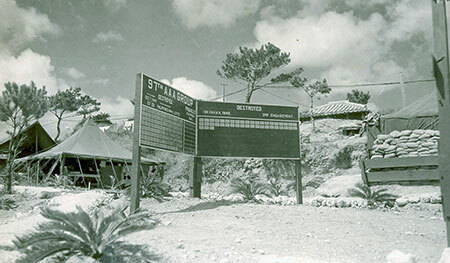 The next day the U.S. Tenth Army began a thorough and coordinated mop-up campaign to eliminate the disorganized remnants of the 32nd Japanese Army in southern Okinawa. The plan assigned XXIV Corps and III Amphibious Corps their respective zones of action and fixed three phase lines for the completion of the task. The mop-up was successfully completed by June 30. Once the American forces turned northward, fewer enemy were found, and the third and final phase line was reached with ease. The final toll of American casualties was the highest experienced in any campaign against the Japanese. Total U. S. Army losses came to 23,000. The U.S. Marine Corps lost another 20,000, and the U.S. and British Commonwealth navies suffered nearly 10,000 more losses. To that staggering total of almost 53,000 must be added another 26,000 non-battle casualties, who were evacuated because of physical and combat fatigue. The high cost of victory was due to the fact that the battle had been fought against a capably led Japanese army of greater strength than anticipated. The campaign had lasted considerably longer than expected, but Americans had demonstrated again on Okinawa that, despite heavy losses, they could win the battle and the campaign. Before summer was over, they would win the war. 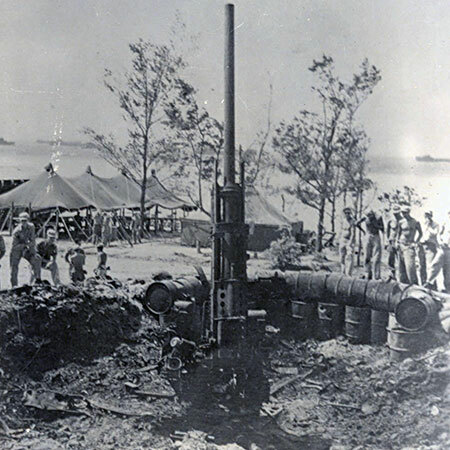 Gun emplacement of Battery D, 93rd AAA Gun Battalion showing results of direct hit by Japanese naval GP 60-KG bomb on edge of gun platform. Ammunition store in pit scattered. Close-up of same gun. Bomb killed entire crew and exploded one-third of stored ammunition. Resolved that six companies of expert riflemen be immediately raised in Pennsylvania, two in Maryland, and two in Virginia; that each Company consist of a captain, three lieutenants, four sergeants, four corporals, a drummer or trumpeter, and sixty-eight privates. That each Company, as soon as completed, will march and join the Army near Boston, to be there employed as light infantry under the command of the Chief Officer in that Army. That the pay of the officers and privates be as follows: a Captain at 20 dollars per month, a lieutenant at 13 and 1/2 dollars, a sergeant 8 dollars, a corporal at 7 and ½ dollars, a drummer (or trumpeter) at 7 and 1/2 dollars, privates at 6 and 2/3 dollars, to find their own arms and clothes. That the form of the enlistment be in the following words: "I have this day, voluntarily enlisted myself as a Soldier in the American Continental Army, for one year, unless sooner discharged. And I do bind myself to conform in all instances to such rules and regulations as are, or will be established for the government of said Army." Upon motion, resolved, that Mr. George Washington, Mr. Philip Schuyler, Mr. Silas Deane, Mr. Thomas Cushing, and Mr. Joseph Howes be a committee to bring in a draft of Rules and Regulations for the government of the Army. Today, June 9, 2017, the United States Army War College graduated another class of future Army leaders, after ten months of intense study. These graduates spent their year at the War College developing and refining their ability to tackle complex strategic problems, and this education was born out of a need to further develop the Army more than a century ago. Following the Civil War, a substantially smaller army was scattered along America's far-flung frontier, and the Army sought to incorporate the technological, organizational, and tactical changes that were occurring in warfare. The proponents for reform recommended the establishment of a war academy or some other form of postgraduate schooling for officers. Typical of these recommendations was that of Major General Emory Upton for the creation of a "War Academy to educate officers in the art of war, and to prepare them for the staff and to hold high command," contained in his trip report, The Armies of Asia and Europe, published in 1878. A decade later Arthur L. Wagner reinforced Upton's recommendation when in July 1889, he wrote, "In no profession, trade or calling have the discoveries and inventions of modern science received a more extended application than in the Art of War. As a result... the officers of the present day require a greater degree of professional and scientific preparation than ever before known in the history of war." Unfortunately, the Army had yet to transform itself by the time of the Spanish-American War (1898), resulting in an extremely small Army of 25,000 officers and Soldiers. It remained relatively unprepared to engage the military forces of Spain. Although the Army was highly successful during the short war, it was apparent to all concerned that the service had to become a more efficient and effective fighting force. 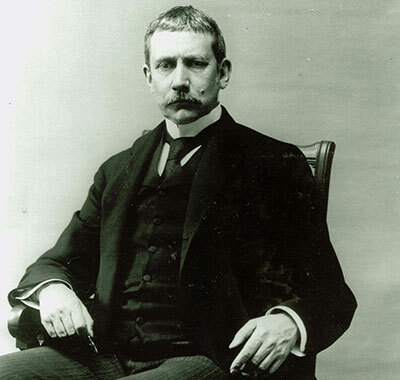 Accordingly, President William McKinley appointed a new Secretary of War, Elihu Root, who was tasked with implementing the transformation of the Army. Secretary Root noted in his 1899 annual report, "some improvements should be made in the organization of the Army." Suggested improvements included the recommendation, "that an army war college should be established." In February 1900, Root ordered a board of officers, led by Brigadier General William Ludlow, to convene for the purpose of "considering regulations with a view to establishment of a War College for the Army." Even before the board submitted its report, Congress appropriated $20,000 for "contingent expenses incident to the establishment of the Army War College." With the Ludlow Board report, then-Colonel William H. Carter, the Assistant Adjutant General, worked closely with Secretary Root and congressional leaders in preparing the necessary reports and documentation leading to the establishment of the Army War College. War Department General Order 155, delineating the Army's school system, was issued on November 27, 1901. 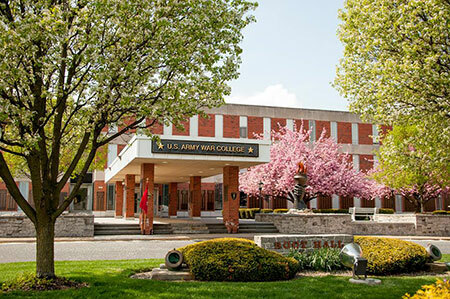 Along with special service schools and a General Service and Staff College at Fort Leavenworth, Kansas, it was directed that an Army War College, located at Washington Barracks (now Fort McNair), be established "for an advanced course of professional study for army officers." Named after Elihu Root, Root Hall is the current home of the U.S. Army War College. 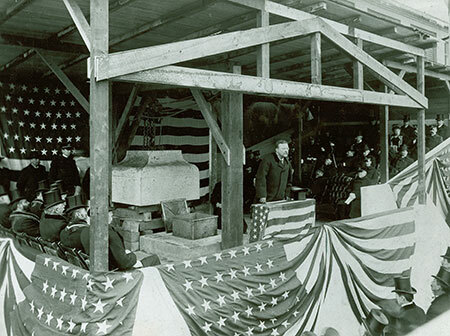 During the February 21, 1903 ceremonial cornerstone laying for the new Army War College building, Secretary Root proclaimed the War College's mission: "not to promote war, but to preserve peace by intelligent and adequate preparation to repel aggression, this institution is founded." He further stated that "an advance and enlargement of military education were demanded by the enlargement of our Army, the advance and greater complexity of military science... and the wider range of military problems which the possibilities of our national growth force upon our attention." Students attending the college would be expected "to study and confer upon the great problems of national defense, of military science, and of responsible command." Root noted, "the officer who keeps his mind alert by intellectual exercise, and who systematically studies the reasons of action, and the materials and conditions and difficulties with which he may have to deal, will be the stronger practical man and the better soldier." This guidance remains as valid today as it did over 100 years ago and serves as an underpinning of today's U.S. Army War College. Each year, the end of May traditionally marks the beginning of summer reading programs in post libraries for Army dependent children living around the world. Today, Soldiers and their families can find the latest bestsellers and access a myriad of online reference resources. However, until the post-Civil War period, these libraries were not commonly available. 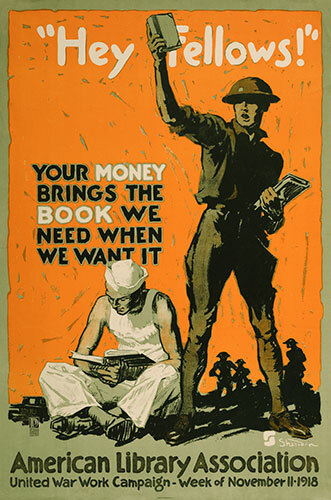 The first identified mention of post libraries appeared in the 1821 General Regulations for the Army, which stipulated that monies generated by assessing post sutlers could be used for the "purchase of books, &c. for a library, one section of which, to be adapted to the wants of the enlisted men." There is little evidence, however, the Army embraced establishing libraries, and in 1857, Secretary of War Jefferson Davis suspended using post funds to support libraries. In the Wyoming Territory, Fort Laramie's library contained about 300 books by 1868. This drawing was made in 1870. In August 1861, the Army's Revised Regulations again authorized the use of post funds for the support of post libraries. By this time, however, the Army's main focus was on restoring the Union. With the Civil War concluded, General Orders 22 (April 1866) again placed a monthly assessment on post sutlers, with the money generated given to both post and regimental funds. Among the approved expenditures for these funds was "the establishment of a library." As regiments relocated to isolated posts west of the Mississippi, post libraries began to appear. As reported by the Fort Laramie post surgeon in 1868: "There is a post library in the adjutant's office containing about 300 old, nearly worn out books. 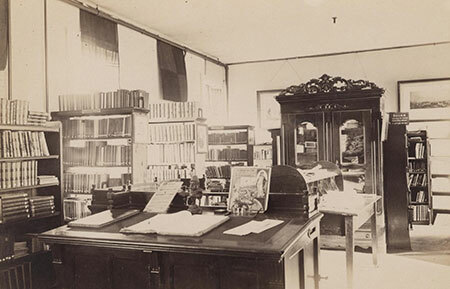 A number of papers and periodicals are subscribed for from the Post General Fund and kept in the library room to which the enlisted men have access." But one book at a time will be allowed to be taken out by any one person. Books will not be retained out over one week. The money value of any book injured or lost will be charged to the person by whom it was taken out. Officers or Enlisted men leaving the post for a period of over three days will return any books they may have out before leaving the Post. The library will be open from 3 to 4 o'clock p.m. Sundays. In Nebraska, Fort Robinson's library had nearly 700 books and magazines by 1883, with Soldiers always eagerly anticipating new arrivals. This photo was taken in 1893. 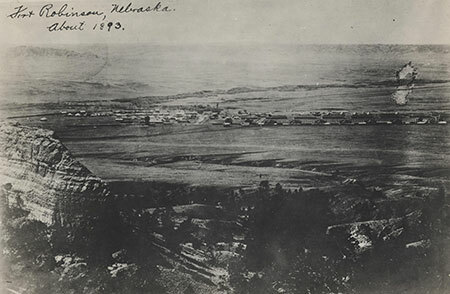 By 1883, the Fort Robinson, Nebraska, post library consisted of 700+ books and magazines. As one Soldier noted, "We remember yet the looks of pleased anticipation ... in the post library as the librarian cheerfully announced the arrival of 'new books'...." Most of the books pertained to military topics, but the collection also included biographies and novels by such noted authors of the time as Alexander Dumas, Charles Reade, and Wilkie Collins. Sergeant Thomas McKenzie even remembered the library in his will, leaving some $1,100 to be used for the purchase of reading material for the post library. Throughout the remainder of the century, the Army continued to support the establishment of post libraries. As reflected in the May 18, 1878, General Orders 24, the Secretary of War directed the report submitted by the Army’s Board on the Establishment of Schools at Military Posts and Garrisons be strictly followed. Included in the report was a reiteration that post and regimental funds be used for post libraries. The report also stipulated that those who lose or damage library materials be held accountable and that library books be considered post property and accounted for as such. To this day, post libraries and school libraries continue to serve the needs and interests of Army Soldiers, civilians, and families. 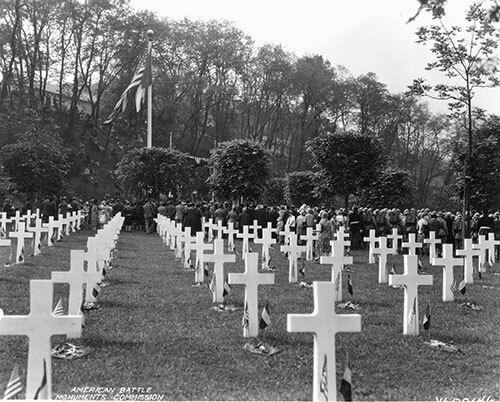 Memorial Day service at Suresnes American Cemetery, Seine, France, 1928. Each year on Memorial Day, America honors fallen service members, men and women, who gave their lives in the defense and protection of the United States of America. The holiday and remembrance has roots in the Civil War, as the nation came to terms with the massive loss of life that occurred during the four years of fighting. More than half a million Soldiers gave their lives during the conflict, and the immediate legacy of the war was its carnage and how to remember it. During the war, Soldiers gathered to mourn and bury their comrades after battle ceased, and women began informal rituals of burial and remembrance before the war ended, both in home towns and at the battlefront. People carried flowers to graves or to makeshift monuments representing their dead, and so was born the ritual "Decoration Day," eventually known as Memorial Day. As a ritual of commemoration, Memorial Day officially took hold in May 1868, when Major General John A. Logan, commander-in-chief of the veterans’ organization the Grand Army of the Republic, called on all Union veterans to conduct ceremonies and decorate the graves of their deceased friends. On May 30, 1868, in 183 cemeteries across 27 states, thousands of people attended memorial ceremonies, and in 1873, the New York Legislature designated May 30 a legal holiday. "We have come to do honor to the noble dead - to strew up with flowers the graves of those who died that we and the nation might live. We have come not in midwinter or with cypress wreaths, but in Springtime, when the fields are green, and the flowers blooming, and birds singing, that, in sympathy with universal nature, we might bring our grateful offering of reverence and affection..."
"The noble dead, who fell here and on these neighboring hills, need no eulogium from our lips. They have secured the proudest of all earthly honors, and their tombstones bear the inscription: They Died for their Country. There is no danger that they will be forgotten..."
Throughout history, a long line of men and women have defended this country, some never returning from their service. Take time this weekend to remember and pay tribute to those who died while serving the nation. Each year, the USAHEC celebrates Armed Forces Day with a timeline living history event, featuring lectures, displays, demonstrations, and reenactors from nearly every era of U.S. Army history. This year's Army Heritage Days is scheduled for this Saturday and Sunday, May 20 and 21, 2017 from 9:00am to 5:00pm each day. The Army Heritage Trail will be lined with reenactors from the French and Indian War to the Vietnam War, and nearly everything in between. Wearing period uniforms and weapons, these living historians will have their historical equipment and weapons on display and will be available to talk to the public to answer questions! The weekend features discussions about WWII Airborne units and paratroopers, a Civil War Artillery demonstration, and a "Meet and Greet" with Army Veterans. As always, this event centers on one specific theme, and this year's focus is tanks and armored vehicles! 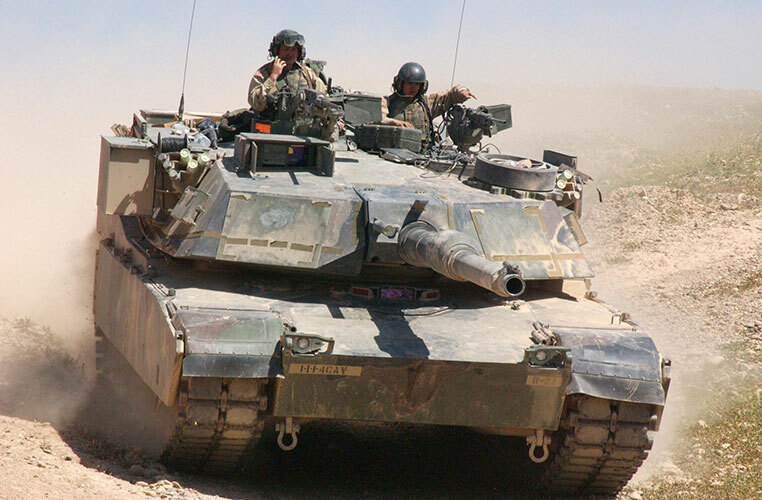 For the first time in Army Heritage Days history this event features armored vehicles from many different eras that will be allowed to DRIVE on the USAHEC's tank course to demonstrate maneuvers and tactics. These tank course demonstrations are scheduled for 10:30am on both days, so be sure to arrive early! For additional detail regarding the schedule, please check the Army Heritage Days webpage on the USAHEC website. 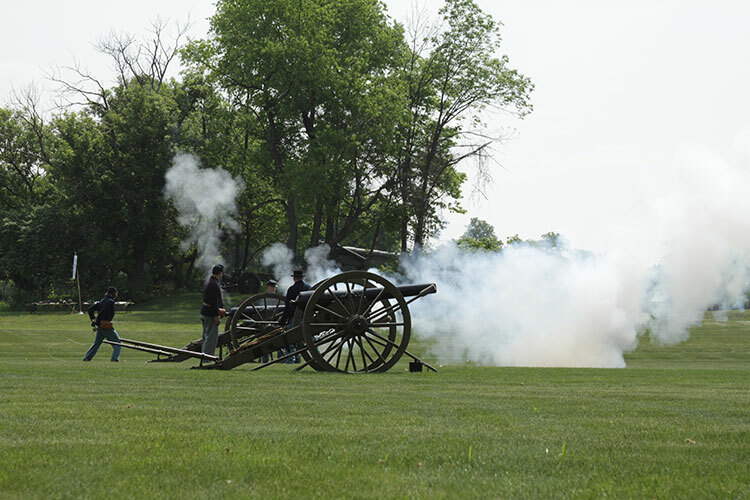 These photos below are from previous Army Heritage Days, so take a look for a preview of next weekend’s upcoming fun. We hope to see you there! Lieut. 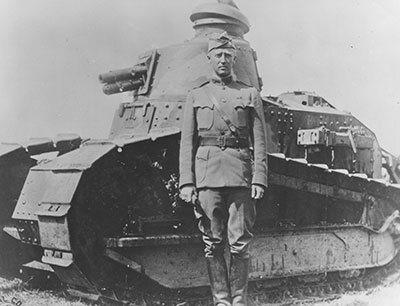 Col. George S. Patton, Jr., 1st Tank Battalion, and a French Renault tank, summer 1918. The USAHEC's upcoming Army Heritage Days living history event (Saturday and Sunday, May 20-21, 2017) celebrates the 100th anniversary of World War I, and will feature working armored vehicles from different eras. These vehicles, including tanks, will drive on a specially created tank course to demonstrate maneuvers and tactics. To prepare for this year’s event, take a moment to read this week's historical highlight, which features information about the first usage of tanks in combat! On April 28, 1918, the 1st Light Tank Battalion was organized at Bourg, France, with Lieutenant Colonel George S. Patton, Jr., in command. Patton was the first Soldier assigned to the fledgling Tank Corps in November 1917, and shortly afterwards, he established the first Army Tank School at Bourg. The first two companies (200 men) reached the school on February 22, 1918, and because no American-made tanks had reached France, Patton relied on twenty-five borrowed French Renault tanks to train his men. 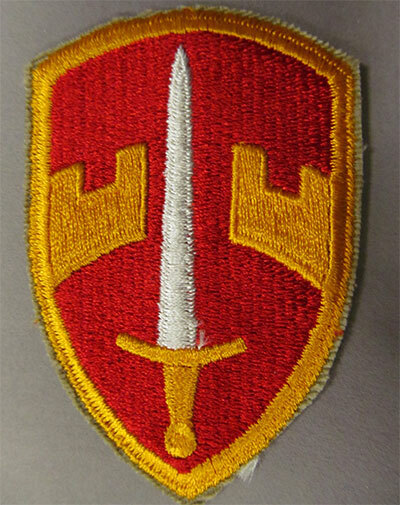 The "patch" designed for armored forces during World War I by LTC George S. Patton and his staff. This insignia belonged to Sergeant Harry E. Record, 301st Tank Battalion. The colors represent the three branches of service – blue for infantry, yellow for cavalry, and red for artillery. Two of Patton's staff officers received orders to create a new patch for his men to wear on their uniforms. Based upon his guidance, they came up with the now familiar pyramid design with the colors red, yellow, and blue, which combine the branch colors of artillery, cavalry, and infantry. Patton immediately paid to have 300 patches sewn in nearby Langres. 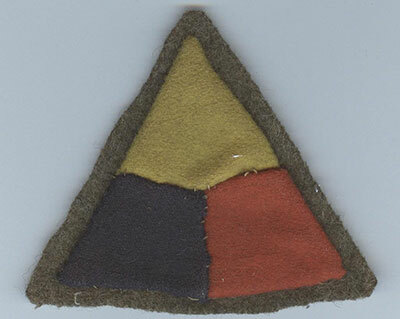 With this patch and other measures, Patton provided the Tank Corps with its own identity. When organized in April, the 1st Light Tank Battalion consisted of three companies, but by June 6, Patton had enough officers and men in camp to organize the 2nd Light Tank Battalion, also of three companies. Patton then became commander of the 1st Tank Brigade. Word reached Patton on the morning of August 20 that he and his two battalions would soon go into combat. The brigade took 144 Renault tanks into the St. Mihiel Offensive on September 12, with one battalion each supporting the 1st and 42nd Divisions. Over the next two days, the men fought in several small actions and suffered few casualties. 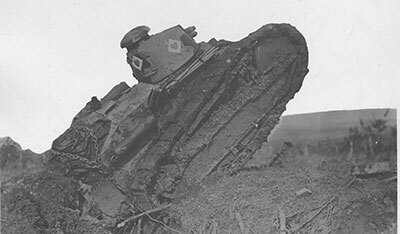 The Tank Brigade saw more action during the Meuse-Argonne Campaign from September 26 to November 2, 1918. These battles gave Patton an idea of how better tanks might accomplish greater things on the battlefields of the future. He saw the Tank Corps becoming an independent combat arm. Patton himself had learned to adjust quickly to the rapidly changing events on these battlefields, and he brilliantly exhibited this trait during his operations in World War II. A tank of Company C, 347th Tank Battalion, during the St. Mihiel Offensive, September 1918. The Army's high command and members of the United States Congress did not share Patton's vision. The National Defense Act of 1920 abolished the Tank Corps as an independent arm, and tank units came under control of the infantry. Not until twenty years later, on July 10, 1940, was the Armored Force created. The 1st and 2nd Armored Divisions were activated five days later, and George S. Patton would become commander of the 2nd Armored Division in April 1941. 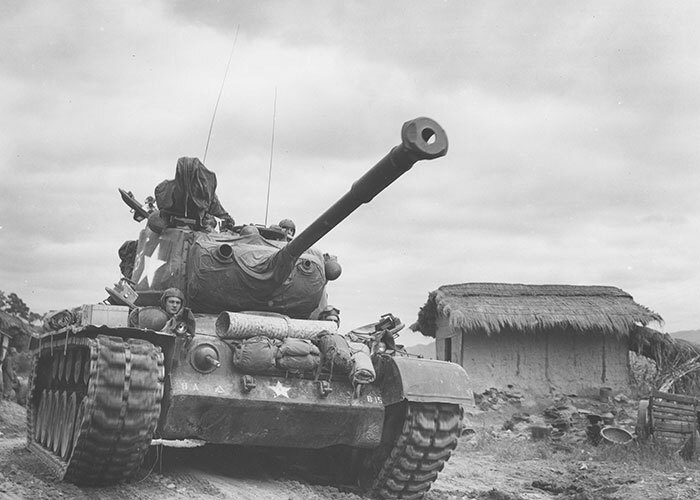 Armored forces played a significant role in World War II, Korea, Vietnam, and the Middle East. A new heavy tank developed in November 1949 would receive the name M46 Patton, and subsequent models, through the M60, would retain the Patton name. Just prior to the fighting at St. Mihiel, Patton instructed his tankers: "No tank is to be surrendered or abandoned to the enemy. If you are left alone in the midst of the enemy keep shooting. If your gun is disabled use your pistols and squash the enemy with your tracks." That spirit of the man and his 1st Light Tank Battalion lives on in the armored forces of today’s Army. 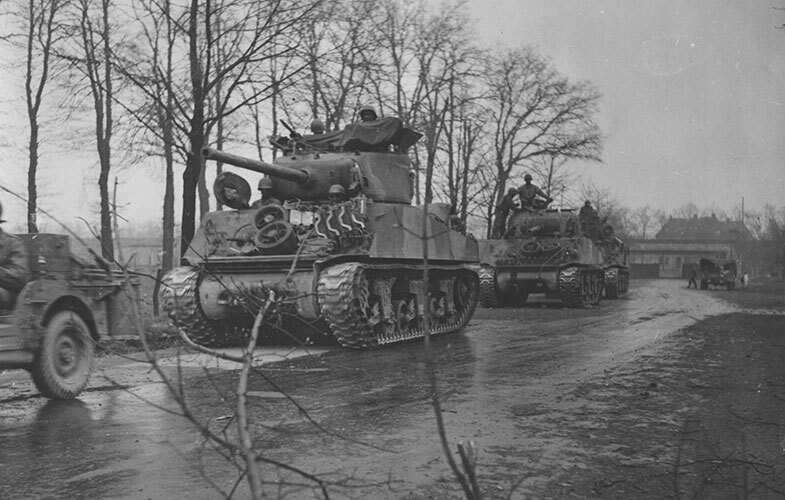 African-American troops of the 784th Tank Battalion and their Sherman tanks preparing to cross the Rhine River, March 1945. M-46 Patton tank and crew passing through the village of Kumko, Korea, in September 1950. Source: U. S. Army Photograph. Men of Troop B, 1st Battalion, 10th Cavalry Regiment, 4th Infantry Division, and their M-48 Patton tank move through the jungle in the Central Highlands of Vietnam, June 1969. Soldiers of Company B, 1st Squadron, 4th Cavalry Regiment, 1st Infantry Division, in their M1A1 Abrams tank in Iraq, April 2004. Born September 25, 1937 near Uniontown, Pennsylvania, Barry Alan Zavislan graduated from North Union High School in 1955 and enlisted in the United States Army on May 31, 1955. Zavislan served in Germany for eighteen months. In 1959, Zavislan was assigned to the 549th Quartermaster Company and sent to Japan for eighteen months. On his return to the U.S., Zavislan was selected to attend Officer Candidate School at Fort Benning, Georgia, and received his commission as a 2nd lieutenant on March 30, 1962. 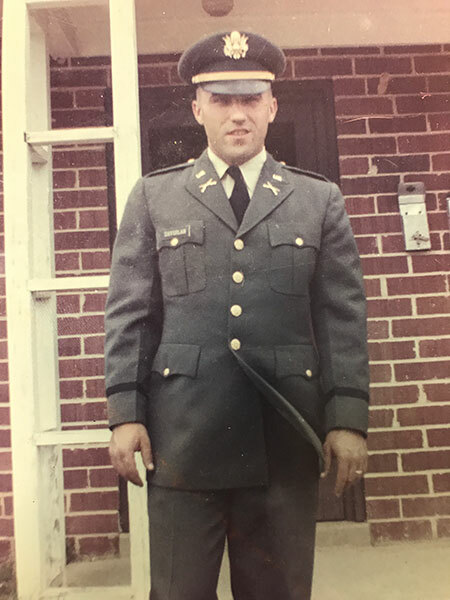 Zavislan served in Korea in 1964-1965, as administration officer in the G-4 Section, Headquarters, Eighth U.S. Army, and in August 1965, he was assigned to Fort Leonard Wood, Missouri. On September 23, 1965, Zavislan was promoted to captain, after which he served as commander of a basic training company. In November 1966, Zavislan was sent to Vietnam, where he was assigned as senior advisor in Advisory Team 87, U.S. Army Military Assistance Command Vietnam (MACV). His team worked with 1st Battalion, 52nd Regiment, 10th Division, Army of the Republic of Vietnam. Four months after his arrival in Vietnam, Capitan Zavislan was killed in action during a mortar attack on his post on March 6, 1967. He was survived by his wife, Delores, and four children, Barry Jr., Carol, Susan, and Mary Elizabeth. He was buried at St. Joseph Roman Catholic Cemetery in Uniontown, Pa. Zavislan was posthumously awarded the Bronze Star Medal and Purple Heart Medal from the U.S. Army and the National Order Medal, Fifth Class, and Gallantry Cross with Palm from the Republic of Vietnam. Barry Zavislan Jr. was born during his father's service in Japan, and donated his father's materials to the USAHEC. The collection documents Zavislan's military service in the U.S. Army and events following his death, with most of the materials dated from 1955-1967. The collection has extensive archival and artifact components, comprised of telegrams, letters, training materials, letters of commendation, photographs, news clippings, uniform components, unit insignia, medals, and mementos from his service. 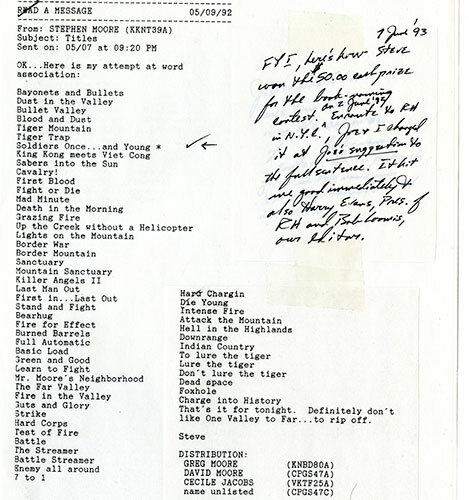 A selection of artifacts are pictured below, and the Barry A. Zavislan Finding Aid provides a by-folder list of the archival components of his collection. The archival collection is available for public research, so if you’d like to learn more about Zavislan’s life and service, plan a visit to the USAHEC! Zavislan had this kimono made for his son, Barry Jr., who was born during his father’s service in Japan. Zavislan kept this Korean money as a souvenir from his service in Korea in 1964-65. This swimsuit belonged to Zavislan's wife, Delores, and bears the Fort Leonard Wood Post Pool patch. These canteens were used by Zavislan during his service. Helmet liner, with Zavislan's initials, BAZ painted on the front. His rank (Captain) is painted on the back. Zavislan used this tape recorder to send messages home to his family, while he was deployed in Vietnam. Vietnamese rank Zavislan wore during his time in Vietnam. Zavislan’s belongings were shipped home from Vietnam in this footlocker, after he was killed in March 1967. Zavislan posthumously received the National Order of Vietnam Medal, Fifth Class (Knight of the Order) from the Republic of Vietnam. Barry Zavislan's widow, Delores, carried the good conduct medal he received posthumously in 1967 in her wallet until her death in 2008. 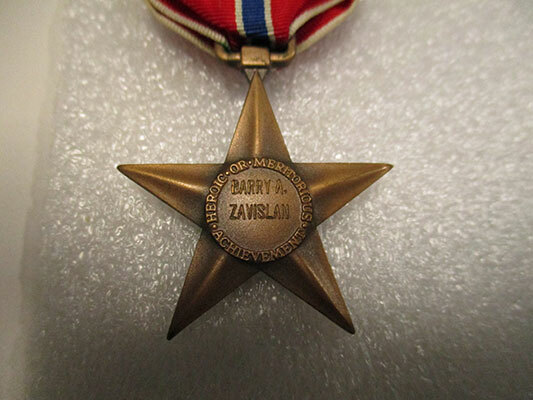 Zavislan's Bronze Star Medal, which he posthumously received, after his death in Vietnam. 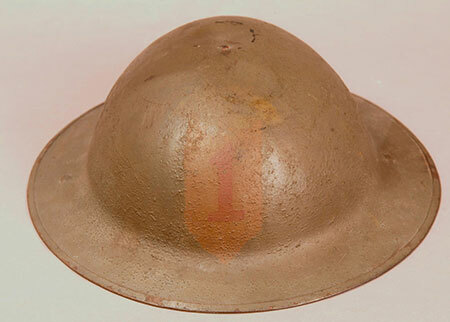 A World War I-era 1st Infantry Division helmet from the USAHEC Collection. In the continued recognition of the 100th Anniversary of World War I, this week's Historical Highlight examines the role of the 1st Infantry Division in the Great War, and the "firsts" they experienced while fighting. On April 2, 1917, President Woodrow Wilson asked Congress for a declaration of war against Germany. On April 6, Congress granted the request, and the United States was formally at war with Germany. Several key events leading up to this act included the sinking of the Lusitania in 1915 and the Zimmerman Telegram sent to Mexico by Germany in January 1917. The resumption of unrestricted submarine warfare by Germany on February 1, 1917 was the key event that took America from neutral ground at home to the trenches of Europe. 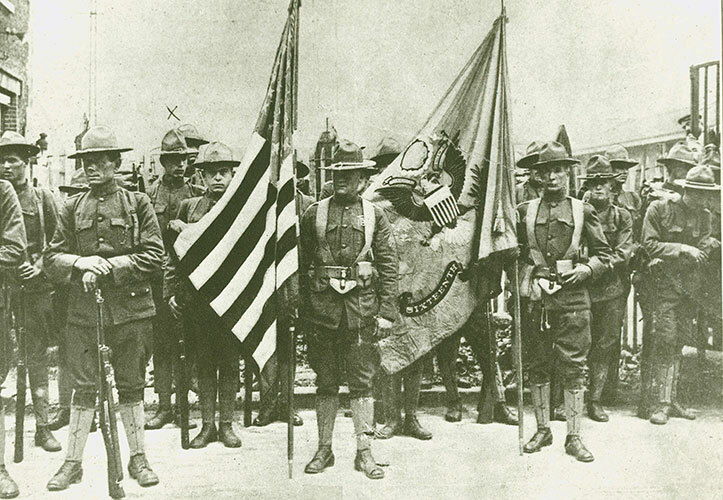 The 1st (Infantry) Division was mobilized in May 1917, and the first official U.S. troops, part of the 28th Infantry Regiment, landed in St. Nazaire, France, on June 26, 1917. After being trained by the French in trench warfare tactics and use of the 75mm French artillery gun, portions of the 1st Division were put into the front line in the Somerville Sector on the Lorraine Front in late October. 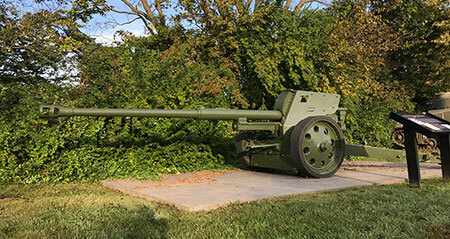 The first American-manned artillery gun (belonging to Battery C, 6th Field Artillery) first opened fire on the Germans on October 23. 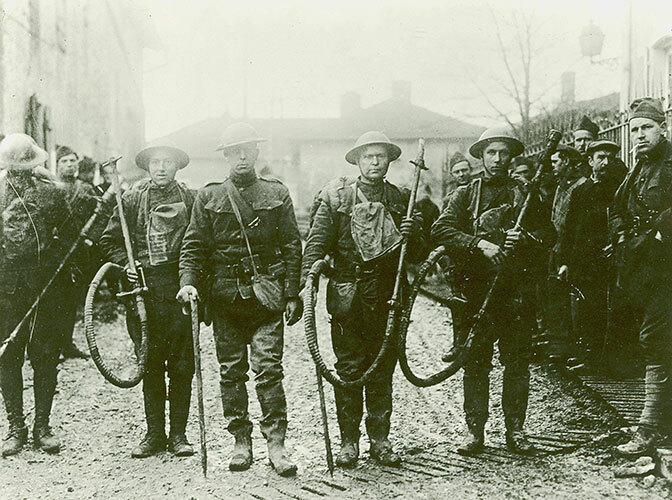 The 18th Infantry Regiment captured the first prisoner taken by American forces on October 27, and on the night of November 2, the Germans raided the American trenches after an artillery barrage and captured 11 Americans. The first official deaths occurred during this raid as well. Private Thomas F. Enright, Private Merle D. Hay, and Corporal James B. Gresham were laid to rest in Bathelemont, France with full honors. By January 1918, the rest of the division was ready to line the parapets and was sent to the Ansauville Sector, near Toul. In April, the division was moved to the Cantigny Sector, where they would soon help liberate the town in the first all-American operation. The attack was staged for the early morning of May 28, 1918, led by the 28th Infantry Regiment. 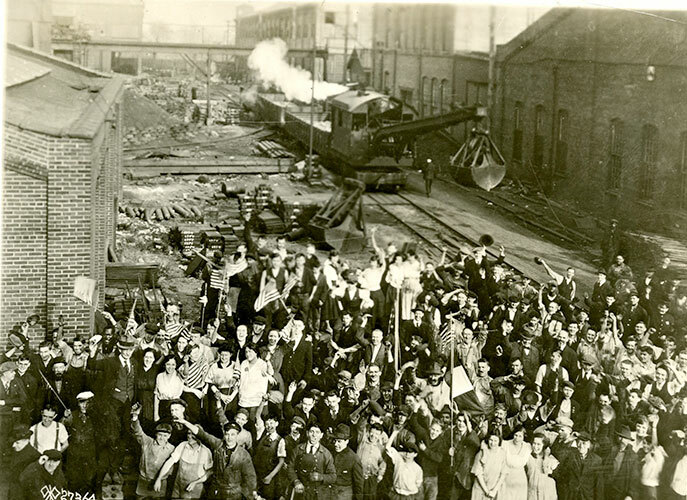 After multiple campaigns throughout the rest of the war, as well as post-war occupation duty, the majority of the 1st Division returned to the U.S. in August and September 1919. Even now, the "Fighting First" is still fighting. This photograph was taken during a pause in the parade in Paris on July 4th, 1917 by elements of the 16th Infantry. This propaganda poster uses an image to invoke thoughts of the sinking of the Lusitania, to encourage Americans to enlist in the military. The first members of the A.E.F. killed in action in the World War - in France. Liquid fire machines of the Germans brought back from "No Man’s Land" by United States 18th Infantry after a raid of March 6, 1918. Menil la Tour, France. March 7, 1918. 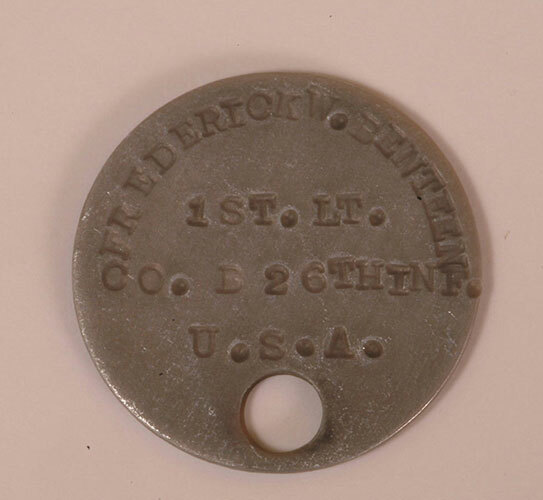 A dog tag from World War I. 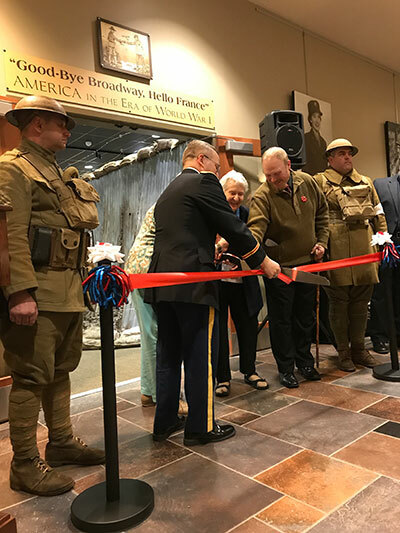 Colonel Peter Crean (Director, USAHEC), Mr. Kaleb Dissinger (Exhibit Lead), and the daughters of Sergeant Evan Miller, a Soldier featured in the exhibit, cut the ribbon to officially open "Good-Bye Broadway, Hello France" - America in the Era of World War I. On April 6, 2017, the 100th Anniversary of the United States' entry into World War I, the USAHEC opened a new exhibit, highlighting the contributions and sacrifices of American Soldiers in the Great War. Once known as "the war to end all wars," World War I fundamentally changed the tactics of warfare, while also necessitating an evolution of the concept of diplomatic relations. This war unleashed a century of conflicts, including the Second World War and the Cold War, and although World War I is often forgotten today, it is the source of many of the challenges the world still faces. 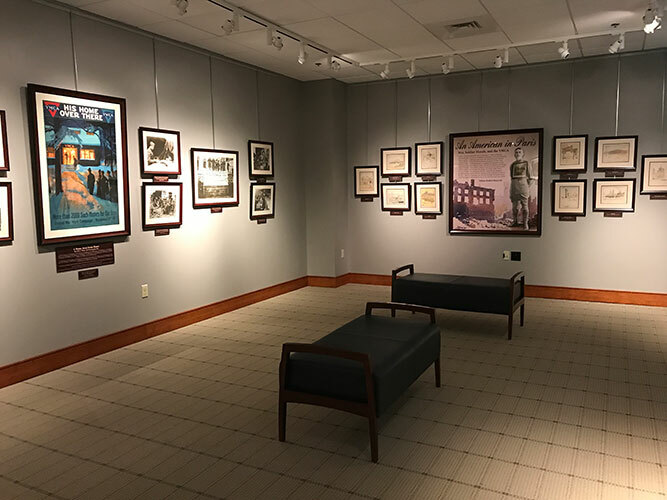 The new exhibit is the second phase of "Good-Bye Broadway, Hello France" - America in the Era of World War I, the first of which opened last year in the USAHEC's Ridgway Hall. 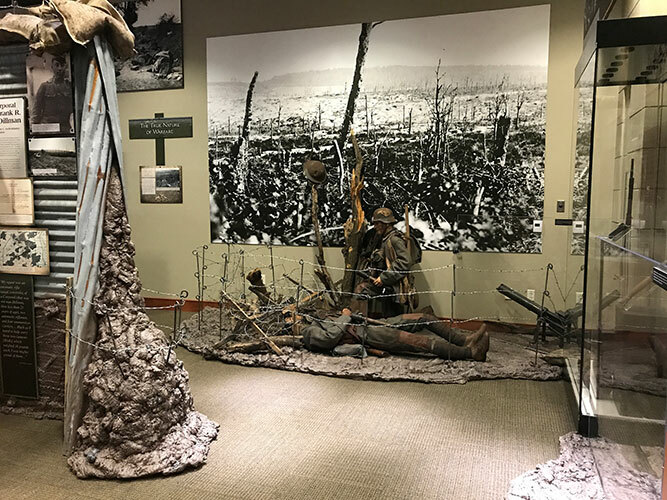 The second section of the exhibit highlights the numerous battles that occurred in World War I, and the stories of the Soldiers who fought in them. "Good-Bye Broadway, Hello France" - America in the Era of World War I takes visitors from America's entry into the war in 1917, through the transition of civilians to Soldiers and their training, to the front lines of battle. It also examines how the birth of new technologies, such as machine guns, tanks, poison gas, artillery, and aircraft, were integral in both influencing the outcome of the war, and increasing the utter devastation it caused. Artifacts, photographs, and archival materials from the USAHEC Collection help tell the stories. These items are exhibited in an in-depth and engaging battlefield landscape, providing visitors with the feeling of walking through the trenches, as they learn about the lives and experiences of Soldiers who called them home. Plan a trip to the USAHEC to witness this incredible new display, highlighting the many actions and sacrifices of the courageous Soldiers who waged the forgotten war that changed the world. 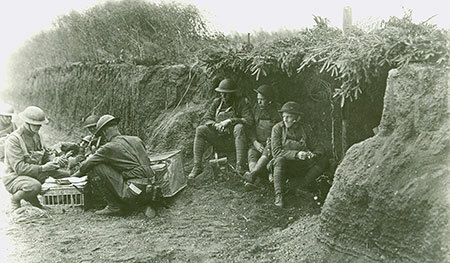 This British-designed Stokes mortar and photographs of Soldiers in the trenches are examples of some of the displays in the exhibit’s interactive landscape. These mannequins portray two German soldiers fighting through the entanglements of "No Man's Land." Two World War I living historians, on hand during the formal exhibit opening ceremony, pose in part of the re-created trench. The exhibit begins with information and stories about the transition from the Homefront to the War Front. A portion of the "trench system" inside the exhibit area, which showcases the blend of material from the USAHEC Collection into the landscape of the battlefield. 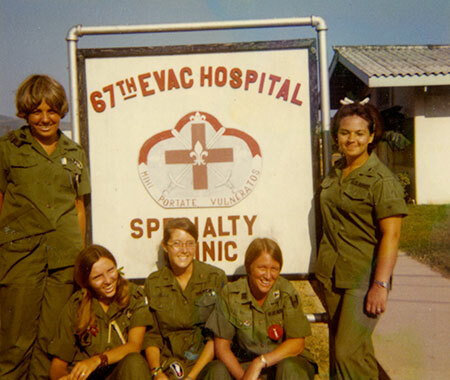 From left to right, Maureen Dwyer, Nancy Faller, Mary Faller, Mary Jo Rice, and Jaqui Nemitz Van Meter, stand in front of a "67th Evac Hospital Specialty Clinic" sign, circa 1970. As March draws to a close, so does Women's History Month. The nation recognizes the important and impactful contributions of women throughout history during this month, including the service of women in the military. To complete this month's tribute to women's history, the USAHEC highlights a final story from its collection - the service of Lieutenant Colonel (Ret.) Nancy Faller during the Vietnam War. 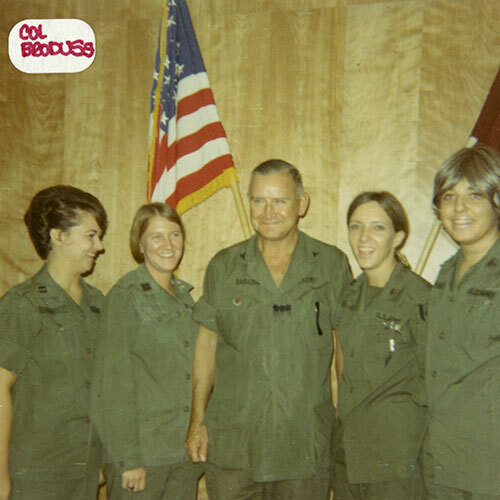 Born in Carlisle, Pennsylvania on October 6, 1946, Nancy Ann Faller entered the U.S. Army Nurse Corps in August 1967. She was commissioned in December of that year through the Army Student Nurse Program, and graduated from the nursing school at St. Joseph College in Emmitsburg, Maryland in June 1968. Later that summer, then-Second Lieutenant Faller had the honor of administering the oath of office to her sister, Mary Faller, as she entered the Army Nurse Corps Program. Like Nancy, Mary received a commission following her graduation from St. Joseph College in June 1969. Second Lieutenant Nancy Faller's first duty assignment was a staff nurse at Ireland Army Hospital, Fort Knox, Kentucky. In October 1969, Lieutenant Faller flew from Travis Air Force Base via Okinawa to Bien Hoa, Vietnam. 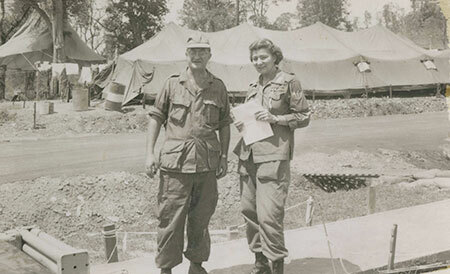 She arrived at the 43rd Medical Group at Nha Trang, and shortly after, she moved to the 67th Evacuation Hospital, at Qui Nhon, where she was assigned to the orthopedic department. She had the unique opportunity to serve with her college classmates, two of whom were already in Vietnam when she arrived (Mary Jo Rice and Jaqui Nemitz Van Meter), and another, who traveled to Vietnam with her (Maureen Dwyer). Nancy's sister, Mary Faller, joined them in early 1970. 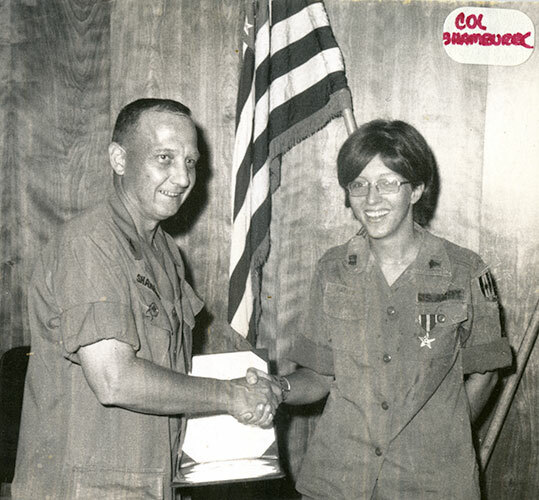 Lieutenant Faller was promoted to captain during her time in Vietnam, and was also promoted from staff nurse to assistant nurse supervisor during her service there. She departed Vietnam in October 1970, and served in the U.S. Army until December 2000. A portion of the Nancy A. Faller Collection is currently on display in the exhibit, "Courage, Commitment, and Fear: The American Soldier in the Vietnam War," in the USAHEC's Soldier Experience Gallery. Stop by the USAHEC to learn more about her life, and the service of women throughout the history of the U.S. Army. 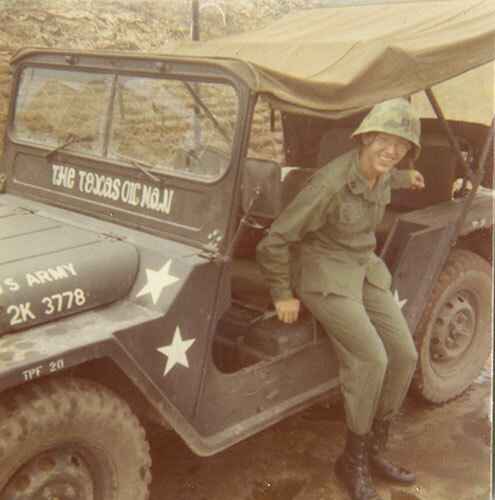 Captain Nancy Faller poses with a jeep in Vietnam, circa 1969. 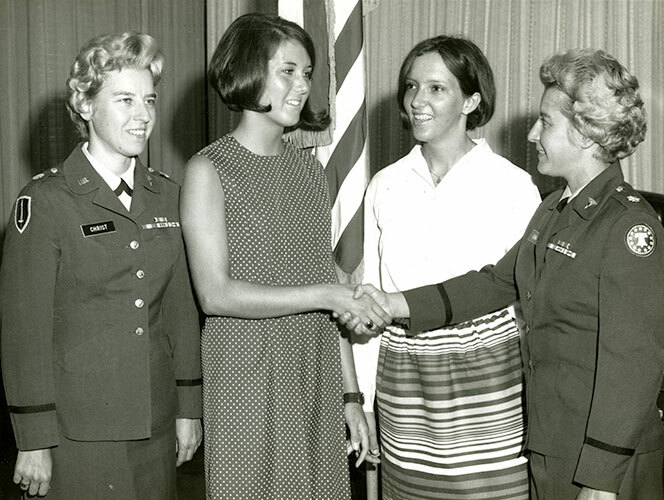 Mary Faller is congratulated upon entering the Army Nurse Corps Program on July 12, 1968 at Carlisle Barracks. Lieutenant Nancy Faller stands to the right of her sister, shortly after administering the oath of office to her. 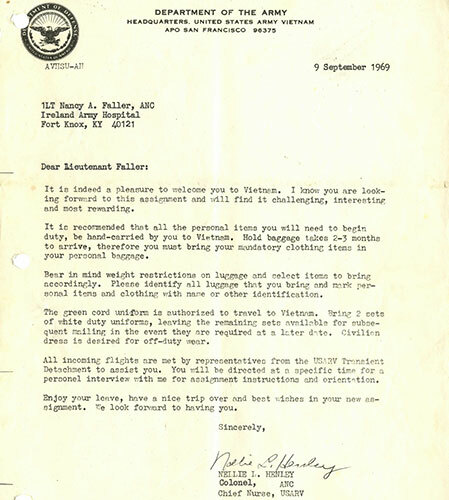 Prior to her departure for Vietnam, Lieutenant Faller received this letter from Colonel Nellie Henley, Chief Nurse, U.S. Army Vietnam, welcoming her, and providing instructions for her upcoming assignment. 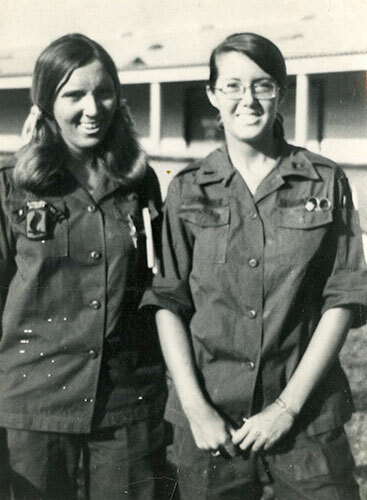 Captain Nancy Faller and Lieutenant Mary Faller pose together in Vietnam, circa 1970. 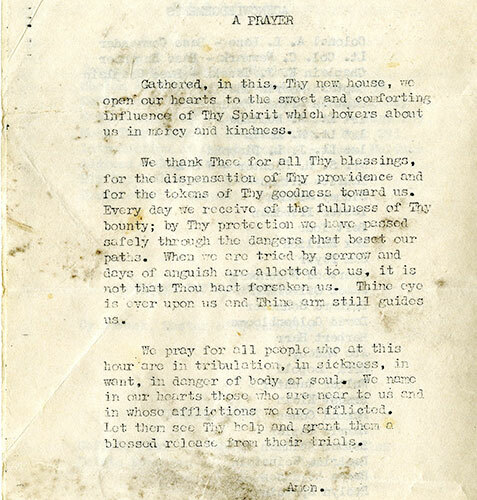 A portion of a letter Captain Faller sent home, after a particularly tough day providing medical care and treatment to injured American Soldiers. Jaqui Nemitz Van Meter, Mary Jo Rice, Nancy Faller, and Maureen Dwyer pose with Col Broddus, after receiving promotions to captain. This cotton helmet cover was the typical design used by U.S. Soldiers in Vietnam. It was a popular place to express thoughts and feelings relating to their experiences. Captain Faller drew the initials of her college (SJC) and wrote the words "Think Snow." American Soldiers cross the arid plains south of Columbus, New Mexico. 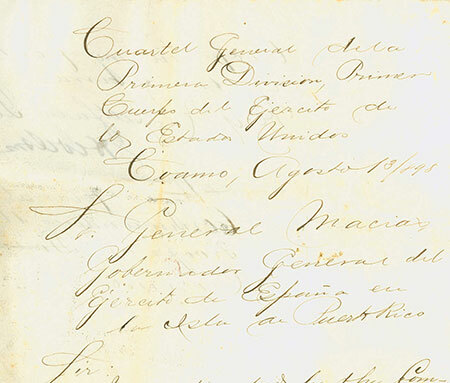 For over a year before the beginning of the Mexican Punitive Expedition, a series of incidents and minor raids occurred along the U.S. border with Mexico. Doroteo Arango Arámbula, otherwise known as Pancho Villa, and his Mexican Revolutionary Army targeted Americans and American interests in Mexico. A motorized convoy makes its way down a rutted road. On the morning of March 9, 1916, Villa's men raided the town of Columbus, New Mexico. It was the event citizens on the U.S. side of the border had been nervously dreading. The Villistas burned buildings, looted businesses, seized horses, killed civilians, and battled troopers of the 13th U.S. Cavalry Regiment. As a result, President Woodrow Wilson sent 10,000 Regular Army troops under General John J. Pershing into Mexico to find Villa and his men. President Wilson also mobilized 150,000 National Guardsmen, and sent most of them to the Mexican border as backup to the Punitive Expedition. 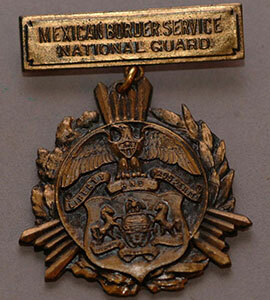 Many Soldiers returning from the Mexican Border were rewarded with medals by their state or local town. This medal, given by the City of Harrisburg, Pennsylvania, was presented to Lieutenant Henry Gross of the Pennsylvania National Guard. Pershing's pursuing Soldiers entered Mexico on March 15, 1916, and split into two columns in hopes of finding the trail of Villa's forces. By early April, his forces penetrated some 350 miles over the rough and sometimes unforgiving terrain of northern Mexico. The Soldiers crossed narrow, rocky mountain passes and desert plains, as they followed trails through the Mexican countryside in search of the Villistas. On the plains, men suffered through the sweltering heat of day, and while in the mountains, they braved the freezing cold of night. Horses and pack animals grew lean from the lack of grazing and supply problems, but the Soldiers persevered. Adding to the problematic nature of the Punitive Expedition were the complications of operating in a foreign nation. The Mexican Government did not want American troops in its country, because the Mexican Army saw American forces as a hindrance to its own efforts to fight the Villistas. 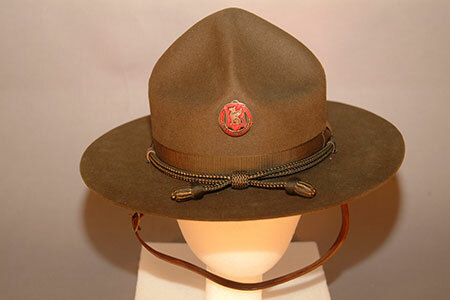 An example of the "Montana Peak" hat worn by Soldiers who served on the Mexican Border. In the end, the Mexican Punitive Expedition lasted for almost a year, but did not result in the capture or death of Pancho Villa. The American Soldiers, however, faced the adverse conditions admirably, gained valuable experience, and worked with new technologies such as airplanes, motorized transportation, and wireless telegraph (radios). The National Guardsmen, moreover, gained valuable experience in mobilization and field service. Less than a year later, these skills and experiences would serve many of them well on the battlefields of Europe during the First World War. In addition to attending college in 2004, 19 year old Dara Johnson served in the Army Reserve. Her life as a college student changed dramatically that year, as she deployed in support of Operation Iraqi Freedom. 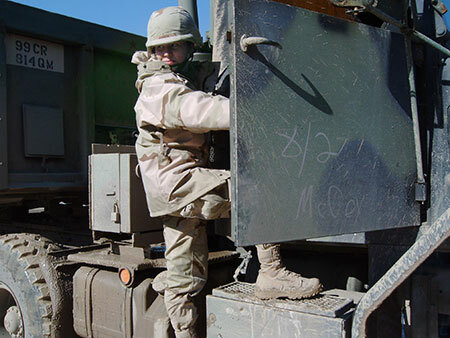 In August 2004, her supply company was mobilized to Fort McCoy, Wisconsin. Her company moved to Kuwait on October 1, and three weeks later, convoyed to Logistical Support Agency (LSA) Diamondback near Mosul, Iraq. Her service in Operation Iraqi Freedom included managing supplies and distributing food and water to other, local U.S. Army units. 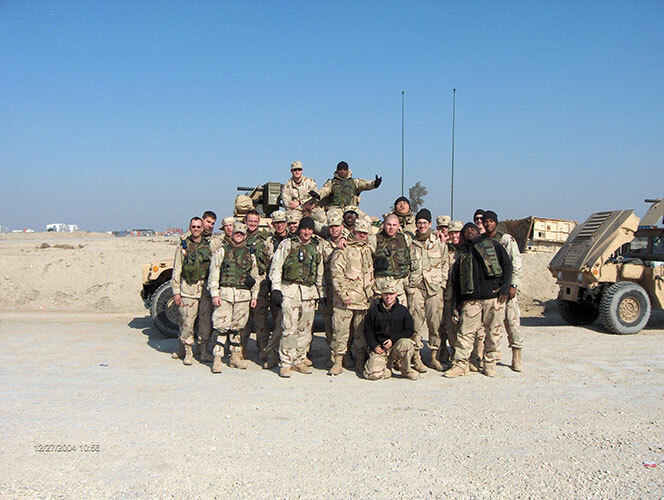 At first my family was scared about me being in Iraq: I was even scared. But now they are proud of me and always happy to hear my voice when I call home. It is hard not having my family close because they were always around, but the people I work with are like my brothers now. Was I ever afraid for my life? A lot of the time, no. But there were a couple of times I was close to getting shot. We are lucky that we haven't lost any unit members while the unit that came over here with us had several people die. Being able to get off work and go out with friends and do what I want to do is what I miss most about the US. I also miss things like going to the movies, going out to eat, and going to concerts. Specialist Dara Johnson is representative of the tens of thousands of mobilized Reservists, male and female, who transitioned from part-time service to full-time combat service, and then back to part-time service during the Global War on Terror. Specialist Johnson poses with members of her unit. A view of the supplies at Logistical Support Agency (LSA) Diamondback. Specialist Johnson poses with some of the supply of Meals, Ready-To-Eat (MREs). Johnson, and other members of her unit, at a monastery in Iraq. Celebrating Christmas while at Logistical Support Agency (LSA) Diamondback. SP4 Teddy McGhee and "Duke" simulate an attack on patrol at Quang Trang, Vietnam. Dogs have been associated with the United States Army since its inception, but for years, their role was primarily that of a mascot or in some other unofficial capacity. Not until World War II did the Army make the connection official. In January 1942, members of the American Kennel Club and other dog lovers formed a civilian organization called Dogs for Defense. They intended to train dogs to perform sentry duty for the Army along the coasts of the United States. Aware of this effort, Lieutenant Colonel Clifford C. Smith, Chief of the Plant Protection Branch, Inspection Division, Quartermaster Corps, met with his commander, Major General Edmund B. Gregory, and suggested the Army use the sentry dogs at supply depots. 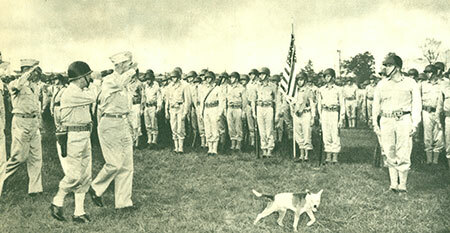 Quartermaster General Gregory gave his approval to an experimental program, and on March 13, 1942, Under Secretary of War Robert P. Patterson approved Gregory's application and created the K-9 Corps. Beginning in August 1942, the Quartermaster Corps established dog training centers at Front Royal, VA; Fort Robinson, NE; Cat Island (Gulfport), MS; Camp Rimini (Helena), MT; and San Carlos, CA. The K-9 Corps initially accepted thirty-two breeds of dogs for training, but by 1944, the number had been reduced to seven: German Shepherds, Doberman Pinschers, Belgian Sheep Dogs, Siberian Huskies, Farm Collies, Eskimo Dogs, and Malamutes. Approximately 18,000 dogs reached training centers after examination by Dogs for Defense. Almost 8,000 of those animals failed exams given at the centers, and reasons for dismissal included excitability when exposed to noise or gunfire, disease, poor sense of smell, and unsuitable temperament. The Quartermaster Corps trained dog handlers as well as the dogs themselves. Technical Manual 10-396 (July 1, 1943) outlined the training. Normal training time for a dog was eight to twelve weeks. First, the animals went through what might be called "basic training" to become accustomed to life in the military. Then the dogs received assignment to a specialized training program – sentry dogs, scout or patrol dogs, messenger dogs, or mine dogs. The Quartermaster Corps established war dog platoons in March 1944 to assist American military forces conducting offensive operations in Europe and the Pacific. Of the fifteen such platoons organized, seven served in Europe and eight in the Pacific. The Quartermaster Corps also experimented with training dogs to locate casualties on the battlefield. Dogs were first tested for this in the Medical Field Service School at Carlisle Barracks on May 4, 1944. Ultimately, the Army abandoned this program, because the dogs did not or could not make a distinction between men not wounded, men who had received wounds, or men who had died. 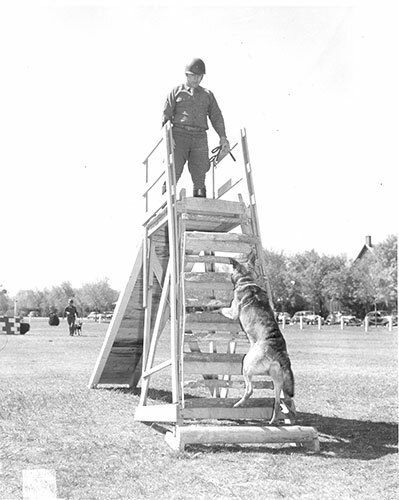 After World War II, the Military Police Corps took over responsibility for training military dogs. They continued to serve with distinction in other conflicts. It is estimated the Army employed 1,500 dogs during the Korean War and 4,000 in the Vietnam War. The courage and loyalty of these dogs have saved lives and prevented injuries since creation of the K-9 Corps. Obstacle Training during World War II. 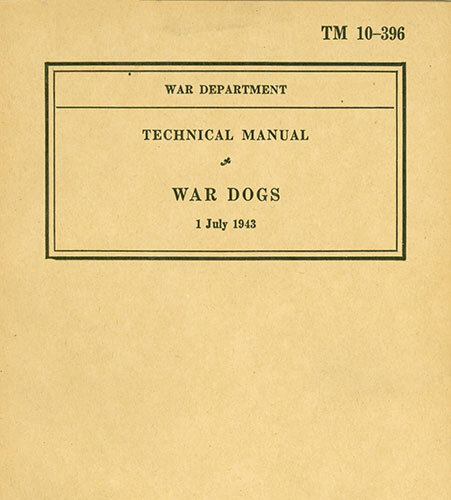 On July 1, 1943, the Army published a manual for the care and training of dogs. 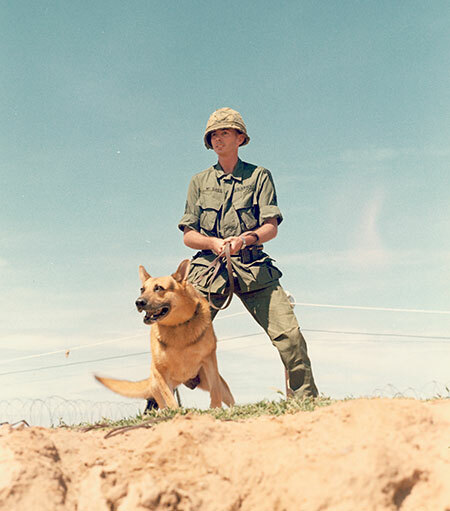 SP4 Bealock and scout dog "Chief" on patrol in Vietnam. This choke chain dog collar used by Corporal Joseph I. Lambeth, 89th Division, in training dogs at Fort Robinson, Nebraska, during World War II is part of the USAHEC Collection. Throughout the month of March, the U.S. Army, takes the opportunity to recognize the contributions of women in the military in recognition of Women's History Month. 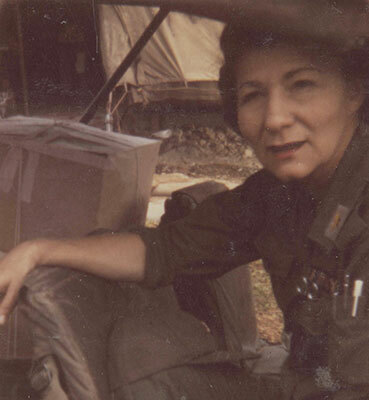 This week, the USAHEC highlights the life and service of Kathryn Singer, an army nurse, whose service spanned two conflicts, with time on four continents. Born in 1920 in Oil City, Pennsylvania, Kathryn Singer graduated from Allegheny General Hospital School of Nursing in the fall of 1941, and joined the Army Nurse Corps in February 1942. As a second lieutenant, she deployed overseas during World War II, and served as a nurse, surgical nurse, and operation room nurse from 1943-1945. She served in England prior to the Normandy Invasion, and later, served as a nurse in the 101st and 67th Evacuation Hospitals in Germany. Her unit operated near the front lines of combat during the U.S. Army's movement across Western Europe. She returned home following the end of WWII, and spent five years in the inactive reserve. Singer returned to active service in December 1950, as a first lieutenant and served as a general duty nurse at Fort Dix (New Jersey) in the early part of 1951. She deployed to Ethiopia from 1951-1954, serving at the Army Security Agency Field Station in Asmara, and then at Kagnew Station. Following further education and training in obstetrics and pediatrics, she served stateside in Valley Forge General Hospital in Pennsylvania and Fitzsimons General Hospital in Colorado. Head nurse of the 2nd Surgery Hospital, Kathryn Singer, Major. An Khe, Vietnam, 1966. In 1963, then-Major Singer deployed as the supervisor of nursing to the U.S. Army Medical Service Group in Okinawa, Japan, and two years later, moved to Vietnam as the chief nurse of 2nd Surgical Hospital (Mobile Army). Her unit, the 2nd MASH, was a 60-bed unit specializing in the treatment of wounded and burned Soldiers. 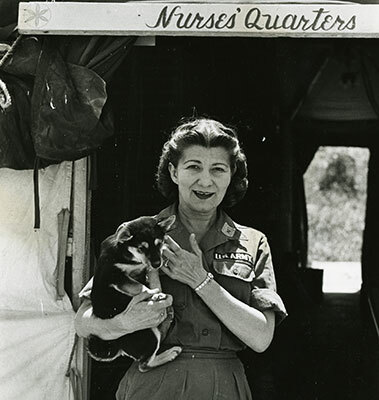 During her 2nd MASH combat tour, she paused to reflect on the role of nursing: "In a way nursing is the same the world over - in the immaculate skyscraper to the far-flung mission outpost our job remains the same - the relief of pain and suffering with compassionate understanding." Following her promotion to Lieutenant Colonel, she returned to the United States to serve in Army hospitals in New Mexico and Fort Detrick (Maryland). In 1972, Singer was promoted to colonel and served her final active duty assignment as Chief, Nursing Service, U.S. Army Hospital, Fort Campbell, Kentucky. Colonel (Ret.) Singer's awards and decorations include the Bronze Star Medal, the Meritorious Service Medal, the Republic of Vietnam Campaign Medal with 60 device, the Vietnam Service Medal with 3 campaign stars, and the World War II Victory Medal. After retiring, she lived in Carlisle, Pennsylvania. Singer poses with another Soldier in front of their hospital tents. The USAHEC is home to the Kathryn C. Singer Photograph Collection, and a separate Papers Collection, which includes services records, correspondence, memorandums, awards, letters of commendation, orders, and other materials dating from 1937-1990's. For more information about her materials, click the blue button to review the detailed finding aid for her Papers Collection. Stop by the USAHEC in March to learn more about Kathryn Singer and the many other women whose service and sacrifice have contributed to U.S. Army and American History. Many people may not realize when and where Global Positioning System (GPS) technology came to fruition. The NAVSTAR Global Positioning System was first introduced by the U.S. Air Force in the mid-1960s, eventually becoming a Department of Defense (DOD) project. The system was designed to determine positional information on Earth through the use of a constellation of orbiting satellites, with the first GPS satellite placed in orbit in 1978. Once complete, the system was to have 24 satellites, providing unlimited two and three-dimensional coverage 24 hours a day. When the U.S. Army deployed for Operation Desert Shield in 1990, 16 NAVSTAR satellites were in orbit, providing a guaranteed three-dimensional coverage lasting only about 19 hours. The new devices had a built-in error of only sixty feet compared to earlier land based systems with up to eight miles in expected error. 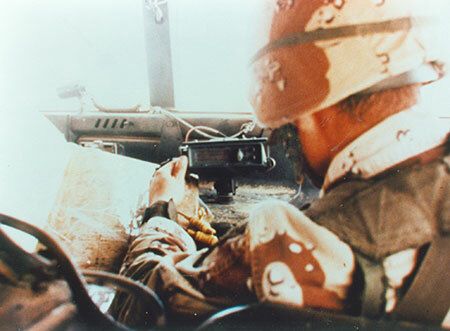 By 1991, GPS had been utilized for more than ten years by aircraft, Special Operations teams, and in limited training missions, however the system was relatively unknown to much of the Army at the time. During Operation Desert Shield, Special Operations teams were inserted behind Iraqi lines for missions that would have been unthinkable without GPS. With a large-scale operation against the occupying Iraqi Army on the horizon, Army commanders realized the need to supply front-line units with the GPS devices. The problem was the limited number of devices on hand. In an October 1991 newsletter, the Center for Army Lessons Learned (CALL) noted only 500 demonstration receivers were owned by the Army at the outset of Operation Desert Shield. As a result, commercial receivers were rapidly procured. Still, when operations started on February 24, 1991, only selective units and vehicles were equipped with the new technology. For example, of the VII Corps' 40,000 vehicles in theater, only 3,000 received a GPS unit. Those vehicles needing the devices often included forward and reconnaissance elements, unit commanders, and artillery surveyors. In addition, there were instances of troops buying their own GPS devices, or requesting they be sent from home. Lieutenant General Frederick Franks, the VII Corps commander, noted after the war, "They [GPS receivers] were invaluable in avoiding fratricide and allowing accurate navigation and artillery fires." GPS can be quite useful in a featureless landscape. 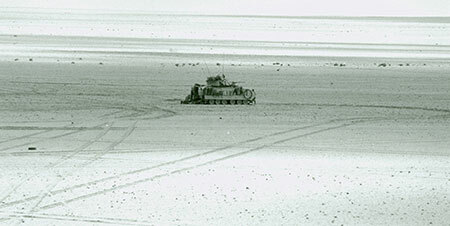 This Bradley Fighting Vehicle from the VII Corps may be relying on GPS to navigate in a sea of sand. G-day came on February 24, beginning at 0400. U.S. Army units in both the VII Corps and XVIII Airborne Corps quickly realized the value of the GPS units. With the unexpectedly rapid advance of coalition forces, heavy reliance was placed on these small devices while navigating in a featureless and potentially unforgiving desert landscape. The 24th Infantry Division used the receivers to link phase lines for the assault, helping to maintain command and control. Although seven different types of GPS devices were used during the war, two models comprised the clear majority. 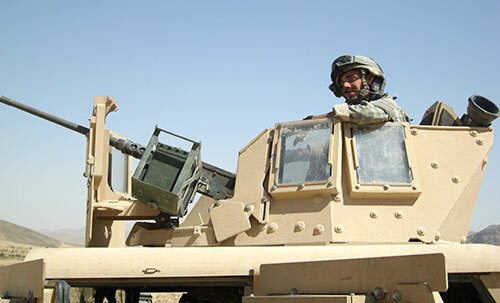 The AN/PSN-10 Small Lightweight GPS Receiver (SLGR, pronounced "slugger") was favored, with approximately 4,000 devices deployed. The SLGR is a small rectangular, box-like, hand-held unit developed by Trimble Navigation. It weighs about four pounds and can also be mounted to a vehicle or aircraft. The second most prevalent device was the NAV 1000M Receiver, made by Magellan, still a leading company in GPS technology. It is smaller than the SLGR and is powered by AA batteries. Approximately 1,000 of these devices were utilized during the war. This Trimble Navigation SLGR is part of the USAHEC Collection. 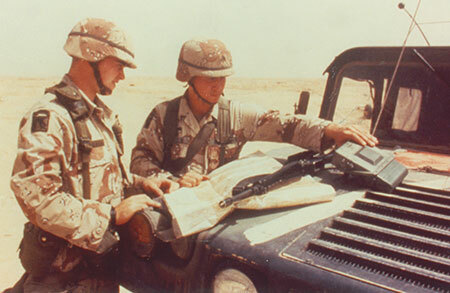 The relatively new Global Positioning System receivers aided the U.S. and coalition forces in winning Operation Desert Storm, after only four days of ground combat. It was the first major land campaign involving the widespread use of GPS, which certainly aided in the speed and accuracy of the advance. Thus, space-based navigation technology joined the U.S. military's arsenal of combat capabilities. By 1995, all 24 NAVSTAR satellites were in orbit, providing world-wide coverage 24 hours per day. Today, GPS technology is prominent in both military and civilian applications. From weapons systems and precision guided ordnance to individual receivers for our warfighters abroad, GPS requirements are now essential. The system has advanced our nation's navigational abilities and warfighting capabilities to a very high standard. A Soldier Always: Remembering the Life of LTG (R) Harold G. Moore, Jr. Lieutenant General (Ret.) Harold 'Hal' G. Moore, Jr. wrote these words in a letter to his wife, Julie, ten days after the Battle of Ia Drang in November 1965. The first major engagement of the Vietnam War proved difficult, as Americans faced an unfamiliar enemy with new fighting tactics. In spite of these challenges, then-Lieutenant Colonel Hal Moore bravely led his troops from the 1st Battalion, 7th Cavalry Division into the fray. After the battle, the 1st Cavalry Division was awarded a Presidential Unit Citation, and Moore received the Distinguished Service Cross (the second highest military award given a member of the U.S. Army for heroism) for his actions during the battle. Most famously known for his role in the Battle of Ia Drang, Moore passed away on Friday, February 10, 2017 at the age of 94. Portrayed in the movie, We Were Soldiers, Moore's role in the Battle of Ia Drang is the most well-known piece of his history, but it only scratches the surface of his faithful service spanning three decades. He graduated from West Point near the end of World War II, and his career in the Army took him around the world, including service in both the Korean War and the Vietnam War. 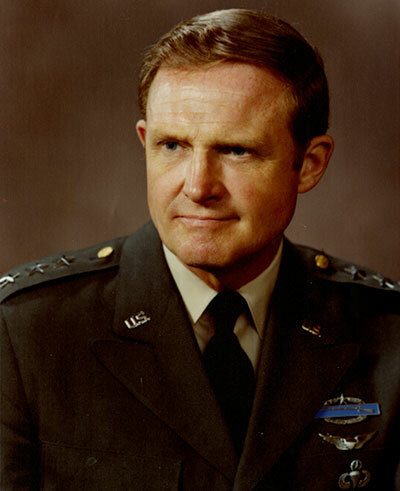 He served in a variety of positions, both in combat and out, culminating as the Commanding General, U.S. Army Deputy Chief of Staff for Personnel in 1974. He served in that role until his retirement in 1977. Years after his retirement from the Army, Moore partnered with journalist Joseph Galloway to write We Were Soldiers Once...and Young, detailing the experience of 1st and 2nd Battalions of the 7th Cavalry Regiment in the Battle of Ia Drang, and they later wrote, We Are Soldiers Still: A Journey Back to the Battlefields of Vietnam, discussing the experience of returning to the Ia Drang Valley forty years after the battle. Known and widely respected for his leadership and dedication to his troops, Moore was also a devoted family man. He had five children with his wife, Julie, to whom he was married for 55 years. His devotion is evident in the letters he wrote to his wife while separated by distance at various points throughout his career, many of which are currently being processed at the U.S. Army Heritage and Education Center. The USHAEC is honored to be home to the Harold G. Moore Jr. Collection, which includes official documents, photographs, letters, scrapbooks, and research materials for his books, among other items. Archivists at the USAHEC are currently processing the collection, to organize and identify the materials and prepare them for use in the USAHEC's research library. Though these materials are not yet available to the public, the USAHEC does have a small tribute to Moore on display in the exhibit, "Courage, Commitment, and Fear: The American Soldier in the Vietnam War," which features his photo and one of his letters to Julie - written the morning the Battle of Ia Drang began. A few examples of the materials from the Harold G. Moore Jr. Collections are below, and an announcement will be published once the full collection is available. The USAHEC salutes the incredible life of service and sacrifice of this American hero. In November 2008, Mr. Joseph Galloway, Lieutenant General Moore's co-author on We Were Soldiers Once...and Young and We Are Soldiers Still: A Journey Back to the Battlefields of Vietnam, presented a Perspectives in Military History Lecture at the USAHEC regarding their experience returning to the Ia Drang Valley. Two USAHEC staff members work to process materials in the Harold G. Moore Jr. Collection. A Joint Operations Graphic of Vietnam, with labels indicating the location of An Khe, Pleiku, Plei Me, and the Ia Drang Valley. 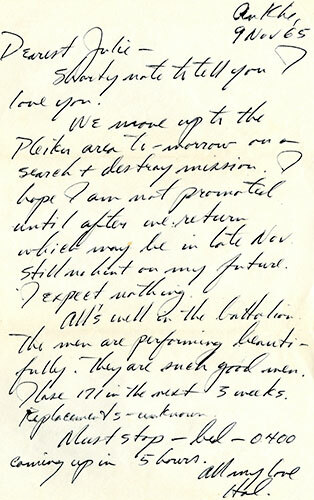 Letter from Moore to his wife, Julie, dated 9 NOV 1965, less than a week before the Battle of Ia Drang. Lt Gen Hal Moore, USA - Ret. 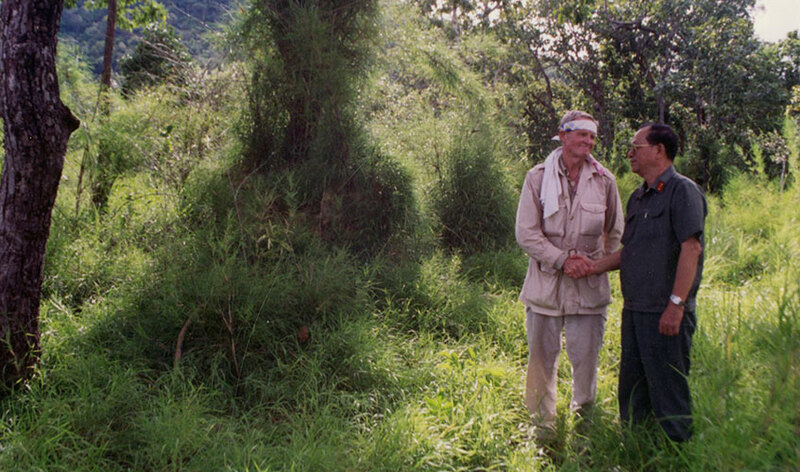 & Lt. Gen Nguyen Hui An, DAVN shake hands on the LZ X-Ray battlefield on 17 OCT 1993. The field their forces fought each other in a savage battle in NOV 1965. LTG Moore's son, Stephen, sent this message in May 1992, with suggestions for the book title. A year later, LTG Moore annotated the message with a note about the title they selected. This scrapbook is part of the Harold G. Moore Jr. Collection. A box of folders containing some of Moore's research materials for We Were Soldiers Once...and Young. A variety of materials donated by Moore, currently being processed by USAHEC staff. 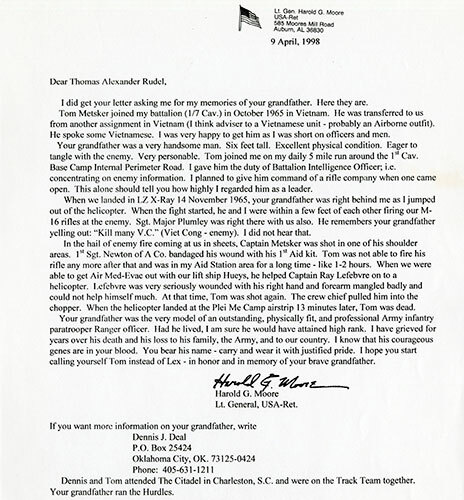 A letter from Moore to Thomas Rudel, the grandson of Tom Metsker - a Soldier who served under Moore and was killed at the Battle of Ia Drang. A portion of the USAHEC's "Courage, Commitment, and Fear: The American Soldier in the Vietnam War" exhibit, which contains an image of Moore, along with the letter he wrote to his wife, Julie, the morning the Battle of Ia Drang began. The red and yellow on the MACV patch came from the colors of the ARVN flag. The red ground alludes to the infiltration and aggression from beyond the embattled wall (i.e. the Great Wall of China). The opening in the wall, through which the infiltration and aggression flows, is blocked by the sword representing the United States military aid and support. The wall is arched and the sword pointed upward in reference to the offensive action pushing the aggressors back. February 8, 1962 marks the founding of the headquarters of the Military Assistance Command Vietnam (MACV) at 606 Tran Hung Dao in the Cholon District of Saigon. MACV was the logical evolution of its predecessor, the Military Assistance Advisory Group (MAAG) program. In September 1950, by the direction of President Eisenhower, the MAAG program of the United States aided the French government engaged against the Viet Minh in Vietnam. The U.S. assistance consisted largely of military equipment, mainly older equipment and ammunition remaining from World War II stock. Monetary aid rose from 10 million dollars at the onset of support to $350 million by 1953. When President John F. Kennedy directed support to assist South Vietnam's President, Ngo Dinh Diem, in 1960, the program expanded by placing advisors in every unit of the Army of the Republic of Vietnam (ARVN). The new Commander of MACV (COMUSMACV), General Paul D. Harkins, began with 680 personnel under his authority. The 680 eventually grew to over 9,000 advisors and staff, with 10 field offices throughout South Vietnam. Initially, many of these advisors took the form of Special Forces Units, also known as Green Beret teams. Their immersive training was state-side at the U.S. Army Center for Special Warfare/U.S. Army Special Warfare School located on Fort Bragg and included language, cultural customs, politics, and other subjects for officers and enlisted men and were emphasized with expertise in artillery, armor, infantry, engineering, and a variety of military occupational specialties needed for the operations MACV supported. With each new MACV Commander, the mission evolved. In June of 1964, when General William Westmoreland became COMUSMACV, the headquarters reestablished itself on the Tan Son Nuht airbase. American "boots on the ground" began arriving and MACV assumed responsibilities for more than just military operations. It now required a complete Joint or "J" staff organization, which included finance, medical, political, supply, agricultural, and a myriad of other attached groups needed to both run and rebuild a country. 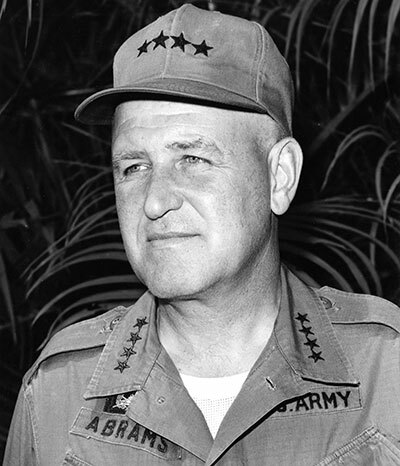 General Creighton Abrams commanded MACV from June 1968 - June 1972. General Creighton Abrams took command from Westmoreland in 1968 and subsequently re-focused the program a year later to follow newly-elected President Nixon's directive on "Vietnamization." MACV goals again shifted, and concentrated on transferring the execution of the war to more Vietnamese units, along with pacification programs. While MACV still followed the same basic command structure, operational plans and directives were often coming straight from the Chief of Staff of the Army or even the President's desk. These reporting relationships gave General Abrams access to more than 500,000 men, hundreds of naval vessels, and thousands of aircraft of all types. A second command that developed out of MACV during the war was the Military Assistance Command Studies and Observations Group (MACSOG). Their mission was to conduct recon, rescue, PSYOPS, and other operations ranging from Vietnam (North and South) to Cambodia and Laos. These "special operators" evolved into the Army, Navy, and Air Force spec ops teams of today. A primary objective was the interdiction of the Ho Chi Minh Trail, known to the North Vietnamese as the Truong Son Road. Successful at times in preventing supplies from reaching bases in Cambodia and Laos, they did not completely sever this supply route as noted by the North Vietnamese Army Tet Offensive in January of 1968. Many of the records of the MACV and MACSOG commands can be found in the archival collections of the U.S. Army Heritage and Education Center (USAHEC), with details on operations such as Dawson River (Khe Sanh), Lam Son 272 with the 2nd ARVN Division, as well as after-action reports and photographs from various sources. For more information on these collections, go to the USAHEC website (www.usahec.org), and click on the Library and Archives button. Additionally, the exhibit, "Courage, Commitment, and Fear: The American Soldier in Vietnam," is currently on display in the USAHEC's Soldier Experience Gallery. This exhibit highlights the divisions that participated in the Vietnam War by region. John Grayson, Regimental Quartermaster Sergeant, 5th Massachusetts Volunteer Cavalry Regiment. February is African American History Month, and the U.S. Army, along with the nation, honors the contributions African-Americans have made throughout history. This week's Historical Highlight honors an African-American Soldier, who fought for the Union Army in the Civil War. 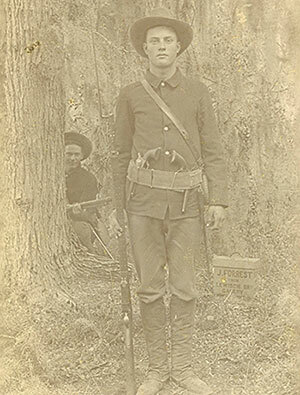 Until recently, the Soldier was unidentified in a photograph that is part of the USAHEC Collection. Research and investigation, however, brought renewed significance to the image, as USAHEC staff discovered the name of the Soldier. The National Museum of the U.S. Army, scheduled to open at Ft. Belvoir, VA in 2019, recently contacted the USAHEC to request images of Civil War Soldiers for a gallery. The USAHEC provided a selection of images, including an unidentified carte de visite [visiting card] of a regimental quartermaster sergeant of the African-American 5th Massachusetts Volunteer Cavalry. The image is part of the Military Order of the Loyal Legion of the United States (MOLLUS) - Massachusetts Commandery Collection. The USAHEC Archive includes a published roster of the 5th Massachusetts, but the non-commissioned officer staff did not include a regimental quartermaster sergeant. A previous effort to identify the Soldier apparently ended here but a careful reading of the entire roster revealed that Private John Grayson of Company C had been promoted to regimental quartermaster sergeant on September 18, 1864. This identification allowed staff to learn more about Grayson and his life. Grayson was born in Providence, Rhode Island about 1834 and was a 29-year-old chemical worker from Worcester, Massachusetts, when he enlisted on January 4, 1864. He served with the African-American 5th Massachusetts Volunteer Cavalry Regiment in Virginia and Texas, until he mustered out on October 31, 1865. John Grayson was working as a blacksmith in Leominster, Massachusetts, when he died of consumption on August 9, 1868. He was buried in St. John's Cemetery in Worcester, Massachusetts, beneath a plain marble headstone provided by the government. His previously unidentified photograph is a powerful visual reminder of African-African Soldiers in the Civil War, and provides an example of the service and sacrifice of African-Americans throughout United States' history. A photograph of James W. Van Dusen, taken on January 23, 1902. "Stationed at Zambo Auga Island, one of [the] landing party from the Glacier, U.S.N., not returning from a spring with water, was found dead, pinned to the earth with these two spears." One of the barbed spear points used by Moros in the Philippines on Zambo Auga Island. In addition to the weapons, Van Dusen also brought home examples of Moro armor, including a plate mail shirt and a couple helmets. These examples of protective equipment were ineffective against the U.S. Army's weaponry at the turn of the century. Captain Van Dusen remained on active service following the Philippine Insurrection, was promoted to Colonel in 1917, and honorably discharged in 1920. He died in Washington, D.C. in 1923. The items collected by Colonel Van Dusen are now part of the USAHEC Collection, and some of them, including the spears, plate mail shirt, and helmets referenced above, are currently on display in the USAHEC's Soldier Experience Gallery. Hand sewn Moro Tribe Flag. Moro edged weapons, called barongs, in artifact storage at the USAHEC. Example of the intricate detail found on some of the barongs. An asymmetrical dagger, known as a kris, used by the Moros during the Philippine Insurrection. A plate mail shirt used by the Moros. A wicker helmet used by the Moros. Some of Colonel Van Dusen's collection is on display in the USAHEC's Soldier Experience Gallery. The inauguration for the next President of the United States is Friday, January 20, 2017, and this week's Historical Highlight marks that event by focusing on a remarkable item, recently discovered in the USAHEC Collection. 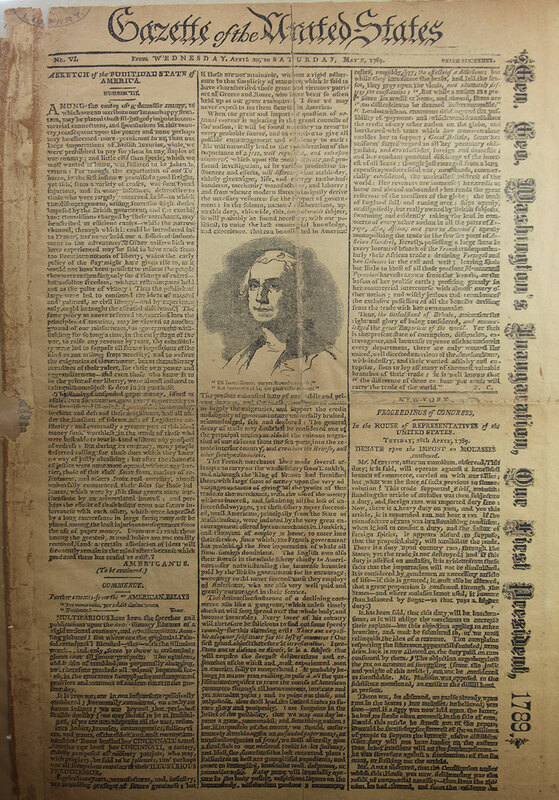 Found amongst a donated collection of assorted periodicals, this newspaper highlights the inauguration of President George Washington, the first President of the United States. 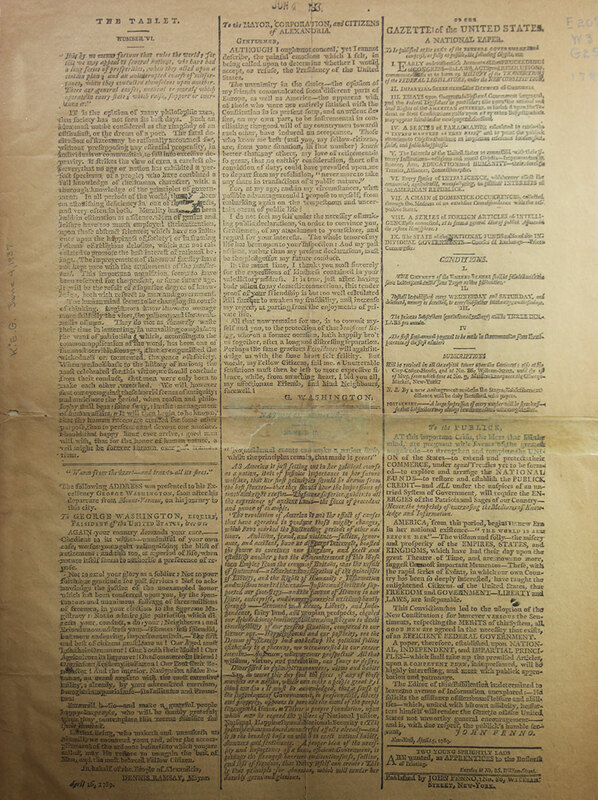 The Gazette of the United States was a newspaper edited by John Fenno, which printed its first issue in mid-April 1789. 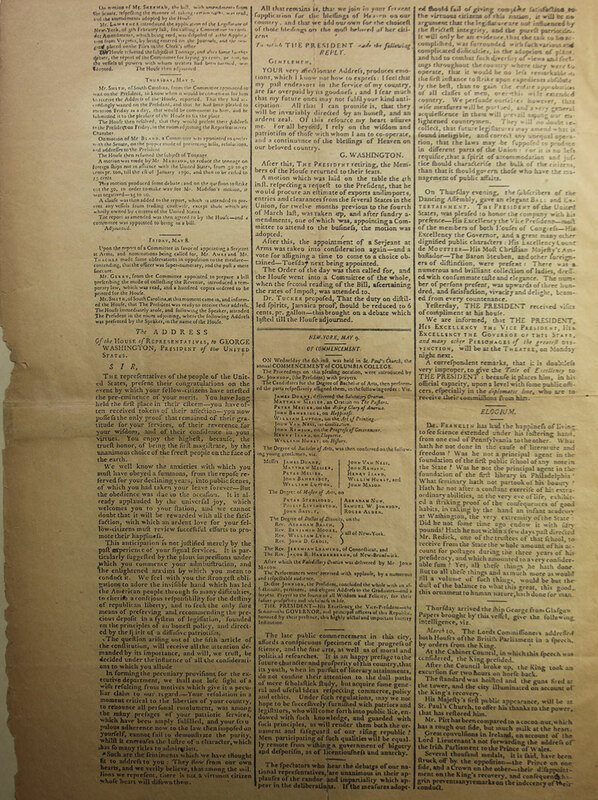 It was a popular Federalist newspaper, printed originally in New York City, before re-locating to Philadelphia after the nation's capital moved. 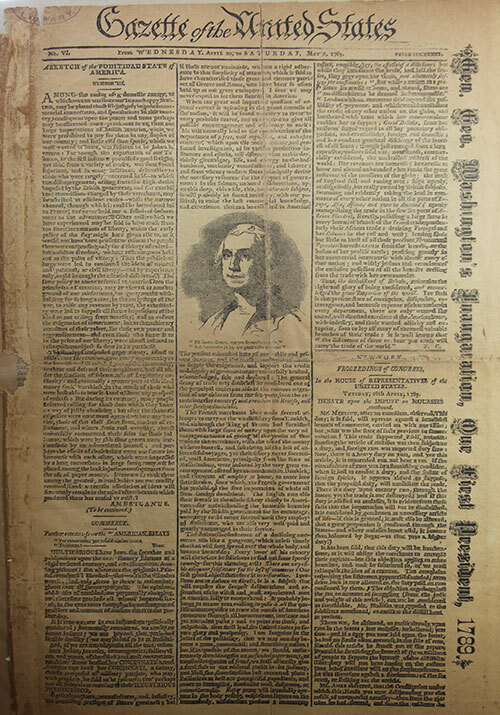 This special issue is dated Wednesday, April 29 to Saturday, May 2, 1789, and covers President Washington's first inauguration in detail. This issue provides a day-by-day account of the inaugural activities, describing the various events attended by Washington and presenting information regarding the proceedings of congress. The articles include, "A sketch of the political state of America" - a short article describing the inaugural procession and ceremony; Washington's inaugural speech to the Houses of Congress; an address presented to George Washington upon his departure from Mount Vernon on his journey to New York by Dennis Ramsay, Mayor of Alexandria, Virginia; an address by Washington in reply to the Mayor of Alexandria; and a congratulatory address from the House of Representatives to President Washington, with reply. In addition to the news of the inauguration, the issue also contains other snippets discussing daily life, including a list of graduates from Columbia College and a list of recently-arrived vessels at the Port of New York. Due to the historical significance and the age of the item, it is part of the Rare Books Collection and will not regularly circulate. Nevertheless, it is a significant and exciting addition to the USAHEC Collection! Browning Automatic Rifle (BAR) in the USAHEC Collection. John Moses Browning was born near the end of January in 1855. A gunsmith's son, he grew up under the training of his father, Jonathan Browning, and designed and built his first firearm by the age of 15. His work spanned almost 60 years, and he is credited with 128 patents and over 100 different weapons. His contributions to the U.S. Army began with the development of a machine gun. 2LT Valmore A. Browning firing a Browning Machinegun. Capacity 500-600 shots per minute. Belt capacity 250 cartridges in a box, 8 boxes to a gun. This gun was used in the Argonne Sector and is being tested by Lt. Browning at Thillombois, Meuse, France, 5 October 1918. In 1916, Browning finally interested the Army in a machine gun he developed in 1905. The Army saw the need for an efficient rapid-fire gun to complement the French Hotchkiss, the British Vickers, and the German Maxim. Browning's weapon went through the Army's trials process in May 1917. It was accepted, and manufacturing began, with the weapon designated the .30 Caliber, Browning M1917 Heavy Machine Gun. The gun was a belt-fed, water-cooled design and usually required six to eight men to operate it. One man would fire, while a second fed the belt into the weapon, and the other men carried ammunition and spare parts. Colt, Remington, and Westinghouse produced over 70,000 of the guns in the initial production run. The size was problematic at times, so Browning simplified the design and created an air-cooled machine gun, the M1919, which was smaller and lighter. While developing his heavy machine gun, Browning also worked to create a light machine gun that could be carried and used by one individual. The weapon was designated as the Browning Automatic Rifle, Model of 1918, .30 Caliber, or the BAR. 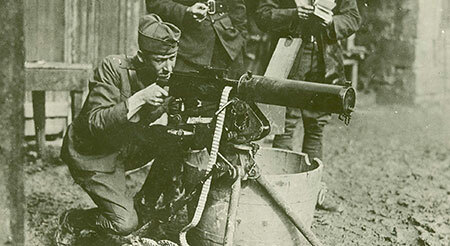 This machine gun was a gas-operated, air-cooled, magazine-fed handheld weapon, and saw service at the very end of World War I. The weapon was ideal for the French tactics of the late war period. A group of soldiers could advance over no-man's land while using mobile automatic weapons to pin down the enemy. The 20 round magazine limited the rate of fire, so the BAR was used primarily as a mobile light machine in the trenches. John M. Browning's son, Lieutenant Valmore A. Browning, was a machine gun instructor in the U.S. and France during World War I. The BAR saw heavy action in World War II and Korea, but by the 1960s the development of the M14 and M16 rifles made the BAR obsolete. 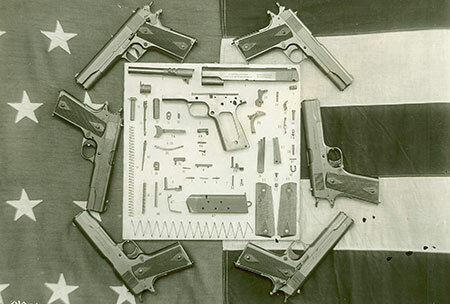 Component parts of the Colt M1911 Pistol. Another Browning designed weapon used by the Army is the Automatic Pistol, Caliber .45, M1911. Adopted in March 1911, the pistol replaced the smaller and less powerful .38 Caliber Long Colt revolvers. The .45 had better stopping power, and Browning's simple design made it easy to operate and clean. The short recoil design of the M1911 is the basis for almost all the modern self-loading handguns. 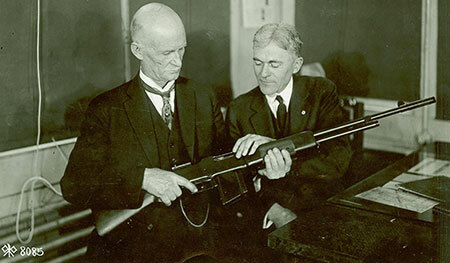 John M. Browning's prolific work on weapons and weapon systems has contributed to the safety of our armed forces ever since. Maj. Gen. Charles H. Bonesteel pins the Distinguished Service Cross of Maj. Conrad V. Anderson. On January 2, 1918, as the First World War was reaching the height of its intensity, President Woodrow Wilson established the Distinguished Service Cross to recognize the heroic efforts of Soldiers in the U.S. Military. While President Wilson was ultimately the one to fully establish the award, it was General Pershing, Commander-in-Chief of the American Expeditionary Forces in France, who campaigned the hardest for its creation. General Pershing felt the actions of Soldiers not appropriate for the awarding of the Medal of Honor should still be recognized, similarly to the European Armies. Upon the establishment of the Distinguished Service Cross (DSC), Soldiers whose gallantry may have gone unrecognized were now properly awarded. 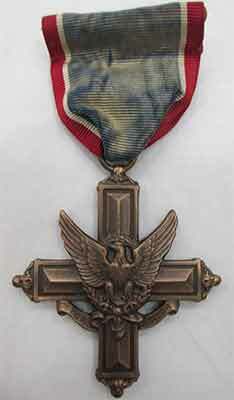 Major Conrad V. Andreson's Distinguished Service Cross (DSC), part of the USAHEC Collection. Fast forward to 1943, during a skirmish in the Tunisian town of Sedjenane, Lieutenant Conrad V. Anderson and his battalion found themselves caught in a German Army "trap," when an onslaught of 88mm shells bombarded their position. After being severely wounded, the battalion commander placed Anderson in charge. Unaware a withdrawal had been ordered, Anderson stopped the men from retreating and placed them in the best defensive position possible. Once his Soldiers were in place, Anderson radioed in the approximate positions of the enemy artillery to three U.S. artillery battalions, who subsequently destroyed the majority of the German artillery stationed around Anderson's battalion. With assistance from an additional battalion, Anderson pushed through the German forces in the mountains and gained a position in the valley, before reaching the towns of Mateur, Tunis, and Bizerte. After turning a situation of near-defeat into an indisputable triumph, Anderson, now a Major, was recognized for his heroism in the Battle of Sedjenane. On Sunday, April 9, 1944, Major General Charles H. Bonesteel awarded Major Anderson the Distinguished Service Cross for his efforts in leading his fellow Soldiers to safety amidst harrowing circumstances. Despite Anderson being no stranger to heroism (he once rescued over 30 men after the sinking of the U.S.S. Leedstown), this was perhaps his finest hour and serves as a fitting reminder of what the Distinguished Service Cross represents. 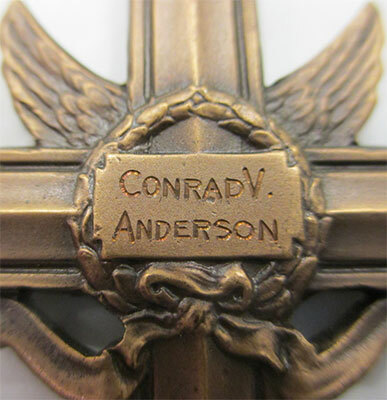 Major Conrad V. Anderson's name engraved on the back of his DSC. 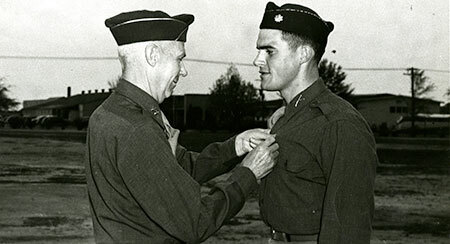 The Distinguished Service Cross is awarded to a person who "distinguishes himself or herself by extraordinary heroism while engaged in an action against an enemy of the United States; while engaged in military operations involving conflict with an opposing/foreign force; or while serving with friendly foreign forces engaged in an armed conflict against an opposing Armed Force in which the United States is not a belligerent party." In order to be awarded the Distinguished Service Cross, an act of heroism must have involved the risking of one's life in a circumstance so extraordinary it sets the individual apart from the rest of his or her comrades. Lieutenant Conrad V. Anderson was one of those brave Soldiers, who demonstrated his bravery and courage during World War II. Corporal Span saved this program from the December 1944 Chanukah celebration he participated in while serving in the U.S. Army. 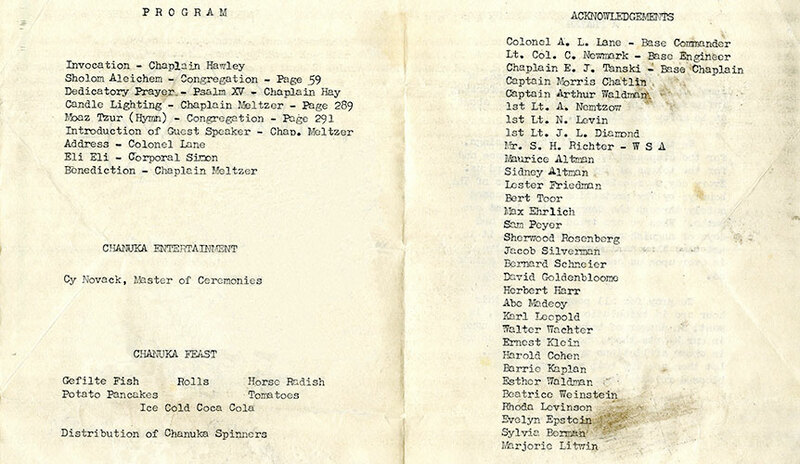 The program lists the entertainment, menu, formal participants, and a prayer for the holiday recognition. Chanukah is the eight-day, Jewish "festival of lights," and this year, it begins the evening of Saturday, December 24, 2016 and ends the evening of Sunday, January 1, 2017. 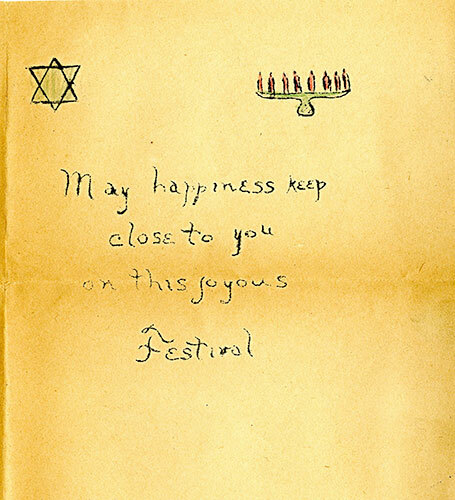 In celebration of Chanukah, this week's Historical Highlight examines a items in the USAHEC Collection related to Jewish Soldiers, including examples of Chanukah celebrations during World War II. The tradition of sending cards for the holidays is far from a modern idea. The custom has existed for hundreds of years, and will likely exist for hundreds more. Despite the fact that cards often feel like an obligatory part of the holiday season, for some people, they hold great significance. In the case of Soldiers, holiday cards have long been a way to stay in contact with loved ones separated by distance. They also act as a beacon of hope, imbuing both Soldiers and family members with feelings of joy and peace at a time when those feelings are fleeting. 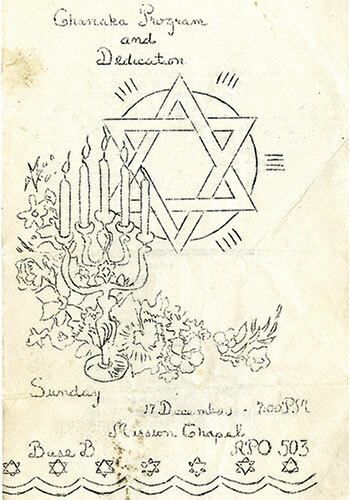 During the Second World War, feelings of hopelessness often pervaded the Soldier's mindset, and holiday cards were a way to inspire faith and hope for the future at a time when thousands of lives were sacrificed to protect similar values and ideals. As a Jewish Soldier fighting in the Second World War, Corporal Murray Span experienced this firsthand, as he found himself thrust into a conflict revolving around the very faith he practiced. He was fighting for his country, but also for those who shared his ideals and religious devotion. As a part of the 399th Infantry Regiment stationed in France, Span saw the destruction of churches and synagogues, places that once offered sanctuary in the form of faith. The homes of those who practiced their faith in those religious refuges were abandoned, as families fled or were captured. In the midst of the overwhelming shadow of war, Span and his fellow Soldiers were able to find hope in a familiar place. While most of the old churches were destroyed, Span and his fellow Jewish Soldiers found a safe haven at one of the few the churches remaining in France. At weekly services, Span, along with the rest of the Jewish Soldiers in his company, had the opportunity to establish close and cordial relationships with each other, and come together to celebrate their religious heritage. To the Jewish Soldiers fighting in World War II, these interactions acted as diversion from the harsh and unforgiving realities of war, and as a means of self-expression in a time when inspired personal faith and devotion could be extinguished at any moment. More of Corporal Span's story can be read in the letters and manuscripts, which comprise the Murray Span Collection at the USAHEC. 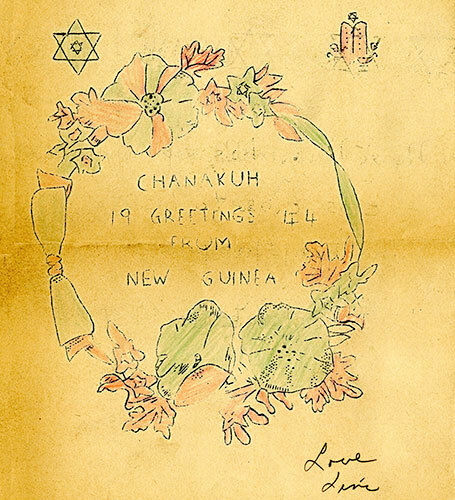 Created in New Guinea in 1944 to celebrate Chanukah, this card is now part of the USAHEC Collection. 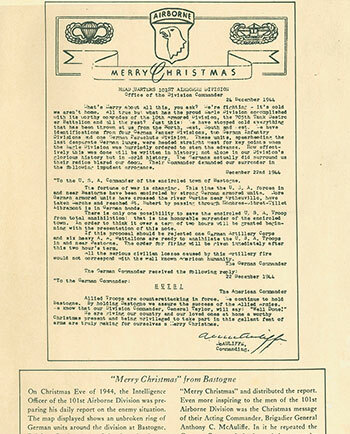 BG McAuliffe's Christmas message to his troops. In December 1944, American troops and their Allies advanced through Europe with the goal of routing the Axis and bringing an end to World War II. Unknown to them, during this very cold and snowy winter, Adolf Hitler and his generals secretly plotted an offensive of their own, which came to be known as the Battle of the Bulge. On December 16, the Axis forces attacked with great ferocity, pushing back the American lines, creating the "bulge." The German leadership planned well - attacking in a sparsely guarded portion of the lines where the U.S. 106th Division, new to the theater, was stationed. The freezing, tired, and inexperienced American Soldiers were taken by surprise, and many became casualties. As the Germans troops advanced, it became clear to both sides that two Belgian cities were lynchpins to the entire operation: St. Vith and Bastogne. St. Vith fell, leaving Bastogne as the major obstacle standing in the way of the Germans. Brigadier General Anthony C. McAuliffe. On December 22, 1944, the Germans surrounded Bastogne, and their artillery pounded the city. The U.S. 101st Airborne Division and elements of the 9th and 10th Armored Divisions occupied Bastogne. The 101st Division Commander, Major General Maxwell Taylor, had been sent to Washington, D.C., and Brigadier General Anthony C. McAuliffe, the Division Artillery Commander, had command. Fighting was intense, and the situation was bleak. Suddenly and unexpectedly, a German delegation consisting of a major, a captain, and two enlisted men showed up under the cover of a white flag bearing a message demanding the Americans surrender. Brigadier General McAuliffe read the message, and then, it is said, one of his officers uttered in a disbelieving voice, "They must think we are nuts!" Huddling with his officers, BG McAuliffe formulated a reply that summed up their reaction to the German proposal: "NUTS!" Nothing more needed to be said. GIs slog it out during the harsh winter weather. The German soldiers carried his reply back, and the battle resumed. 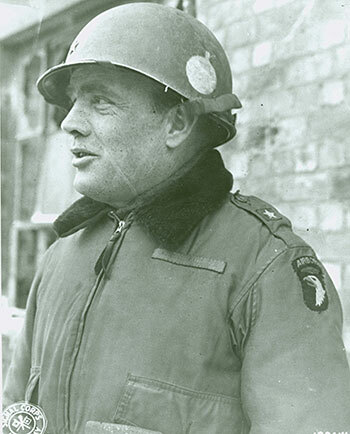 BG McAuliffe and his Soldiers held Bastogne, which was later relieved by a column of George C. Patton's Third Army. 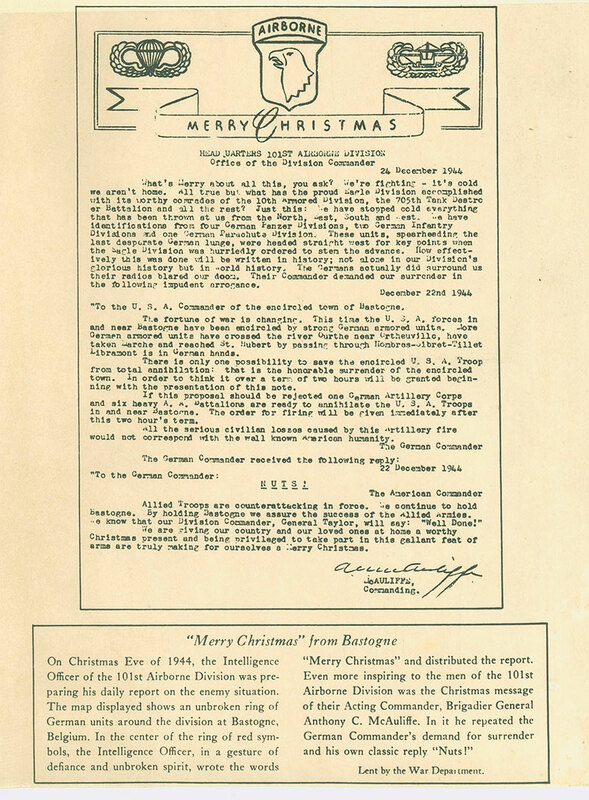 Several days later, General McAuliffe reprinted the German message and his reply in his Christmas newsletter to the troops. Needless to say, his words and actions were well received by the GI's, boosting their morale. Their commander summed up in words what they had known for a long time: American Soldiers stick together, fight together, and win together! The handle for the Heiland Research Corp flashgun served as the inspiration for Luke Skywalker's lightsaber. In honor of the release of Rogue One: A Star Wars Story, this week's Historical Highlight examines several items in the USAHEC Collection, which have a connection to the Star Wars films. Though George Lucas invented many of the characters, worlds, languages, and beings when creating the Star Wars universe, he did find inspiration in some real-world items, specifically when designing weapons. Perhaps the most iconic weapon from the movies, the lightsaber drew inspiration from a piece of camera equipment. 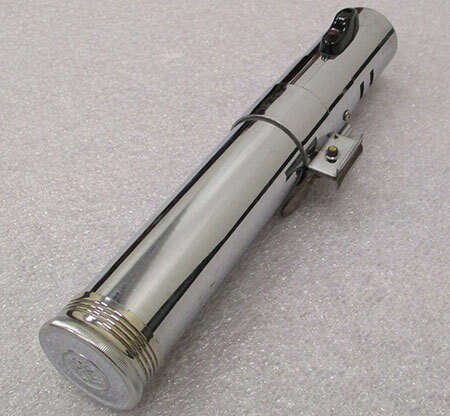 Luke Skywalker's lightsaber was modeled after the handle/battery holder of the Heiland Research Corp. flashgun, a large flash used in conjunction with a camera. An example of this handle is part of the USAHEC's Paul Vernon Frakes Collection, which contains a number of World War II-era items, including medals, photographs, and pieces of camera equipment he used in conjunction with the flashgun base. Frakes served overseas in World War II as a photographer and gunner in the Army Air Forces, and spent time in North Africa and Europe during his service. 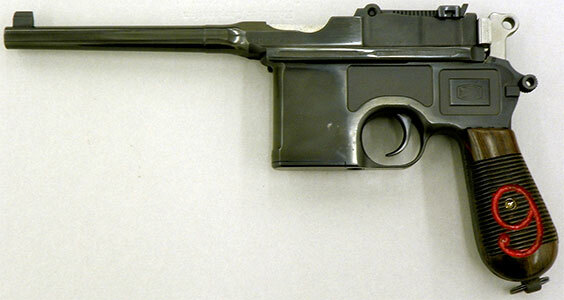 The Mauser C96 pistol served as the model for the BlasTech DL-44, most famously used by Han Solo. In addition to the "lightsaber," the USAHEC's Collection is also home to a couple of weapons, which inspired the blasters in Star Wars. The German Mauser Construktion 96 (C96) pistol, nicknamed "Broom Handle" for its attachable wooden stock, served as the BlasTech DL-44 - Han Solo's weapon of choice. Though modified for the movies, a side-by-side comparison of the weapons shows the very evident similarities. The Maschinengeweher 34 (MG34), another German weapon, inspired the DLT-19 Heavy Blaster Rifle used by the Galactic Empire, most often by Stormtroopers. The USAHEC received both of these weapons through donations, and they are representative of war souvenirs, likely picked up on a battlefield during the first half of the 20th century. Even in the vast, imaginative world of galaxies far, far away, there are still hints of history. May the Force be with you. The MG34 inspired the DLT-19 Heavy Blaster Rifle used by the Galactic Empire. Seventy-five years ago, news of the attack on Pearl Harbor traveled from the islands of Hawaii and shocked the American mainland. The Japanese targeted Army and Navy assets, including Schofield Barracks, Wheeler Field, Hickham Field, and battleships in the harbor. Tactically planned to destroy important components of the Pacific Fleet and prevent U.S. forces from interfering with Japanese actions in the Pacific, the attack killed nearly 2,400 Americans, and damaged or destroyed numerous ships and aircraft. Unprovoked and unexpected, this action propelled the United States into World War II, and rapidly accelerated the transformation of the U.S. Army. 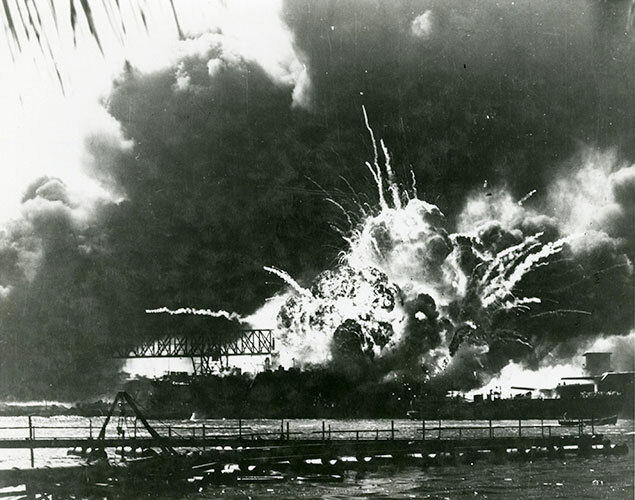 The USAHEC Collection contains numerous items related to the attack on Pearl Harbor, including photographs of the damage, audio of news bulletins announcing the attack, videos compiled by the U.S. Army, archival materials documenting the attack as it unfolded, and letters/recollections of those who witnessed it. Take a moment to honor the anniversary, and scroll through the photos of the damage, watch the video produced following the attack, or read the staff duty log from the 25th Infantry Division Headquarters. Click on the blue button to read the seventeen page report logging the communications of December 7, 1941, which illustrate the confusion and terror caused by the surprise attack. These items are a few examples of the incredible pieces held at the USAHEC, available to researchers and general visitors alike. Finally, if you're an educator, click HERE to view the lesson plan about Pearl Harbor, created by the USAHEC's Visitor and Education Services Division staff, which uses primary sources from the collection to illustrate the impact of the attack. Pearl Harbor, Hawaii... The magazine of the destroyer USS Shaw (DD-373) explodes during the attack by Japanese aircraft. 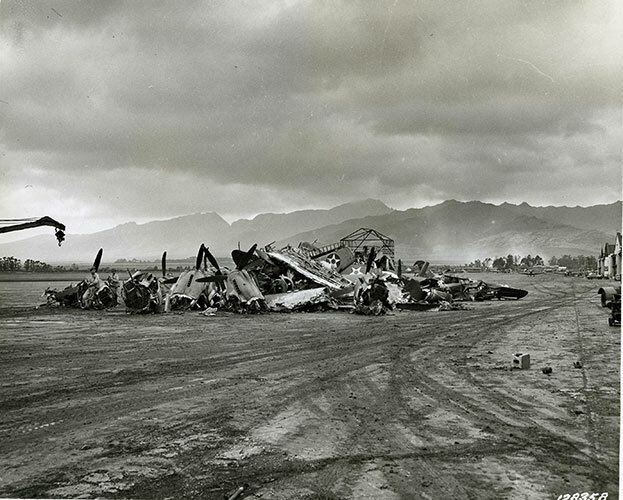 Hanger at Hickam Field, T.H., after bombing of December 7, 1941. 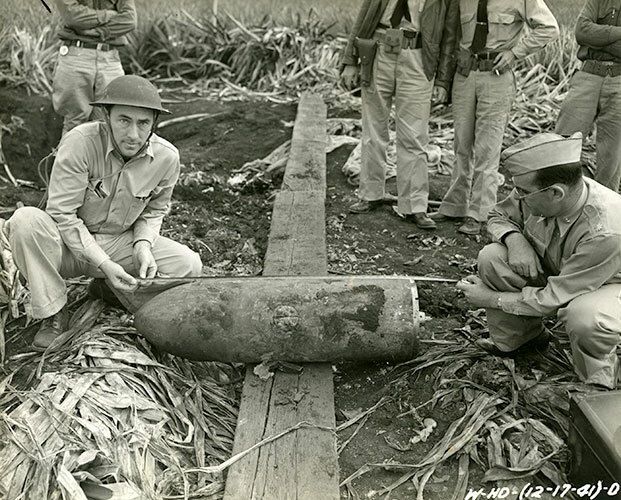 An unexploded bomb which fell from a Japanese plane which was brought down by fire from U.S. guns on OAHU, Hawaii Islands, Dec. 7, 1941. 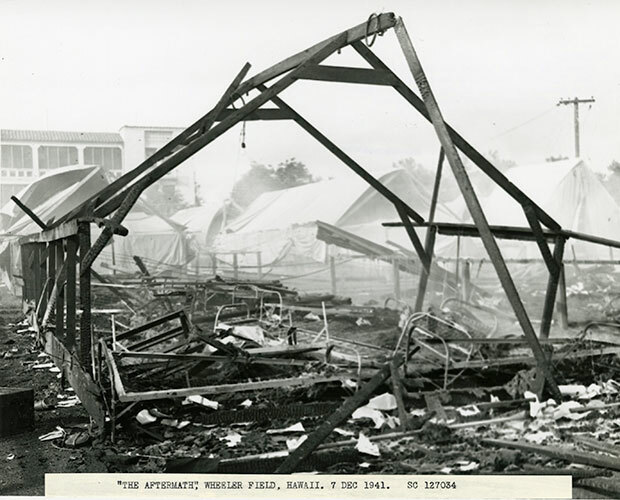 Bomb measurements: 12" x 43"
After the bombing of Hawaii by the Japanese, Dec. 7, 1941, salvage in front of #3 hanger, 10:26 a.m., Wheeler Field. 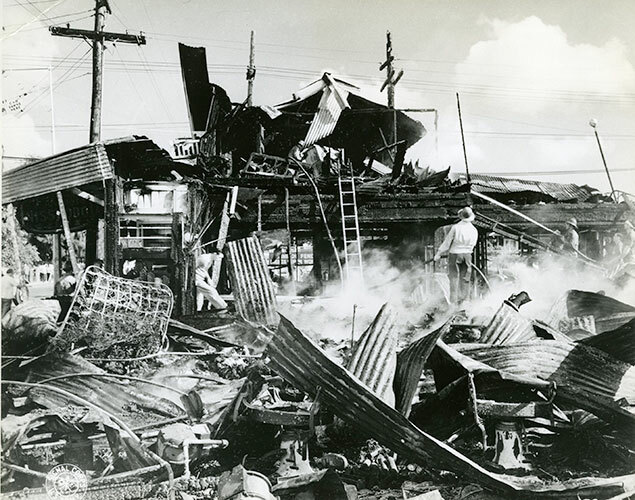 Remains of tent barracks after fire cause by attack of Japanese bombers. Practically all were killed when barrack was machine gunned. Wheeler Field. gt. John Shea, Sgt. John Steve Broder, Cpl. Joseph Novak and Pvt. 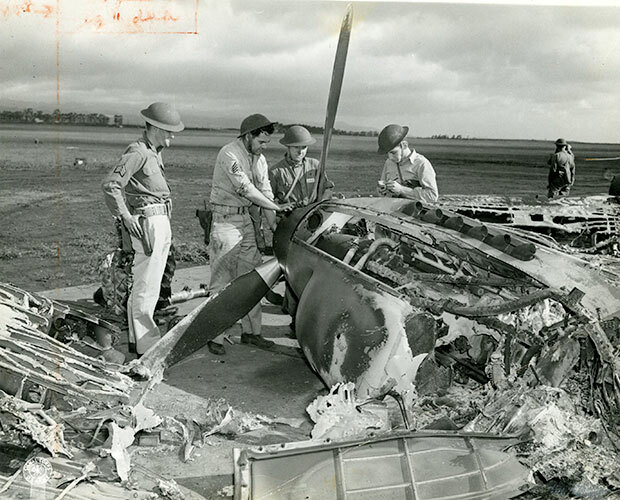 Cordray looking over wreckage of P-40 Pursuit plane at Wheeler Field. 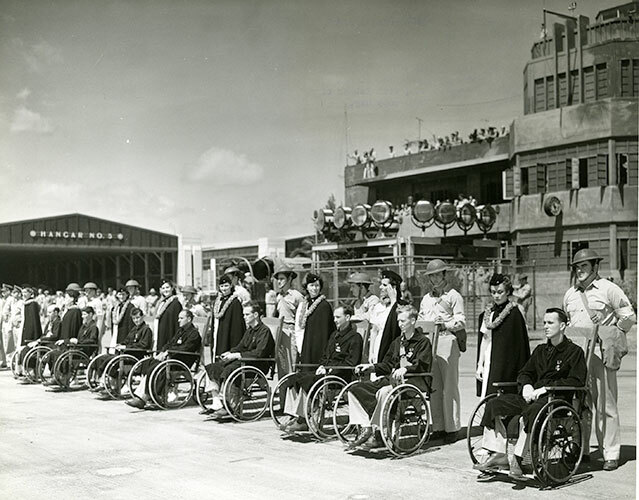 Hickam survivors, with Army nurses in attendance, who were awarded the Purple Heart Medal, shown on the runway at Hickam Field. April 1942. 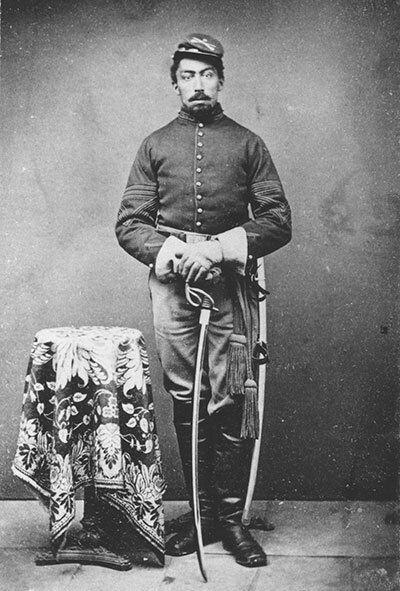 A Soldier, presumed to be Karl Brauchle of Co. C, 33rd U.S. Volunteer Infantry, poses for a photograph. 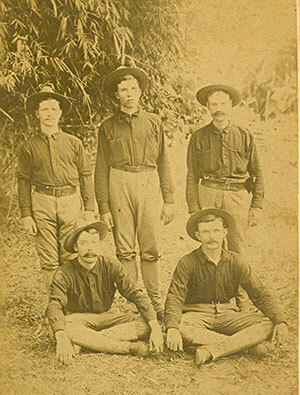 Five members of the 33rd pose for a photo while in the Philippines. John D. Harnden stands in the back row center. The man to his right is Private Joseph Epps. The war appeared won. Americans destroyed half the enemy force on the first day, and the other half surrendered within months. A new effort early the next year to mount main force resistance against the United States was also summarily defeated. Yet the conflict continued, as a festering insurrection against American forces. Iraq and Afghanistan were not the first war zones where U.S. forces faced such challenges. Over a century earlier, Americans dealt with a major insurrection in the Philippine Islands after the Spanish-American War. 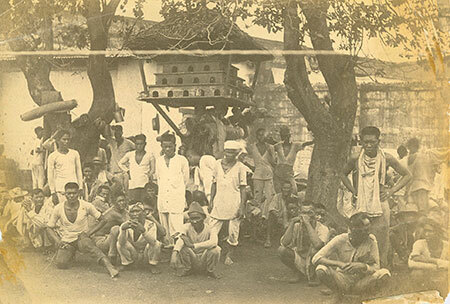 A group of insurgents and other prisoners are photographed after being captured. "It being so warm no one slept until a bout mid night, so about 4 o'clock next morning, there came a volley of shots, the sorgent yelled all out, but make no light, now we all jumped up as fast as we could and began to try to find our clothes, it seemed every one had thrown them all in a pile every one trying to get his and no one seem to be able to get any thing to fit him, the sorgent swearing by volum, I, got hold of a shirt a bout 2 sizes to small but I squeezed in it, got some pants and started for shoes, it seemed as if I, tried 15 shoes on and all for the same foot, I, soon got one a bout a no 10, and one I, guess a bout a 7, but a way I, went down stairs." During the next few hours, a fierce fight took place between the insurgents and the Soldiers stationed at Vigan. The Insurrecto forces had occupied the town hospital and were strategically placed behind a rock wall. Members of the 33rd fired round after round into the rock wall, and the hospital itself, hoping to dislodge their adversary. The dark and cloudy evening made sighting the enemy difficult, as men were forced to aim in the direction of muzzle flashes and any movement they saw. 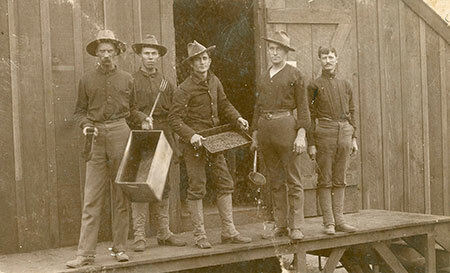 Soldiers of the 33rd take a break from roasting coffee beans to have their picture taken. The photo was taken in California before the men left for the Philippines. By morning, the overwhelming firepower of the U.S. Army forces had turned the tide, and the Philippine Insurrectos retreated back into the jungle. The once impenetrable rock wall that shielded the Insurrectionist forces had been nearly leveled by American rifle fire. For the rest of the day sporadic rifle fire was heard from the American outposts, but no further battle took place. As a result of the fight at Vigan, four Soldiers were awarded the Medal of Honor. Lieutenant Colonel James Parker of the 45th U.S. Volunteer Infantry received the award for leading his men and repelling the night attack. Lieutenant Colonel Webb C. Hayes of the 31st U.S. Volunteer Infantry moved through enemy lines alone and at night in order to help the defenders. He would also move back through the lines the next morning to the beach area and secure assistance from Navy forces, and he received the award for these actions. Two Soldiers of the 33rd also earned the nation's highest award. Private Joseph Epps was cited because he climbed a rock wall, discovered a group of insurgents, and forced them to surrender and stack their arms. 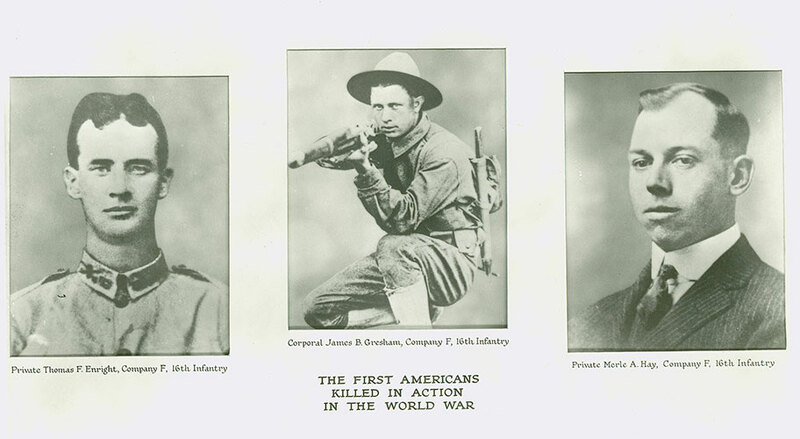 Private James McConnell spent several hours lying between two dead Soldiers while he continued to fire his weapon and fight off the enemy. His clothing was tattered by rifle fire and flying gravel, but he survived with only minor injuries. Each year, Thanksgiving provides an opportunity to reflect and give thanks, especially to the brave men and women who serve this nation. Their service does not end on holidays, and Soldiers sometimes find themselves far away from loved ones at times when families traditionally come together. Recognizing this sacrifice, the Army has gone to great lengths throughout history to give Soldiers a small amount of comfort around the holidays - often through food. This short video from the USAHEC Collection highlights Thanksgiving during the Vietnam War, and begins with a Soldier in the 5th Special Forces Group camp preparing a turkey and all the trimmings. The food is destined for a Special Forces detachment dug in at Xom Cat and accessible only by air. Even with the remote location and the potential for an attack by a North Vietnamese Army unit, the U.S. Army provided a taste of home for Thanksgiving. The Soldier's face at the end of the video says it all - even on a battlefield thousands of miles from home, a Thanksgiving meal was a welcome treat. These homing pigeons are doing much to save the lives of our boys in France. They act as efficient messengers and dispatch bearers not only from division to division and from the trenches to the rear but also are used by our aviators to report back the results of their observation. In November 1944, G.I. Joe, a member of the United States Army, saved the lives of at least 100 Allied soldiers. G.I. Joe traveled over 20 miles in twenty short minutes to deliver a message of grave importance. With little time to spare, he stopped an air raid from bombing a newly occupied village filled with Allied soldiers. G.I. Joe was not a super soldier; he was a Blue Chock Splashed Pigeon. Though their efforts are rarely remembered, thousands of pigeons flew over the battle-worn trenches of World War I and through the bombarded night skies of World War II. 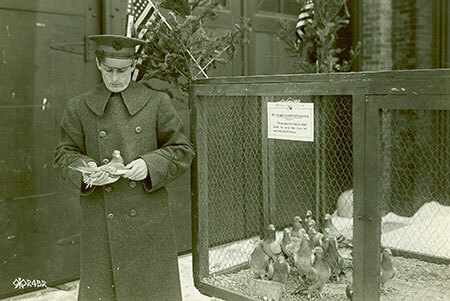 The U.S. Army Signal Corps used some 600 pigeons in World War I to advance troops, send reconnaissance, and carry crucial military messages. Pigeons played a major role during the World Wars, because they were a dependable source of communication. In World War I, their speed, consistency, and an impressive homing ability were especially useful. While other existing methods of communication were unreliable, over 90% of messages sent by pigeons were received. Trenches often changed hands between opposing sides multiple times within a one-week period, and reliable forms of communication were necessary to relay the ever-changing conditions on the front. 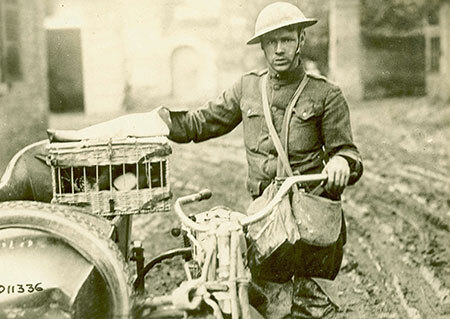 Motorcycle dispatch rider starting under heavy shell fire to deliver pigeons to our most advanced position. France. A Black Check Carrier Pigeon named Cher Ami aided in rescuing elements of the U.S. 77th Infantry Division, known as the "Lost Battalion." Surrounded by German troops, they endured constant fire from both enemy and Allied forces for six days, and their food and water supplies ran extremely low. Cher Ami delivered many critical messages, but his last mission was the most important. Battered and broken with a gunshot wound to the chest, Cher Ami valiantly carried a message from the "Lost Battalion," stating, "Our artillery is dropping a barrage on us. For heaven's sake, stop it!" Once Cher Ami's message was received, the survivors were rescued and brought safely within American lines. The "Lost Battalion" sustained heavy losses, but Cher Ami's gallant service allowed 194 of its more than 500 Soldiers to survive. Carrier pigeons being released from regimental P.C., Andernach, Germany. May 30, 1919. Cher Ami, and forty other pigeons, received honors for their brave service in World War I. Cher Ami received the French Croix de Guerre, with palm for his valiant work. Unfortunately, due to the injuries sustained on his final mission, Cher Ami died months later in 1919. Pigeons, such as G.I. Joe, would be utilized during World War II, but soon after, communication technology advanced, making pigeons obsolete. 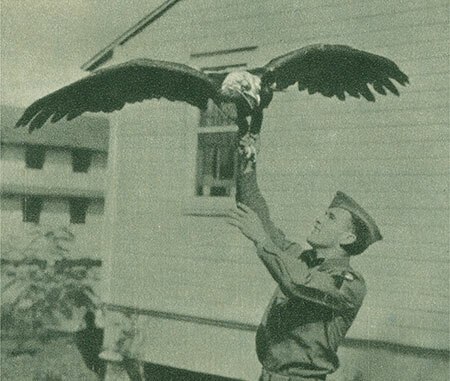 Next time you happen to see or hear the cooing of one of these birds, take a moment to remember their historic military service. On November 11th, the United States commemorates Veterans Day, recognizing and honoring all who have served in the military. The first commemoration of November 11th occurred in November 1919, and was known as Armistice Day, created to honor those who fought in World War I. An armistice went into place on the eleventh hour of the eleventh day of the eleventh month in 1918, which ended hostilities in World War I. President Woodrow Wilson proclaimed November 11, 1919 as the first commemoration of Armistice Day, and the country celebrated with parades and public meetings. The day became a legal holiday each year in 1938, and evolved to be known as Veterans Day in 1954, when congress amended the legal code which made the day a holiday, and changed the word Armistice to Veterans. This act came at the request of veterans' organizations, as they wanted to honor veterans of World War II and the Korean War, in addition to those of World War I. Veterans Day continues to be observed each year on November 11th, and provides an important opportunity to honor the patriotism, service, and sacrifice of all veterans. 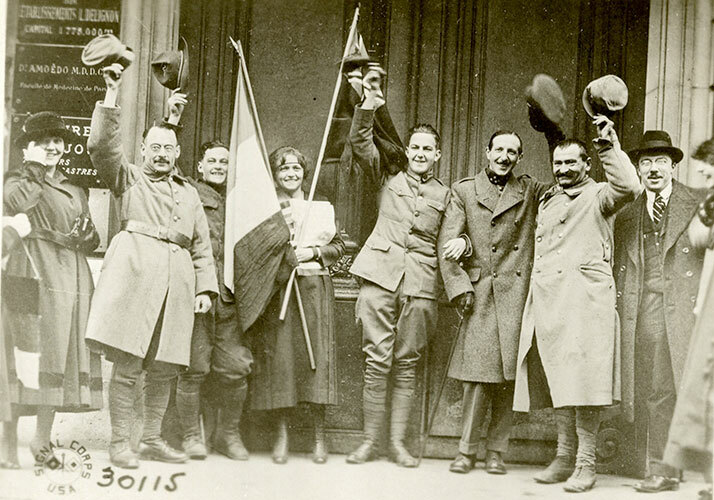 The images below are from the USAHEC Collection and depict Soldiers and civilians, in both Europe and America, celebrating the news of the armistice, ending the hostilities of World War I. 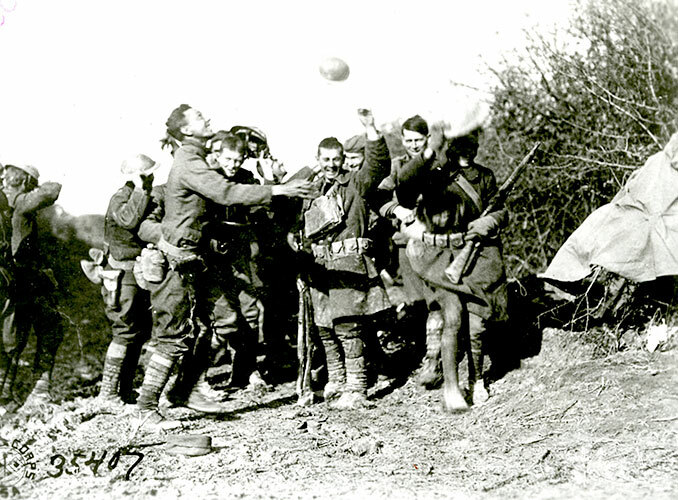 Take a few moments to look through the photos, and see the joyful celebrations of grateful people, happy to have reached the end of the Great War. Recognition of these Soldiers, who fought and died defending their nation, led to the creation of Armistice Day the following year. 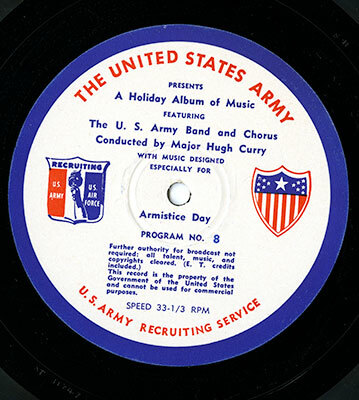 The United States Army Band's Holiday Album of Music, Program 8, with music designed for Armistice (Veterans) Day, 1954. Click HERE to read the official Veterans Day Proclamation from the White House. Click HERE to read more about the history of Veterans Day. Shouts of joy as soldier reads terms of armistice to his friends. 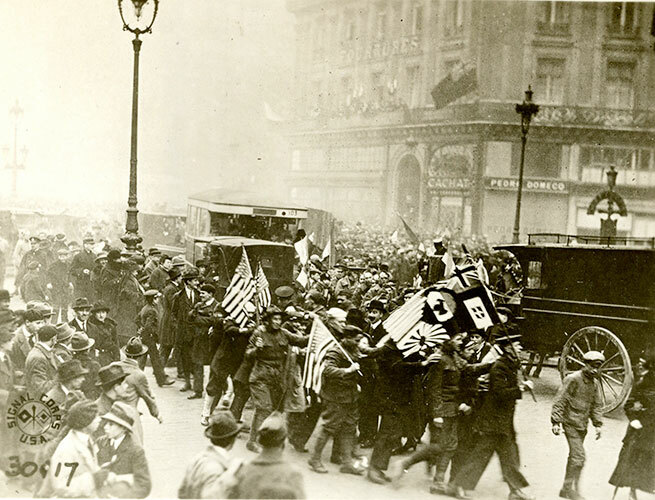 Company M, 6th Regiment Infantry, the day after the signing of the Armistice. Near Remoiville, Meuse, France. Nov. 12, 1918. 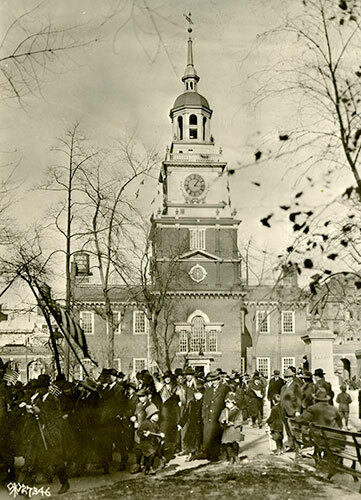 View of Independence Hall, Philadelphia. Showing crowds celebrating Germany's surrender in Independence Square. 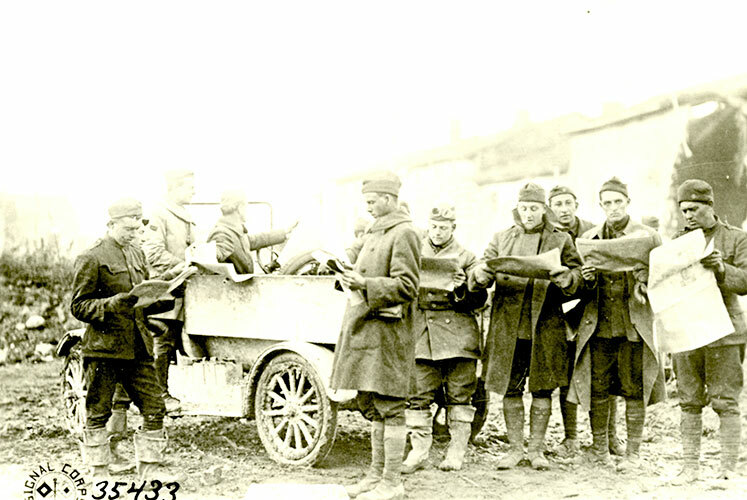 Distributing papers containing the news of the Germans having signed the armistice. Milly, Meuse, France. Nov. 13, 1918. 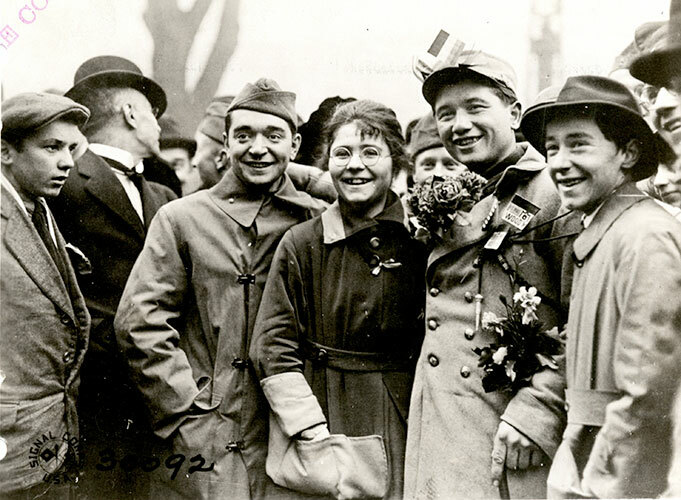 Group of happy French and American soldiers celebrating the signing of the Armistice. Near the Elysee Palace Hotel, Champs Elysee, Paris, Seine, France. Nov. 11, 1918. 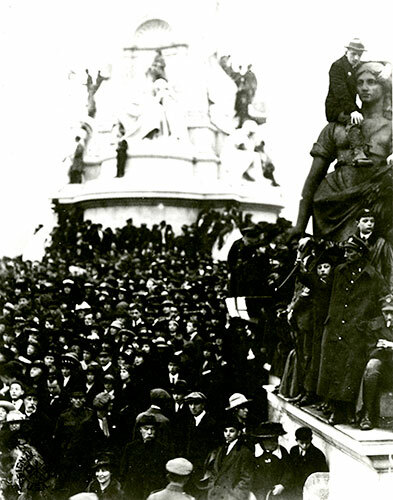 Crowd on Mall, celebrating signing of armistice, waiting for the king to come out of Buckingham Palace. London, England. Victoria Memorial Monument. Nov. 11, 1918. 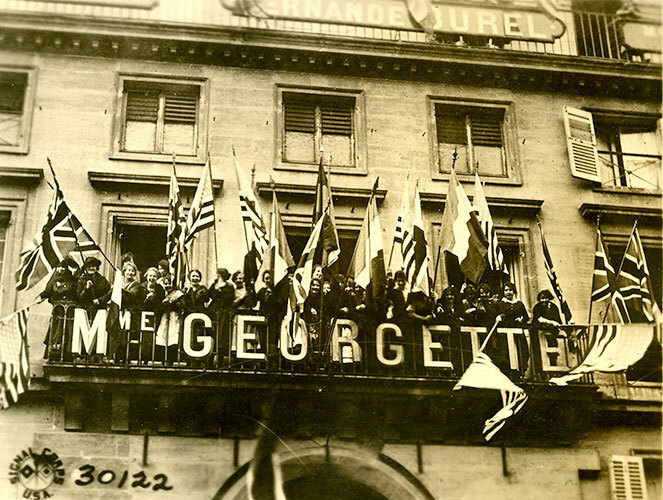 The French girls showing how happy they were at the joyful news, decorated every possible corner of their windows with Allied Flags. This view was taken on Rue Royale, Paris, Seine, France. November 11, 1918. 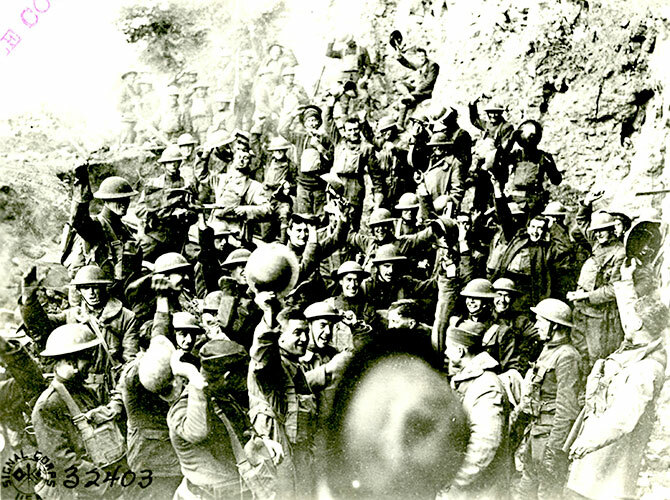 Members of the 64th Regiment Infantry, 7th Div., cheering at the signing of the armistice. Nov. 11, 1918. Min de Jaulny, Meurth-et-Moselle, France. Mov. 11, 1918. 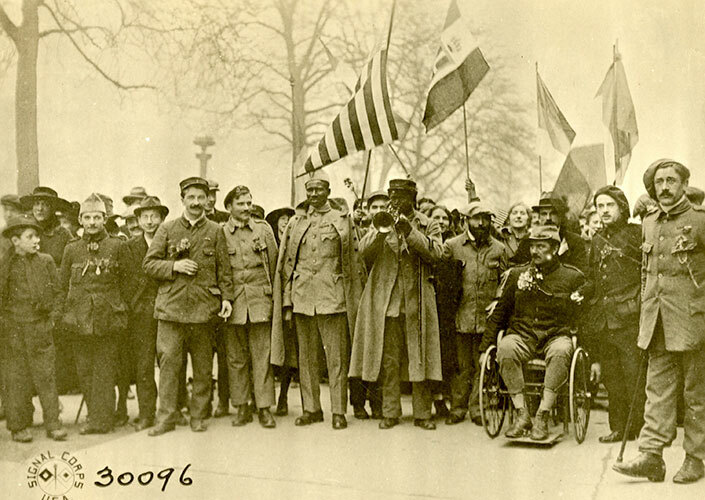 Old and wounded French veterans on parade down the Camps Elysee Blvd. Paris, Seine, France. Nov. 11, 1918. On this great day the Allies celebrated together as much as possible. This view shows a Belgian girl surrounded by Frenchmen, Englishmen, and Americans, all happy. Paris, Seine, France. Nov 11, 1918. A happy throng of American "Jackies" invade the opera and form a parade. Paris, Seine, France. November 11, 1918. Seventy-four years ago this month, American paratroopers began their distinguished combat record when the 509th Parachute Infantry Battalion made the U.S. Army's first airborne combat jump, near Oran, Algeria on November 8, 1942. One week later, having repacked their own parachutes - paratroopers were their own riggers then - the 509th made its second combat jump at Youks Les Bains on November 15. While the tactical results were disappointing (for reasons beyond the 509th's control), these initial combat jumps demonstrated the feasibility of employing airborne units to seize critical objectives over significant distances. This first airborne assault launched 39 C-47 aircraft from airfields in England on a 1,500-mile route to drop zones in North Africa. The Army's aggressive commitment to this new tactic was reflected in the re-designation of two infantry divisions (the 82nd and 101st) as airborne divisions in August 1942, less than three months before the 509th jumped into the desert. 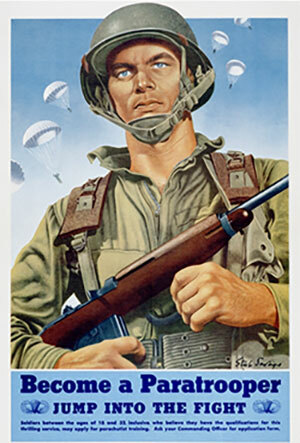 WWII Paratrooper recruiting poster. The addition of parachute pay of $50 per month more than doubled the 1942 monthly base pay of a private ($40). The Distinctive Unit Insignia of the 509th includes a stylized gold figure of a parachutist (from a unit badge worn during WWII), and the five arrowheads represent the regiment's five assault landings during WWII. 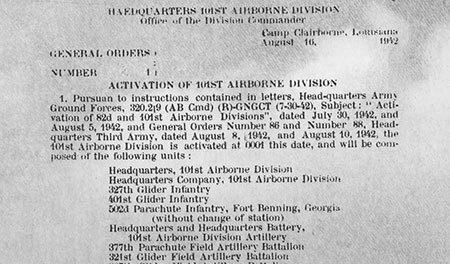 The superb combat record of the 509th during the remainder of the war - under a wide variety of challenging tactical conditions - demonstrated the special qualities airborne Soldiers brought to the battlefield as well as the careful planning necessary to ensure the best employment of this elite branch. When the war ended in 1945, the 509th had, in less than three years, completed four combat parachute assaults (North Africa, Italy, Southern France), made one amphibious assault (Anzio), earned two Army Presidential Unit Citations (Carano, Italy and Liege, Belgium), and multiple battalion-level foreign awards. When disbanded in January 1945 after heavy combat during the Battle of the Bulge, with less than ten percent present for duty, the 509th had surely lived up to its motto: "All the Way!" The bravery, toughness, aggressiveness, and initiative displayed by 509th paratroopers in North Africa, Italy, Southern France, and Germany were born in demanding airborne and infantry training programs in the U.S. and England that included challenging road marches, extended tactical exercises, extensive weapons firing, and realistic parachute training. These same qualities have been demonstrated by the generations of airborne Soldiers who have since served and by the airborne troopers who now carry on the 509th's tradition of combat leadership. LTC Edson D. Raff, a physically tough and demanding trainer, commanded the 509th in North Africa. February 1943. Is that an artifact or a condiment? 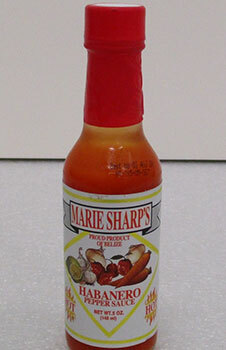 Bottle of Marie Sharp's Habanero Pepper Sauce, donated to the USAHEC by Specialist John Shirley in 2009. The USAHEC Collection contains a vast array of items, from the expected - uniforms, equipment, photographs, letters, books - to the unusual, such as this bottle of hot sauce. Specialist John R. Shirley donated his bottle of Marie Sharp's Habanero Pepper Sauce to the USAHEC in 2009, along with other, more familiar items, including uniforms and personal correspondence. Specialist Shirley enlisted in the Army shortly after the 9/11 attacks. After discharge, he joined the National Guard and was a member of the Individual Ready Reserve (IRR) while attending college. He was recalled to active duty in early 2006 and mobilized from Camp Shelby, Mississippi with the 41st Brigade Combat Team before deploying to Afghanistan in July. He initially served as part of Camp Phoenix's security force, manning guard towers, and in January 2007, he was attached to Company C at Camp Black Horse. Specialist Shirley's materials provide an important look at the life and experiences of Soldiers who served in the Global War on Terror. While an unconventional and seemingly unimportant item in the eyes of some, this bottle of hot sauce helps tell an important part of the Army's story. The Army has a long history of Soldiers using a variety of methods to improve the taste of their often bland food options, and Specialist Shirley was no different. Though he took the heat up a notch from the Tabasco Pepper Sauce included in Meals, Ready to Eat (a standard issue item in MREs since 1990), his bottle of hot sauce represents generations of Soldiers who wanted to make their repetitive meals more appetizing. This map shows General Washington's troop movement from New York and British and French Naval actions in August and September 1781. Two hundred thirty-five years ago this week, the British Army surrendered after the Battle of Yorktown - the last major engagement of the Revolutionary War. The fall of 1781 presented Continental Army General George Washington with an important opportunity - trapping and defeating British General Lord Cornwallis at Yorktown, a small Virginia port city. Cornwallis had been ordered to take a post with his army and await the arrival of a Royal Navy fleet to extract him. Washington learned of this and left a "ghost army" outside New York to fool the British, while moving the bulk of his army south into Virginia. Shortly after Washington's army surrounded Yorktown on land, the French fleet defeated the Royal Navy at sea, and the entrapment of Cornwallis was complete. 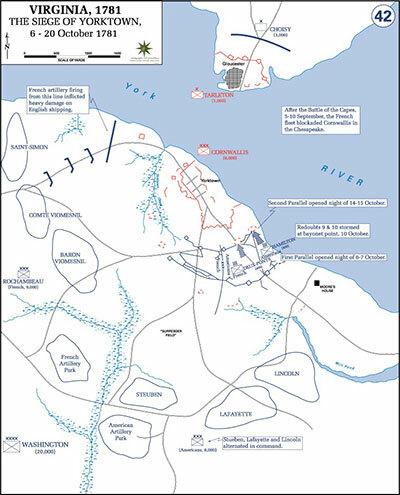 In conjunction with the French, a formal siege began on September 28, and a series of trench lines were dug, bringing Washington's army ever closer to the main British fortifications surrounding Yorktown. Sergeant Joseph Plumb Martin and his fellow Soldiers of the Corps of Sappers and Miners helped to dig these trenches, which enabled the bombardment of Yorktown to begin on October 9. The British erected a number of earthwork forts, called redoubts, in front of their main defenses, but as the siege progressed, they only retained control of three. Of those, Redoubts 9 and 10 needed to be captured to bring the American and French armies, and their heavy artillery, within striking distance of the main British fortifications. 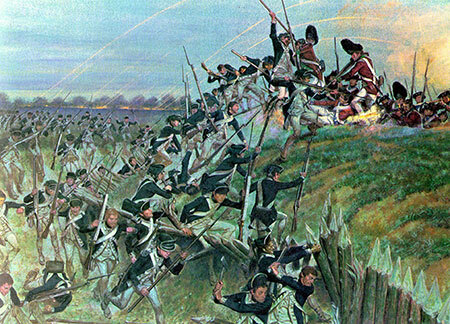 Historical artist H. Charles McBarron's rendering of the final assault on Redoubt 10, produced for the U.S. Army. "The Sappers and Miners were furnished with axes and were to proceed in front and cut a passage for the troops through the abatis, which are composed of the tops of trees, the small branches cut off with a slanting stroke which renders them as sharp as spikes... We had not lain... long before the expected signal was given... by the three shells with their fiery trains mounting the air in quick succession. The word up, up, was then reiterated through the detachment. We immediately moved silently on toward the redoubt we were to attack, with unloaded muskets. Just as we arrived at the abatis, the enemy discovered us and directly opened a sharp fire upon us... As soon as the firing began, our people began to cry, 'The fort's our own!' and it was 'Rush on boys.' The Sappers and Miners soon cleared a passage for the infantry, who entered it rapidly. Our Miners were ordered not to enter the fort, but there was no stopping them... . I could not pass at the entrance we had made, it was so crowded. I therefore forced a passage at a place where I saw our [cannon] shot had cut away some of the abatis..."
This map shows the actions and troop positions during the Siege of Yorktown from October 6-20, 1781. The two captured redoubts were immediately incorporated into the second siege trench lines, and the American and French forces constructed cannon batteries to allow pointblank fire against the British defenses. On the morning of October 17, a British drummer mounted the parapet of their fortifications to beat a "parley," [conference between opposing sides to discuss terms] and was joined by an officer waving a white handkerchief. With his fortifications heavily damaged, Cornwallis proposed to surrender. Emissaries from both sides met to work out the details, and two days later, on October 19, 1781, the British troops marched out of Yorktown and laid down their arms to a tune titled "The World Turn'd Upside Down." Martin noted that the British soldiers appeared "all armed, with bayonets fixed, drums beating, and faces lengthening... [and that they] paid the Americans, seemingly, but little attention as they passed them, but they eyed the French with considerable malice depicted in their countenances." The USAHEC's Army Heritage Trail is home to a replica of Redoubt 10, featuring many of the same defensive works as the original. Stop by to walk the trail and gain a better understanding of the Battle of Yorktown and some of the defenses French and American forces encountered during their siege. 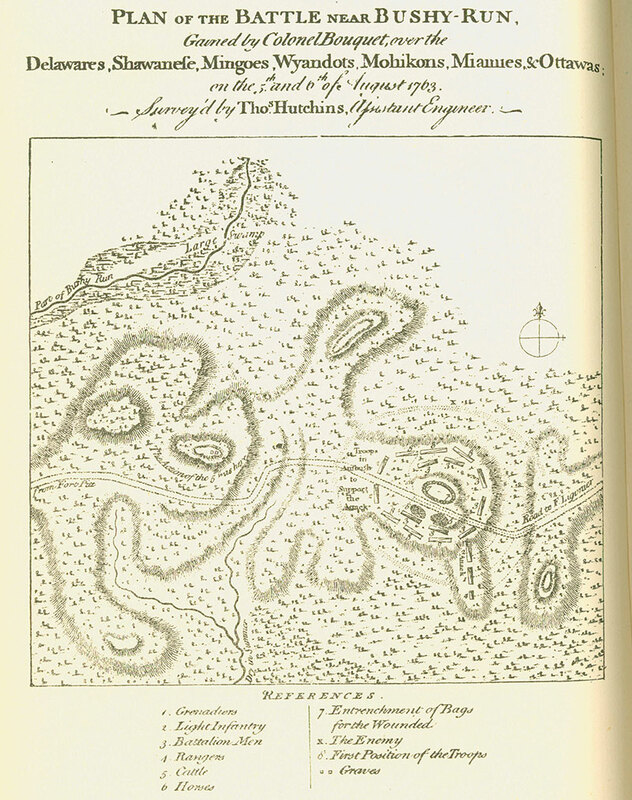 Click HERE for more information about the USAHEC's Redoubt 10. In addition to the outdoor exhibit, the USAHEC Collection has materials related to the actions at Yorktown; check out the Yorktown Reference Bibliography below for an overview. SSG Easley at Combat Outpost Mushan in Afghanistan, June 2012. Saturday, October 15, 2016 marks Staff Sergeant Rob Easley's fourth "Alive Day." For Soldiers and veterans, "Alive Days" mark the moment when their lives changed dramatically - sustaining wounds, physical or mental, a day they could perhaps have died, but didn't. For some, they are days of celebration, for others, days of quiet reflection on their survival. Staff Sergeant (SSG) Robert Easley served as an Explosive Ordinance Disposal Technician, and was deployed to southern Afghanistan with the 787th EOD in 2012. This was SSG Easley's second deployment. 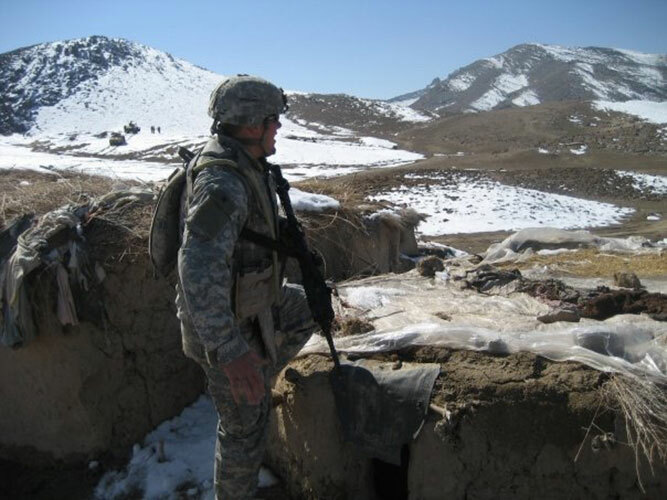 He first deployed to Iraq as part of Operation Iraqi Freedom for fourteen months (2008-2009) with the 10th Mountain Division as an infantryman (1-87). 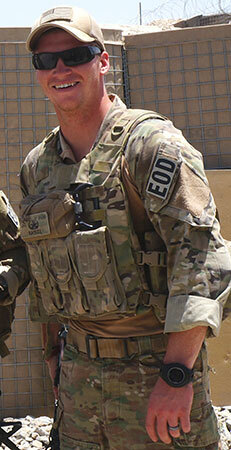 While out on foot patrol on October 15, 2012, SSG Easley stepped on an improvised explosive device (IED). He lost both legs, making him a bilateral, above-knee amputee, and also sustained multiple injuries to his right hand, including partial amputation of his pointer, middle, and index fingers. Swift work by his unit's medic saved his life, and after receiving initial treatment in Afghanistan, he was transferred to Germany, and then to Walter Reed National Military Medical Center (WRNMMC) in Bethesda, Maryland for recovery and rehabilitation. SSG Easley in "shorties," his first pair of prosthetics. 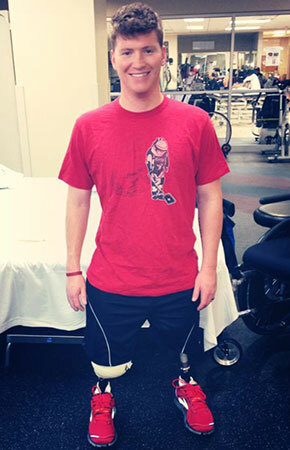 As part of the recovery process, he was up and moving as quickly as possible after being injured. Initially receiving therapy in a wheelchair, he transitioned to his first pair of prosthetic legs ("shorties" - low to the ground to make balance easier while learning the new motion of walking), just 53 days after his injury. He made great progress initially, but eventually experienced challenges with severe pain in his residual limbs due to Heterotopic Ossification (HO) (excess bone grown in the soft tissue of the residual limbs). He also had issues finding a good fit for his prosthetics, because his left residual limb was much shorter than his right. 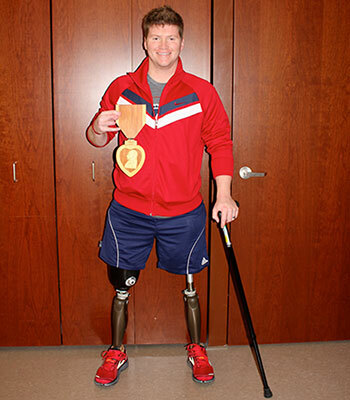 Unwilling to give up on spending more time in prosthetics than in his wheelchair, SSG Easley underwent surgery for the HO, and eventually, pursued femur extension surgery in the early part of 2014. Doctors implanted a device, which slowly stretched the left, residual femur, and after two rounds of surgery and stretching, SSG Easley gained nearly four inches of length in his left residual limb. After spending a year allowing the femur to fully heal, he resumed physical therapy and got re-acclimated to walking in prosthetics. 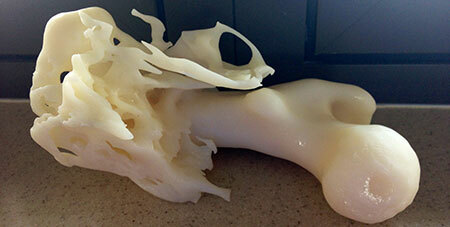 A model of SSG Easley's left residual limb, showing the Heterotopic Ossification (excessive bone growth) he experienced in the summer of 2013. SSG Easley spent almost three and a half years at WRNMMC, as he underwent multiple surgeries, and spent countless hours in physical therapy. 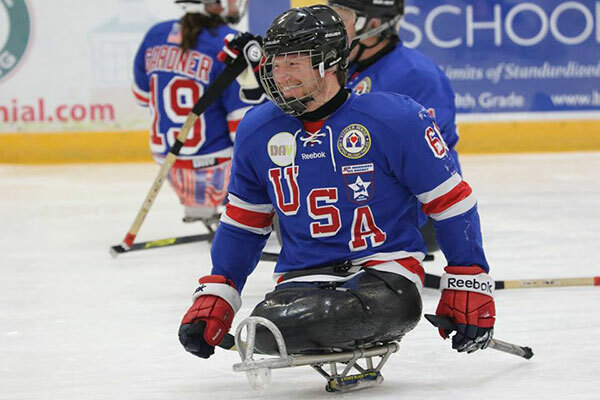 In addition to his therapy at the hospital, SSG Easley joined the USA Warriors, and learned how to play sled hockey with other wounded veterans. This year, he tried out for and made the 2016-2017 USA Sled Hockey Developmental Team. Though he faced a challenging path, SSG Easley persevered through numerous setbacks, and on March 31, 2016, after nine and a half years of service, he officially retired from the U.S. Army. He and his wife, Megan, moved to Florida following his retirement, and are thoroughly enjoying their time as a family, reunited with their dogs and, finally, beginning life away from the hospital. Two exhibits at the USAHEC, one inside and one outside, feature SSG Easley's story in conjunction with information about IEDs. If you're in the area, be sure to stop by to learn more about his service and sacrifice! In his apartment at Walter Reed National Military Medical Center, SSG Easley holds a replica of a Purple Heart, given to him by a supporter. SSG Easley is a forward on the 2016-2017 USA Developmental Sled Hockey Team and the USA Warriors Sled Hockey Team. 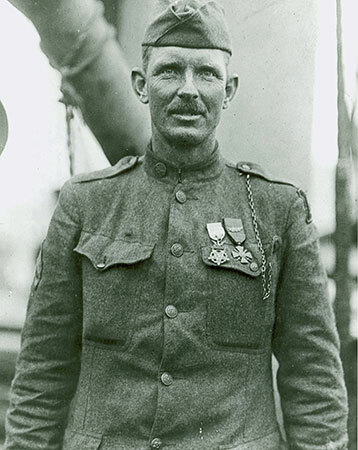 Sergeant Alvin C. York of Pall Mall, Tennessee, served with the 328th Infantry Regiment, 82nd Infantry Division. In December 1887, a hero was born to humble parents in a farming community in middle Tennessee. The York family supplemented their income by hunting in the woods around Pall Mall, where young Alvin became an expert rifleman. From the Pall Mall Valley in Tennessee to the hills of the Argonne Forest in France, fame and notoriety found Alvin Cullum York. As a young man, he was "wild and bad," enjoying drinking, smoking, and gambling. This lifestyle changed when his mother challenged him to be a man like his father and grandfathers. Taking this challenge to heart, he carried her message as he served his country during World War I. 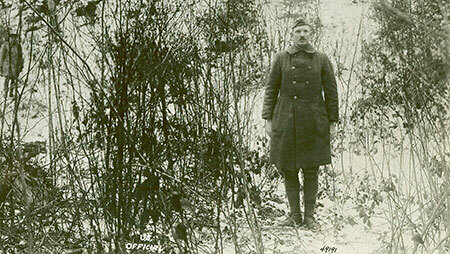 On October 5, 1918, Corporal Alvin C. York entered the Argonne Forest with the 328th Infantry Regiment, starting a chapter in his life that would cement his name into history. The German Army had dominated the area and made life almost impossible. Ordered to take Hill 223 on October 8, the regiment moved forward. German machine gun fire from the front and flanks forced the Americans to go around the enemy's left flank. Almost immediately, Corporal York found himself in command, as his leaders were killed. York and the few men left with him jumped across a small stream, surprising and capturing 15 to 20 German soldiers, including an officer. Before he surrendered, the German officer emptied his pistol firing at, but not harming, Corporal York. Sgt. York stands in front of the hill on which the raid took place. Argonne Forest, near Cornay, Ardennes, France. Feb. 7, 1919. When the machine guns turned to fire upon the Americans, Corporal York "touched them off" one by one, as he tried to negotiate with the German officer to surrender his troops. Twenty-eight German soldiers died before those remaining surrendered. The area around were Alvin York stood was barren from the machine gun fire, yet the spot where he stood was undisturbed. Corporal York and his band of seven men marched 132 prisoners back to the American side. Later, it was determined that York had discharged 28 shots and killed 28 German soldiers who refused to surrender. Corporal Alvin C. York was honored by a promotion to Sergeant and awarded the Distinguished Service Cross. The French Republic bestowed upon him the Croix de Guerre and Legion of Honor. York also received the Italian Croce de Guerra and the War Medal from Montenegro. Vicinity of Sgt. York's raid 1-1/2 kilo northwest, of Chatel Chehery, Ardennes, 328th Inf. 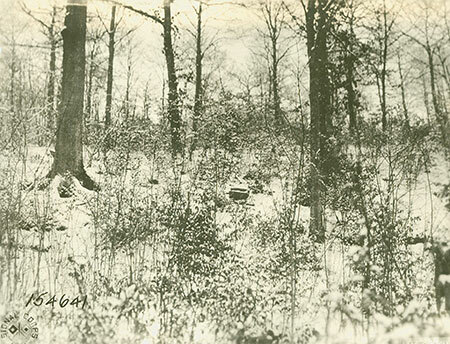 Regt., 82nd Div., Argonne Forest, France. Feb. 1, 1919. 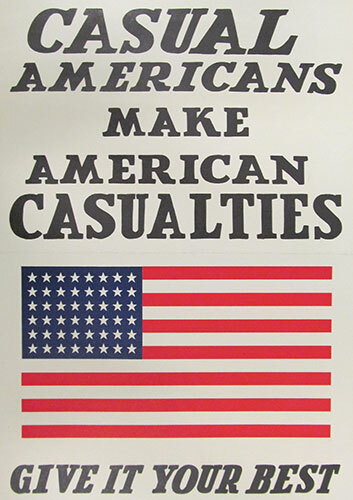 Introduced to an American audience in World War I, poster art was intended to foster positive public opinion of the war, while inspiring participation and support from the citizenry. 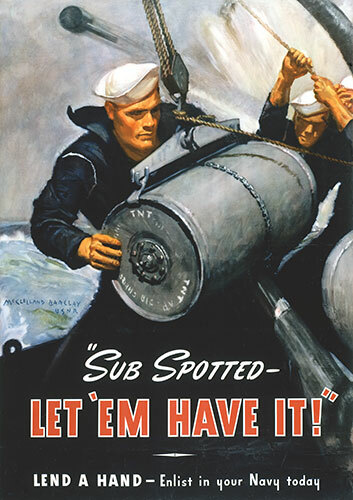 After successful use during the First World War, posters were again put into use during World War II. Building the confidence of the American public helped them invest in the effort needed to support the war, either through direct military service or sacrifice and action on the home front. 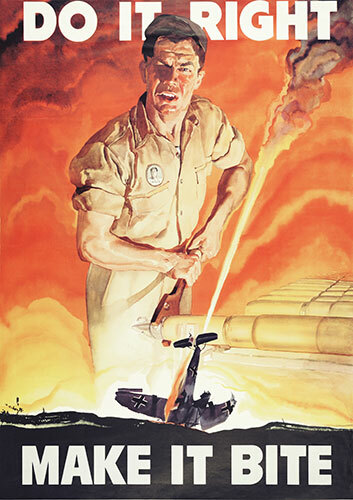 The posters created strong national unity and boosted morale, inspiring success that contributed to victory in World War II. 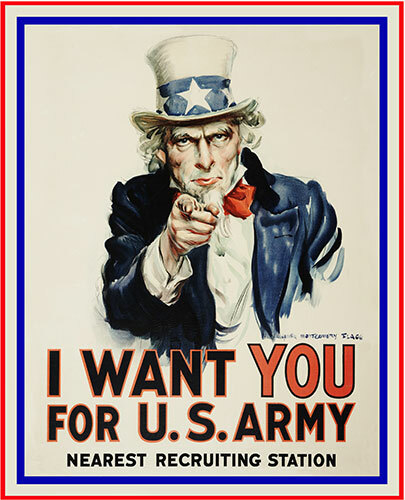 The USAHEC has an incredible collection of poster art from different eras of U.S. Army history, with an especially rich variety of posters from World War I and World War II. 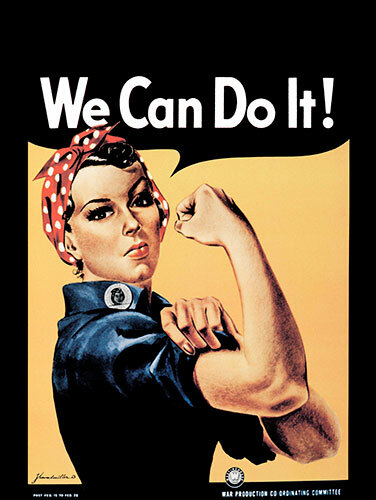 Some posters contain the famous imagery of Rosie the Riveter encouraging female service on the home front and Uncle Sam beckoning men to enlist. 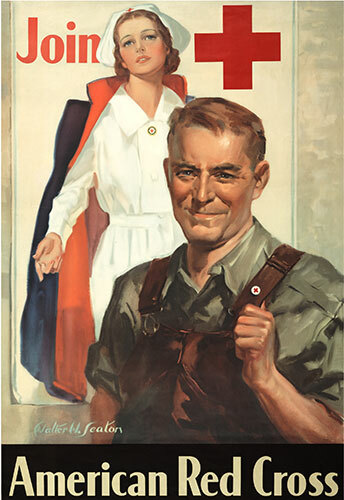 While the pictures on other posters may be less familiar, the messages encouraging military service, home front support, and sacrifice remain. 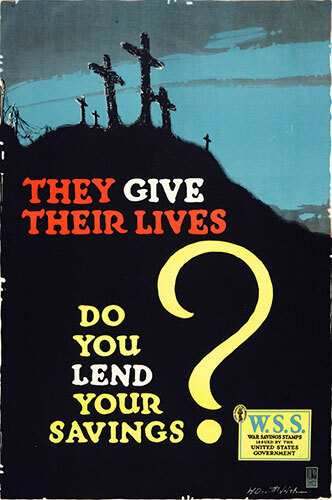 The posters intended for the home front contain patriotic and persuasive imagery and messaging aimed at inspiring the nation to support the military through saving scrap metal, eliminating food waste, and contributing to the war effort through the purchase of Liberty Bonds. 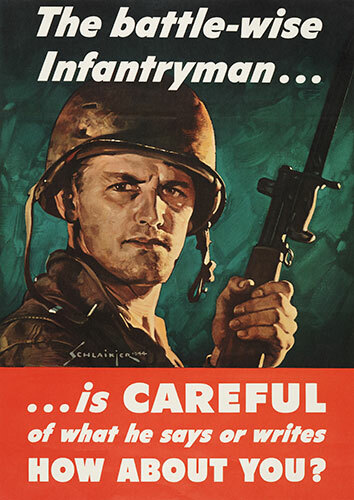 Other posters contained cautionary messages, professing the importance writing and speaking carefully when discussing the war effort. 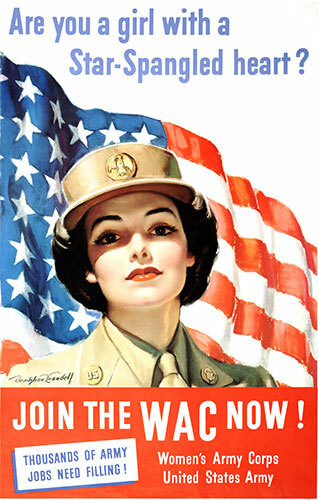 Recruiting posters came in every shape and size - encouraging men to enlist in all branches of military service, and women to join the Army Nurse Corps and the Women's Army Corps. 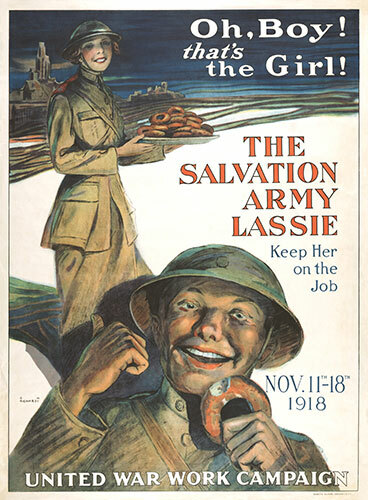 Other posters urged support on the civilian side, either through joining organizations such The Salvation Army or the American Red Cross or taking manufacturing jobs. 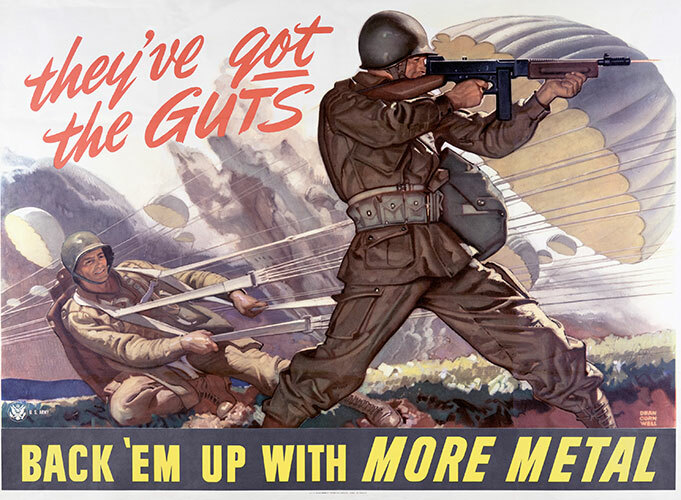 Though some of the messages may seem outdated by today's standards, these posters were tremendously effective in uniting the nation and motivating Americans to support the war effort in whatever way they could. Though the images below represent only a small sample of the posters in the USAHEC Collection, the variety of messages is evident. 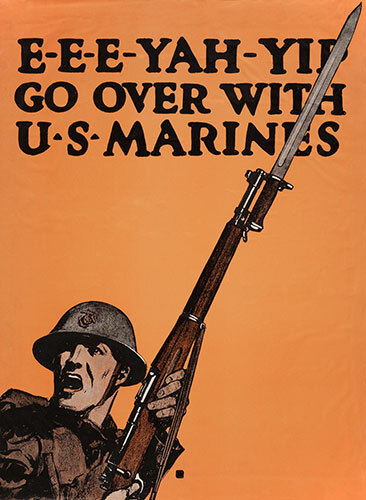 In addition to the posters themselves, the USAHEC Collection contains numerous resources dedicated to the use of posters throughout U.S. Army history. Take a look at the Posters Reference Bibliography for more information. Girandoni System Austrian Repeating Air Rifle, Circa 1795. This rifle is believed to have been carried on the Lewis and Clark Army Corps of Discovery Expedition, 1803-1806. The rifle has a maximum capacity of 22 round .463 caliber balls held in a tubular magazine. Two hundred and ten years ago today, Captain William Clark's journal entry sounded rather mundane: "Thursday, September 23, 1806, Took an early breckfast with Colo. Hunt and Set out decended to the Mississippi and down that river to St. Louis at which place we arived about 12 oClock." September 23, 1806 was no ordinary day, however, as it marked the final day of the Corps of Discovery journey, a U.S. Army expedition that began on May 14, 1804, and traveled to the West Coast and back. 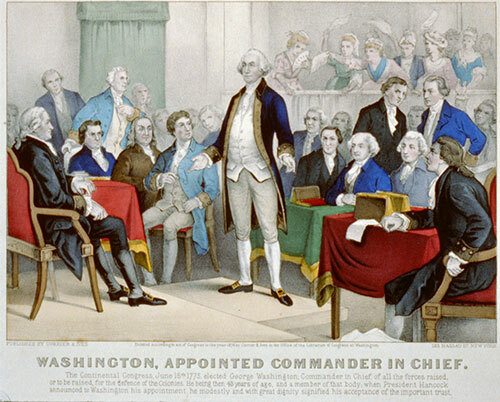 Before the trip, President Thomas Jefferson selected Captain Meriwether Lewis, 1st Infantry Regiment, to lead the Corps of Discovery into the newly acquired Louisiana Purchase. Lewis was in his late twenties at the start of the trip, and personally selected William Clark as his assistant, who received only a second lieutenant's commission. The Corps varied in size throughout the trip, but generally consisted of the two officers, three to four non-commissioned officers, twenty-three to thirty enlisted men, and three to fourteen civilians. 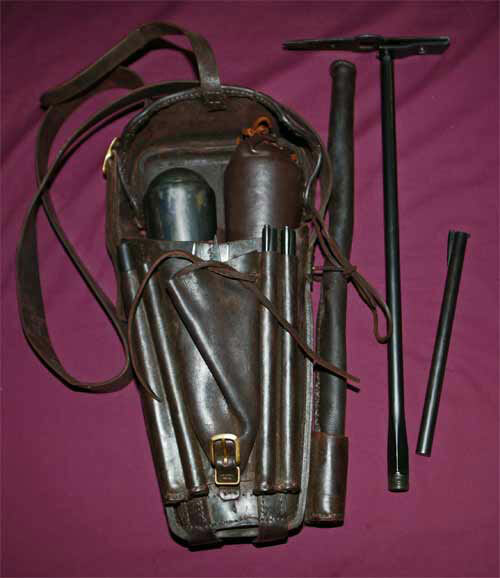 Recreation of an Austrian Girandoni System Accouterments Bag. This bag includes spare air flasks, air pump, wrenches, bullet mold, and ladle. Although the Lewis and Clark journals do not document the type of tools they carried, the air rifle would not have functioned without them. Jefferson instructed Lewis to travel the Missouri River and preferably, other rivers to the Pacific Ocean. Lewis and his men were to note landmarks, climate, vegetation, animals, and measurements of the waterways (using latitude and longitude), and were to learn the ways of the people they met. A great deal transpired in their "absence of two years, four months and ten days," as noted by Sergeant Patrick Gass - struggles on rivers and over mountains, confrontations with grizzly bears, days of boredom, discoveries of unique creatures and plants, and meetings with Native Americans. One particular item they took along was at least one air rifle, which Lewis often demonstrated to Native Americans. Before the trip, Lewis wrote that shortly after leaving Pittsburgh by river in August 1803, he "went on shore and being invited on by some of the gentlemen present to try my airgun which I had purchased brought it on shore charged it and fired myself seven times fifty five yards with pretty good success." Lewis noted in his journal the numerous times he showed Native Americans how the rifle worked and how they reacted. He recorded that on January 24, 1806, "my Air-gun also astonishes them very much, they cannot comprehend its shooting so often and without powder." Simply seeing the impressive action of the rifle may have deterred some who thought of attacking the Corps, and perhaps, this rifle helped free the way for Lewis and Clark to safely cross the continent on one of the most famous exploratory expeditions in history. This expedition, conducted by the U.S. Army, alerted the nation to the wonders and riches of the Louisiana Territory and the Columbia River Basin. An air rifle believed to have been on the Lewis and Clark Expedition is part of the USAHEC Collection, and is currently on display at the Pentagon. Sergeant Gregory Clark, a Carlisle native, served with the 1-4 Infantry, Army Training Command (Hohenfels, Germany) and the 2-14 Infantry, 2nd Brigade, 10th Mountain Division (Ft. Drum, New York), August 2006 - December 2010. In the next week, the USAHEC will open an addition to its Visitor and Education Center building. With new multipurpose rooms and a new exhibit gallery, this space expands the USAHEC's ability to tell Soldiers stories and illustrate the life and experiences of those who have served their country. One such Soldier is Sergeant Gregory Clark, who served with the 1-4 Infantry, Army Training Command (Hohenfels, Germany) and the 2-14 Infantry, 2nd Brigade, 10th Mountain Division (Ft. Drum, New York) from August 2006 - December 2010. 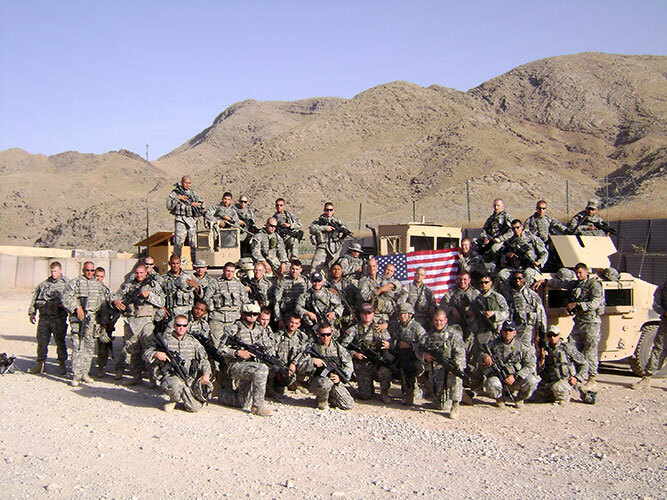 Sergeant Clark's platoon (roughly 40 people) deployed to the Mizan District of Afghanistan in July 2007, living in a mountainous valley in the southeastern part of the country. As a very small entity on a remote Forward Operating Base (FOB), the platoon had to bring their own mechanics, medics, mortar men, and even field one of their own Soldiers as the FOB cook. 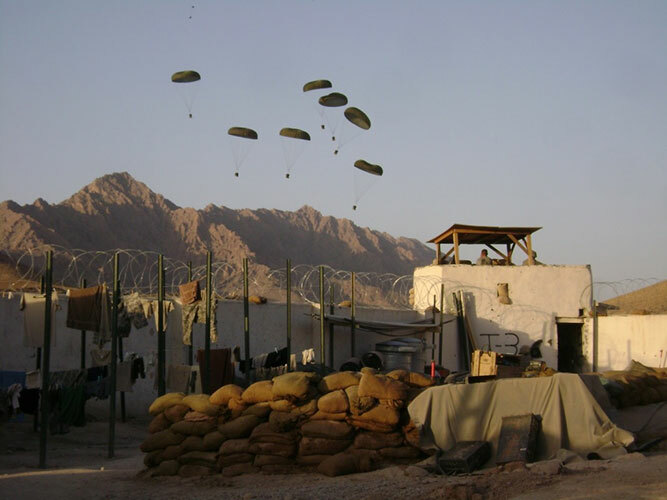 Life for the Soldiers on FOB Mizan included performing guard duty, conducting missions in the surrounding area, coordinating supply drops, and responding to enemy attacks. The story of 1st Platoon, Alpha Company, 1-4 Infantry's deployment to Afghanistan will be told through large canvas prints, featuring photographs taken during the deployment. Sergeant Clark serves as the narrator for the images, and his captions discuss the daily life of the Soldiers living on FOB Mizan. Hanging throughout the hallway of the USAHEC's new expansion, these images will provide visitors insight into how Soldiers lived and worked while deployed. A sample of the photographs and captions is included below, but be sure to plan a visit to the USAHEC to see the full array of images and learn more about Sergeant Clark and 1st Platoon, Alpha Company, 1-4 Infantry's time in Afghanistan. Hi, my name is SGT Greg Clark and this is my Platoon - 1st Platoon, Alpha Company, 1-4 Infantry from Hohenfels, Germany. We deployedto Afghanistan July 2007 - March 2008, when I was PFC Clark, and was a High-Mobility Multipurpose Wheeled Vehicle (HMMWV or Humvee) Gunner for my squad leader's truck. These photos will show you what life was like on a small Forward Operating Base (FOB) in the Mizan District of southeast Afghanistan. 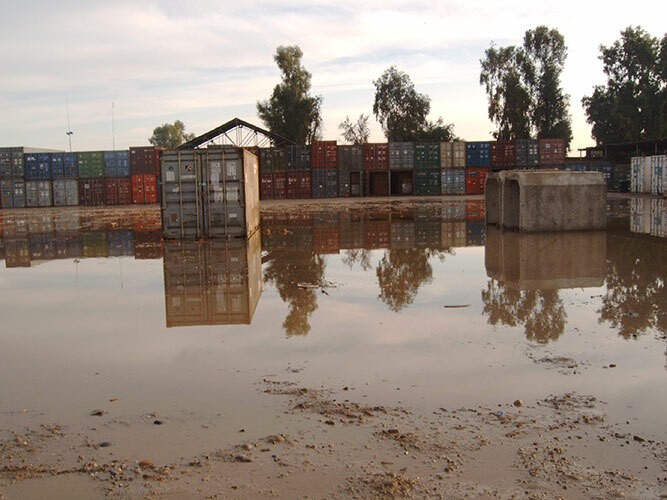 We received a lot of our supplies through Container Delivery System (CDS) drops. A C-130 or C-17 would fly over an open area and push out packages hooked to parachutes, which would hopefully float to the ground in the designated area. This almost never went as planned, so we usually spent a whole day finding and picking up all the supplies, whether the package burned in (crashed to the ground because the parachute did not open) or missed the target. This picture was taken from an Afghan National Army (ANA) observation post (OP) on a hill outside our FOB. 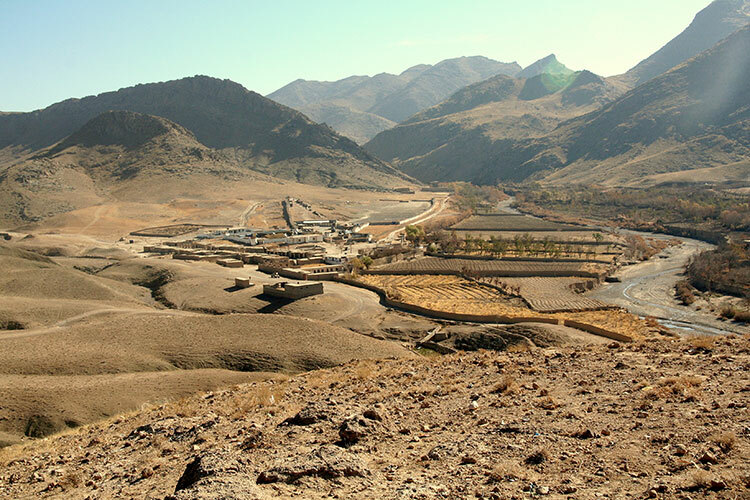 The FOB is in the center, the town bazaar is on the left, the Afghan National Police (ANP) station is to the right, and the Arghandab Riverbed is on the far right. You can also see how we are surrounded by mountains, with almost no flat ground. 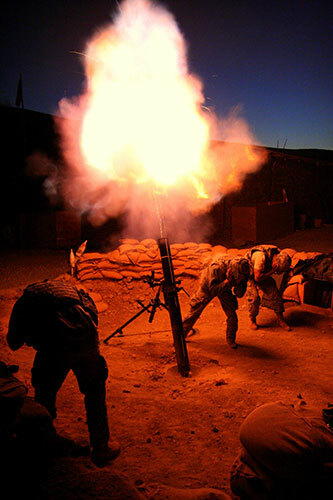 Our FOB's 120MM mortar system supported us with indirect fire while on mission or on base security. The mortar men could fire HE (High Explosive), WP (White Phosphorus), Illume, and Infrared rounds that would light up the night sky. In this photo, a round exits the tube at night in support of a mission outside the wire. Our rooms were essentially two rows of three bunk beds, back-to-back with a Soldier on top and bottom and a shelf in between if there was room. The beds were separated by a three foot wide walkway, and seven guys shared a living space, roughly 20' X 9'. We conducted some of our missions on foot. This winter day was particularly cold, but we needed to locate a reported IED, placed in an area we occasionally set up mounted and dismounted observation posts (OPs). After a long hike, our Afghan National Police (ANP) Chief found the IED, and we called for the trucks to come out and help dispose of it.